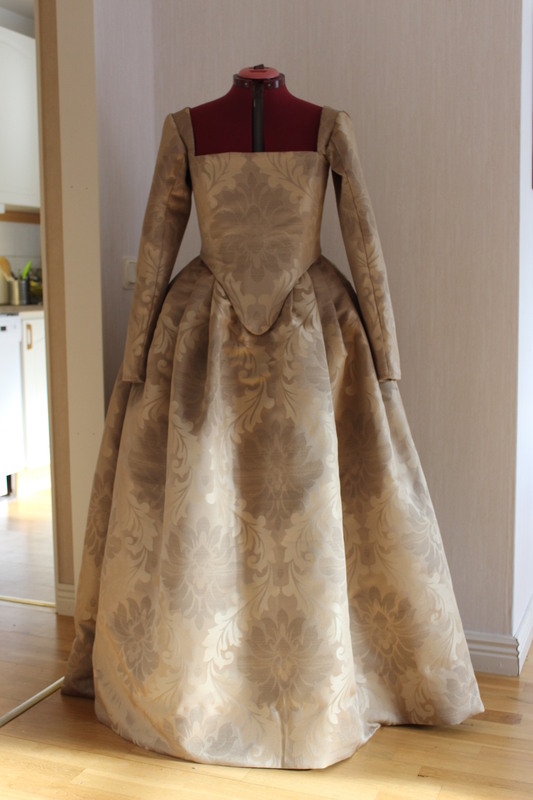 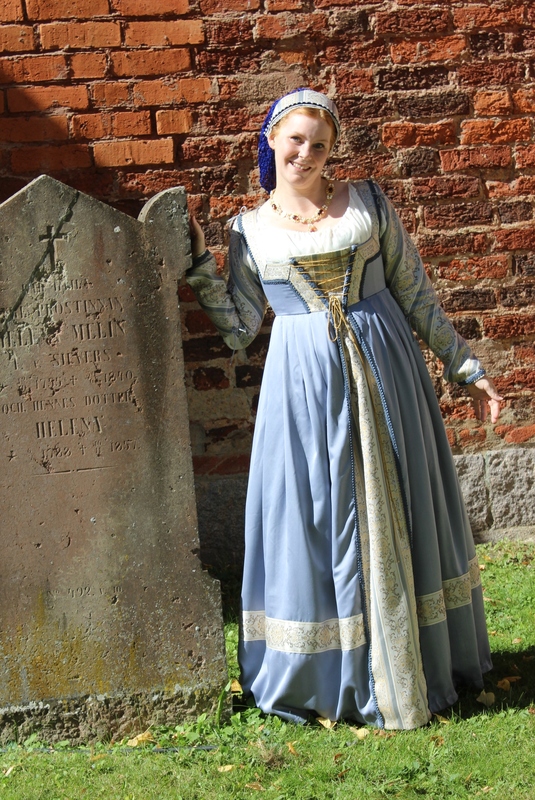 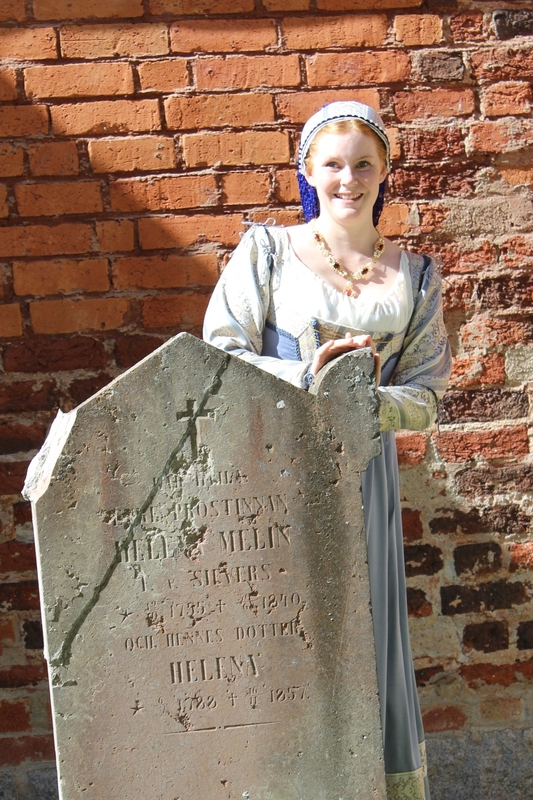 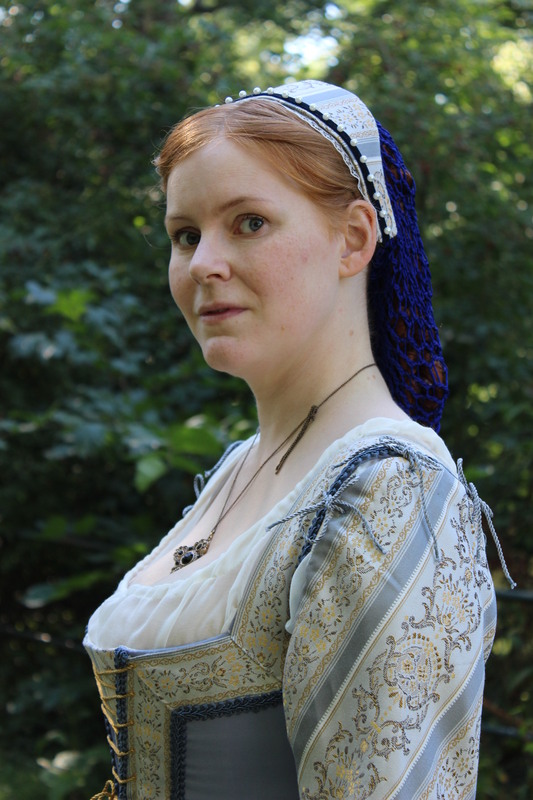 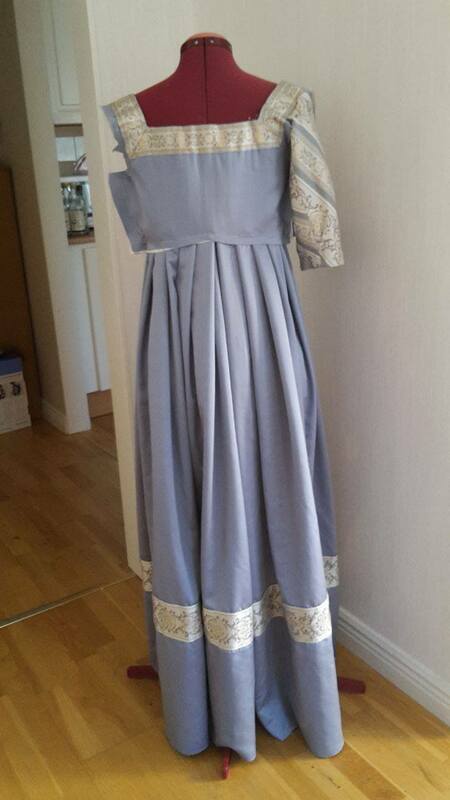 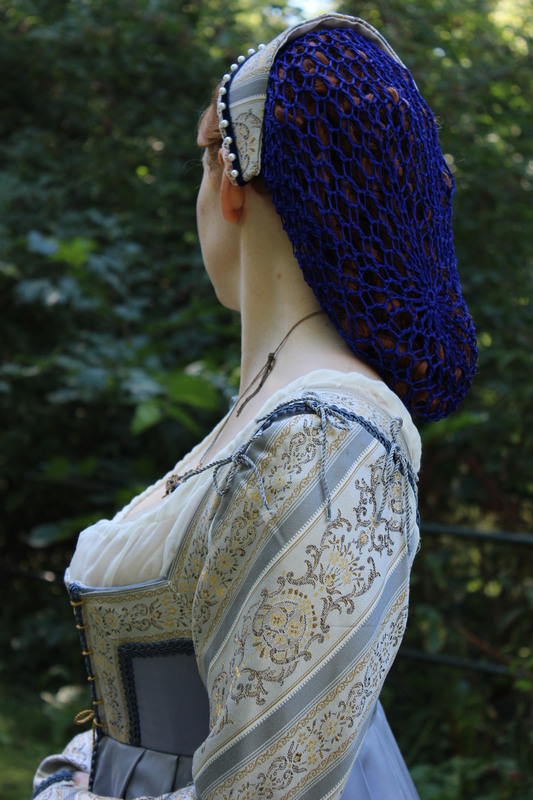 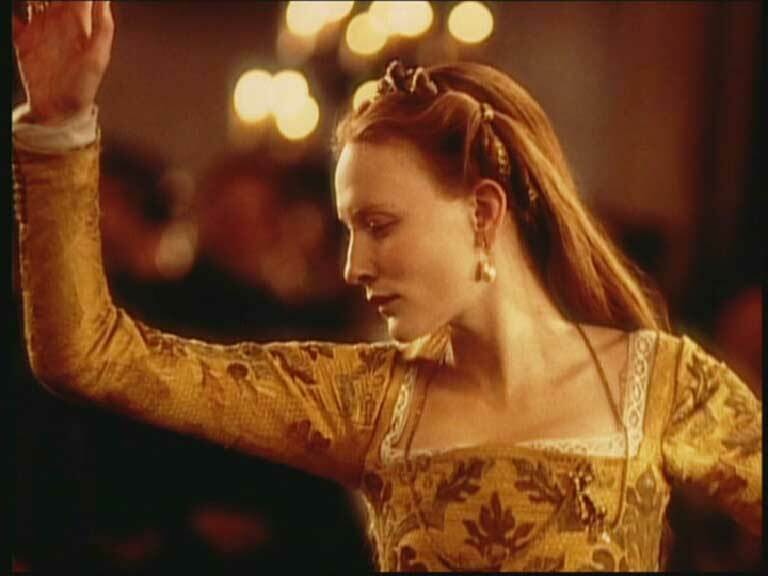 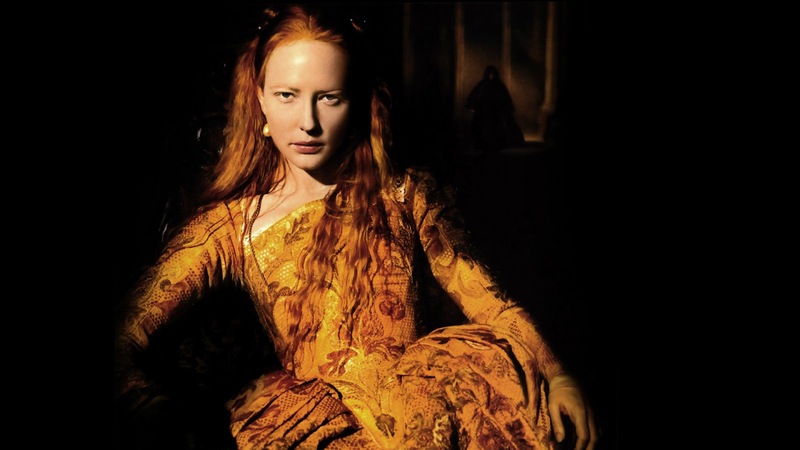 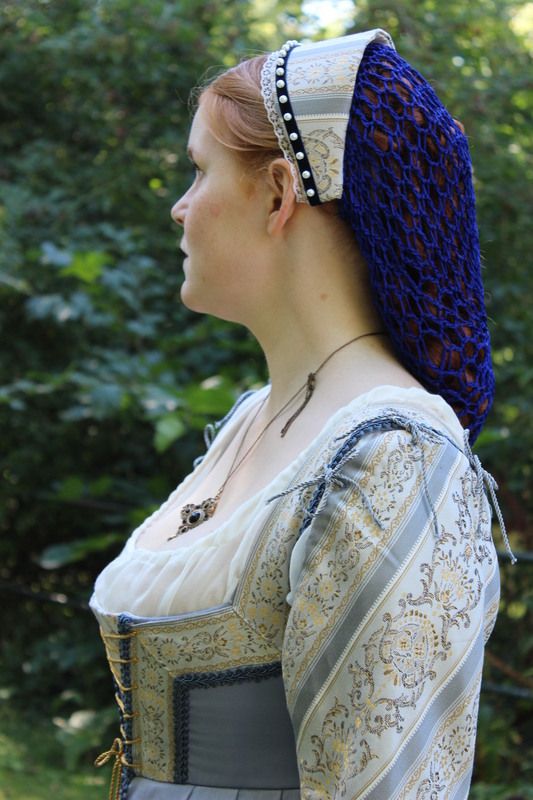 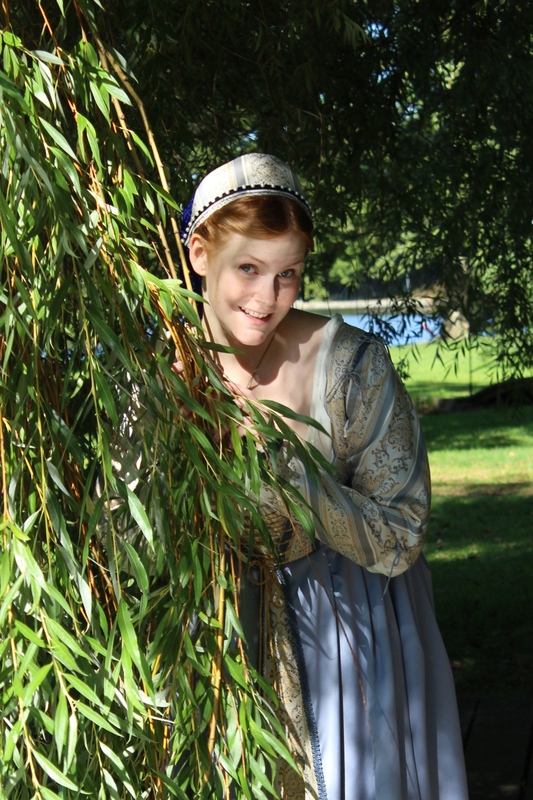 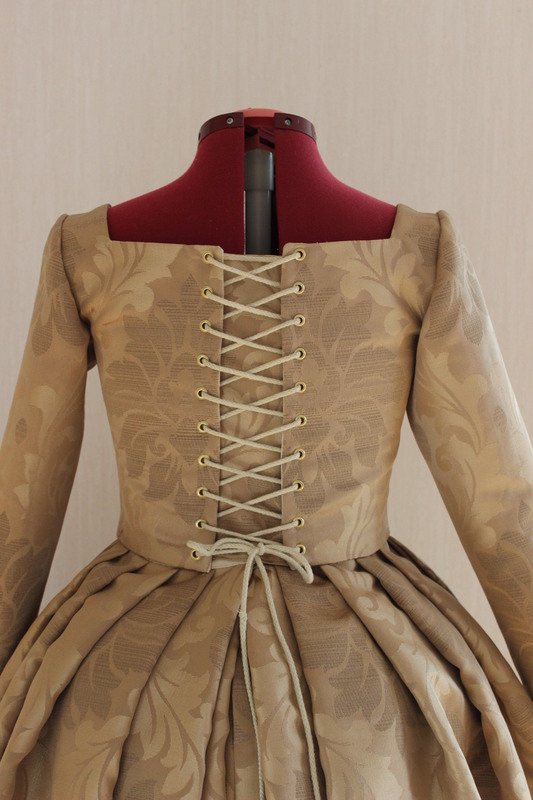 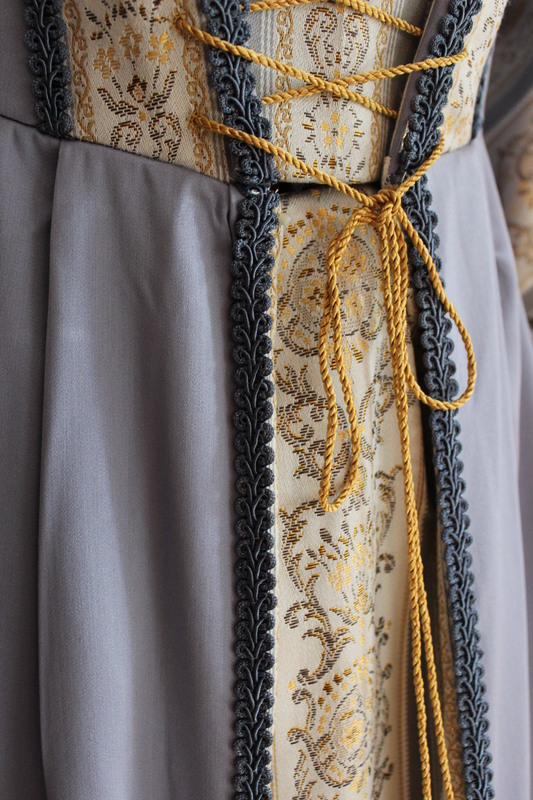 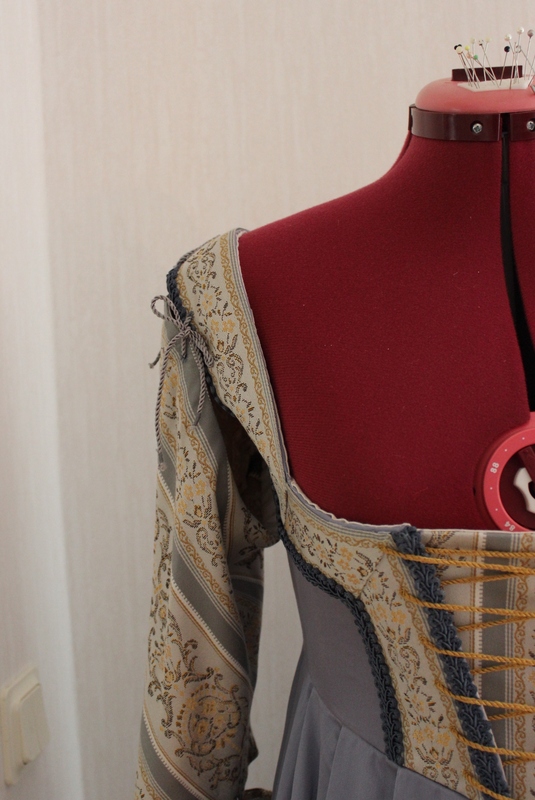 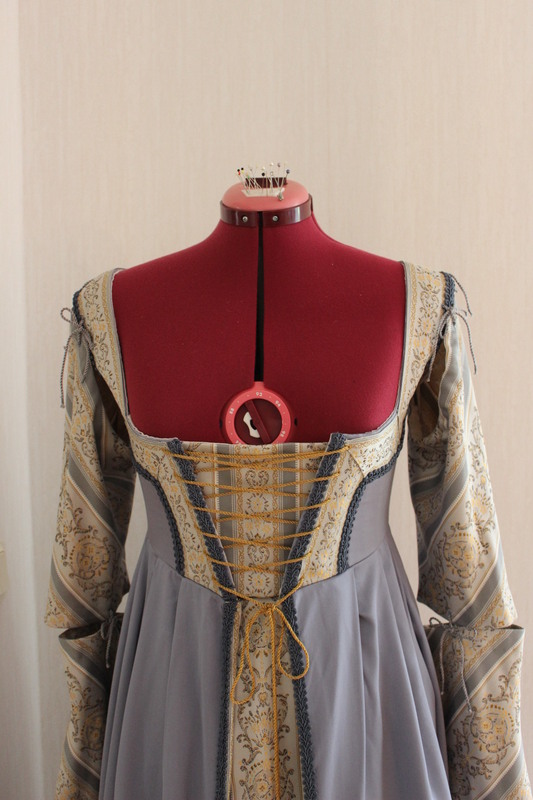 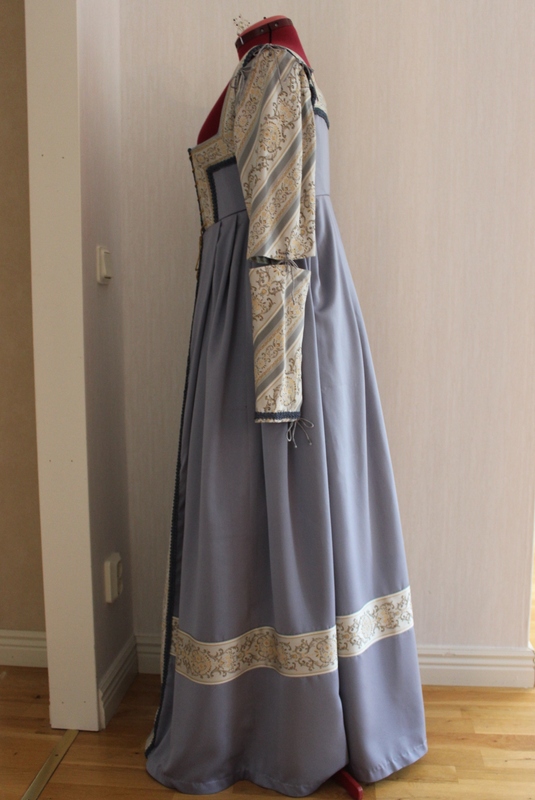 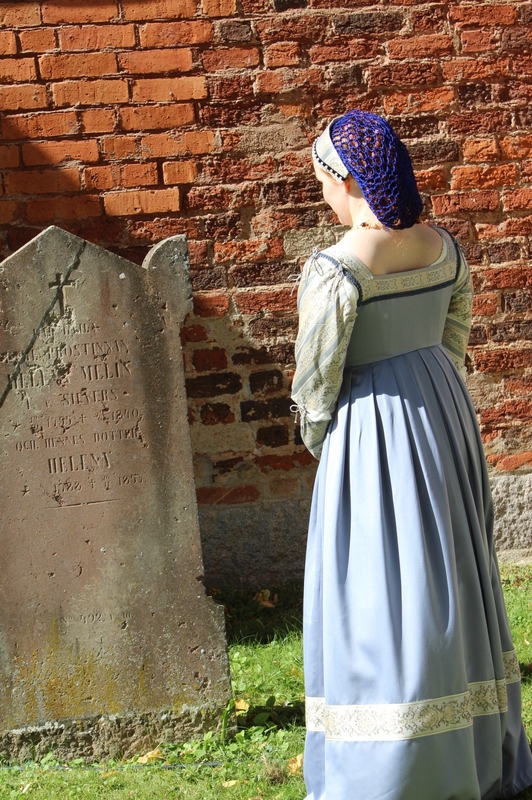 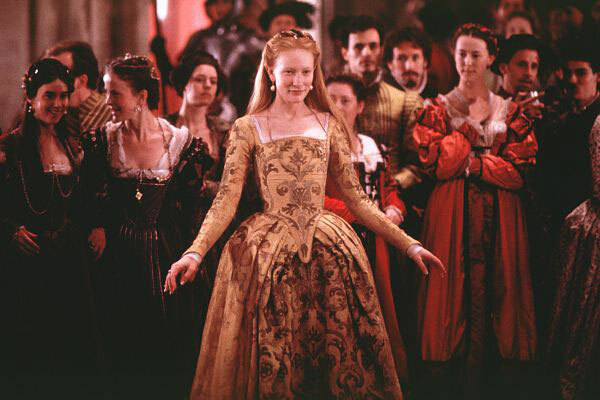 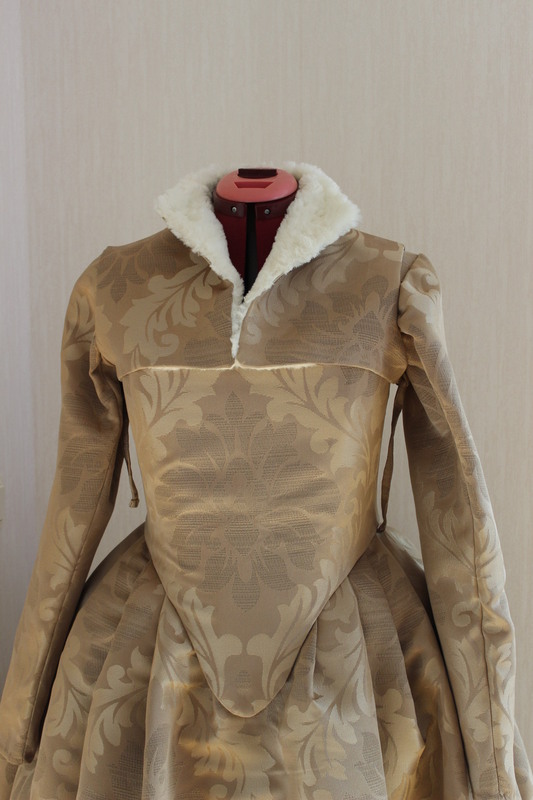 As mentioned in my previous post (Elizabeth I – costume analysis) I’ve wanted to make this dress for years, and now I finally have. 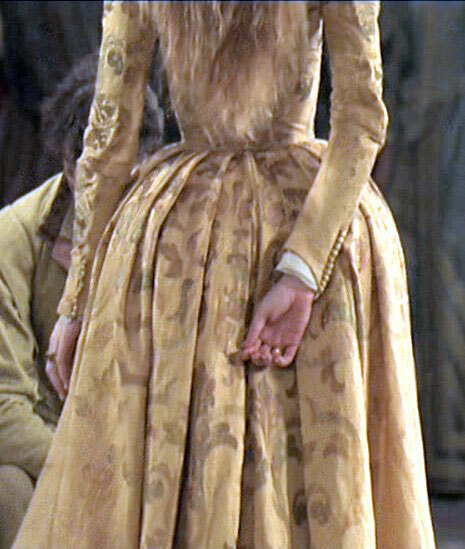 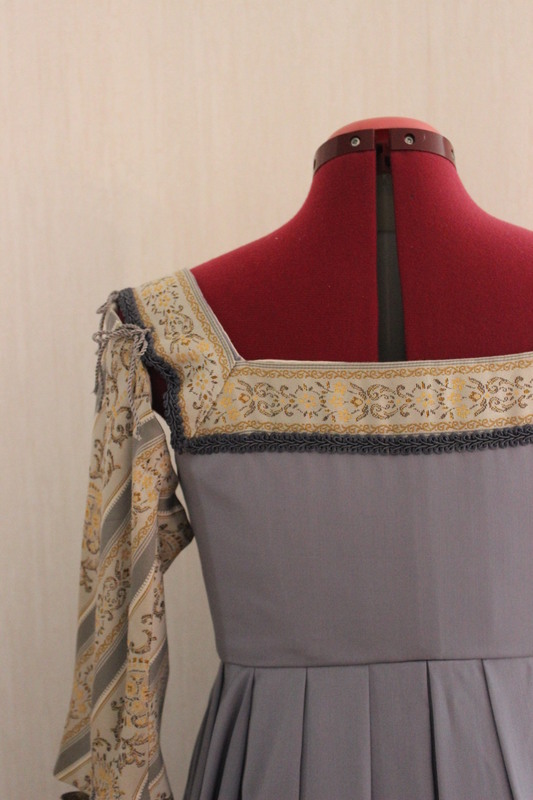 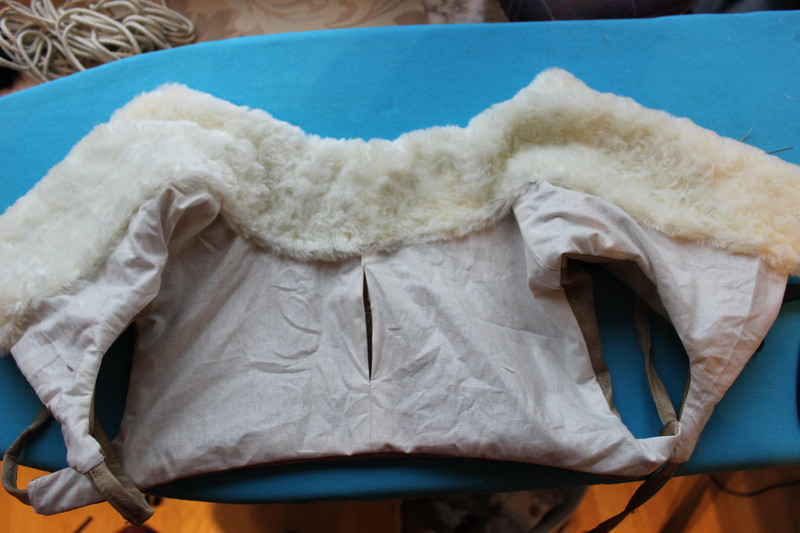 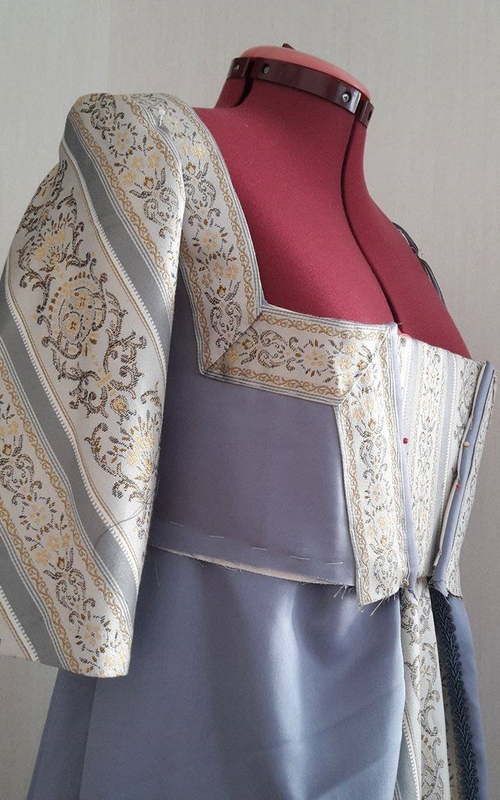 I used the pattern for the “Dorothea Body” from “The Tudor Tailor” for the bodice and cut a mock-up from a plain cotton sheet. 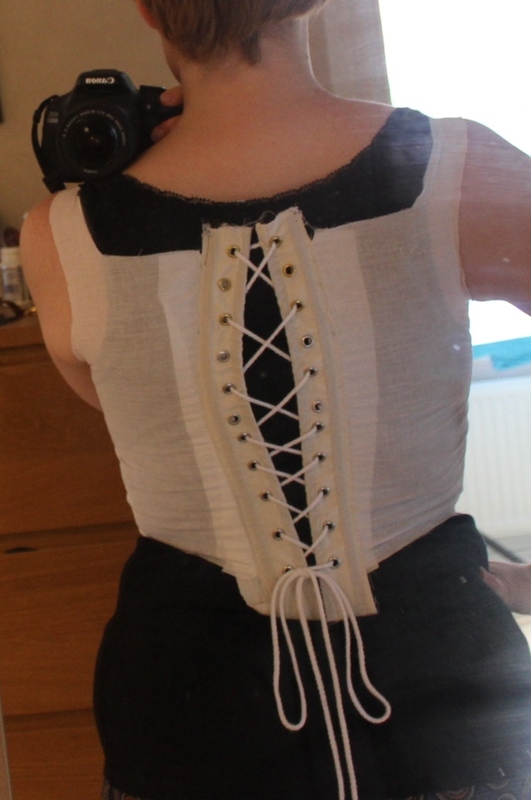 I added some bones and a plastic ruler down the front, and put it on. 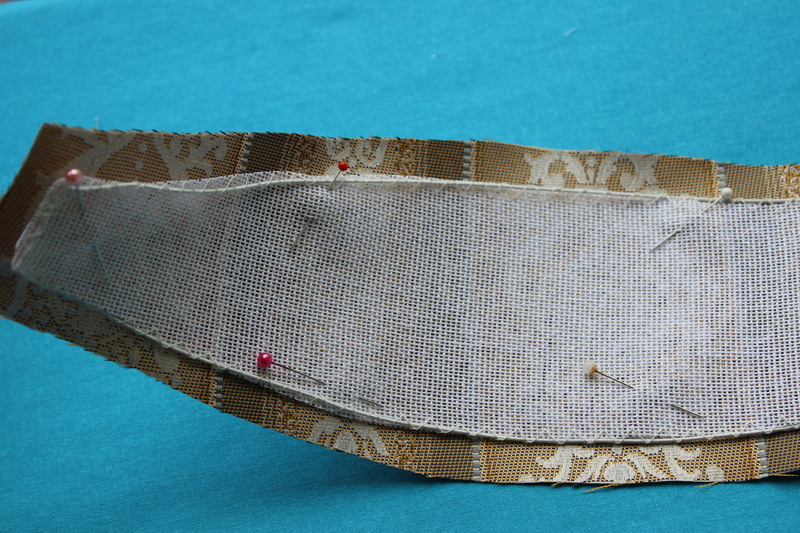 The it was really good (ignore the bad lacing at center back), and I felt it would give me the flat, conical shape I wanted. 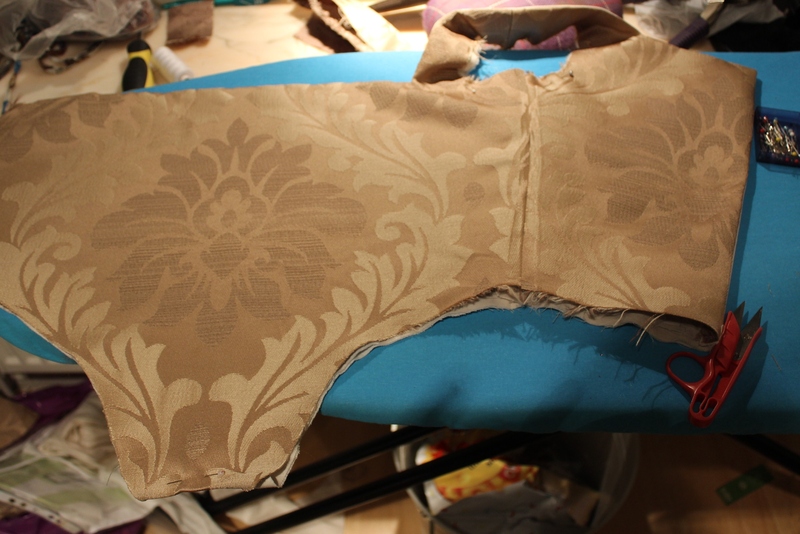 Then I cut the fabric carefully placing the motifs in the perfect spots for each piece. 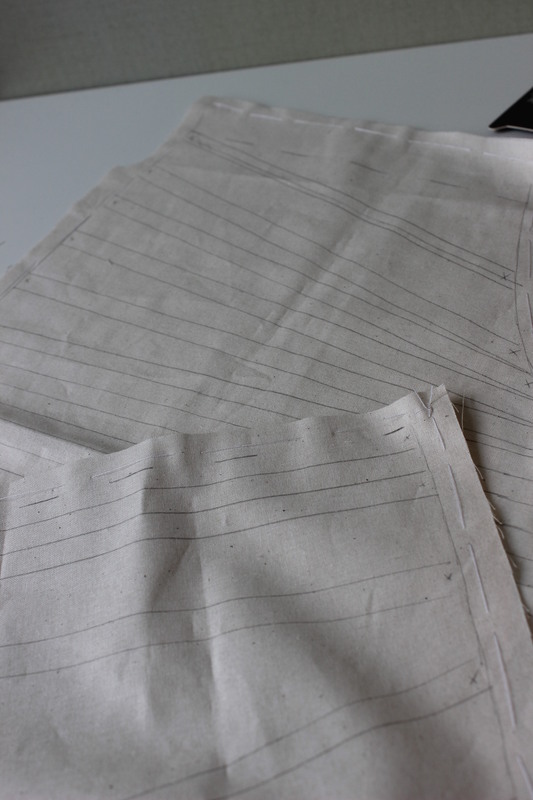 Cutting the sleeves, making sure the pattern placement matches on both left to right sleeve. 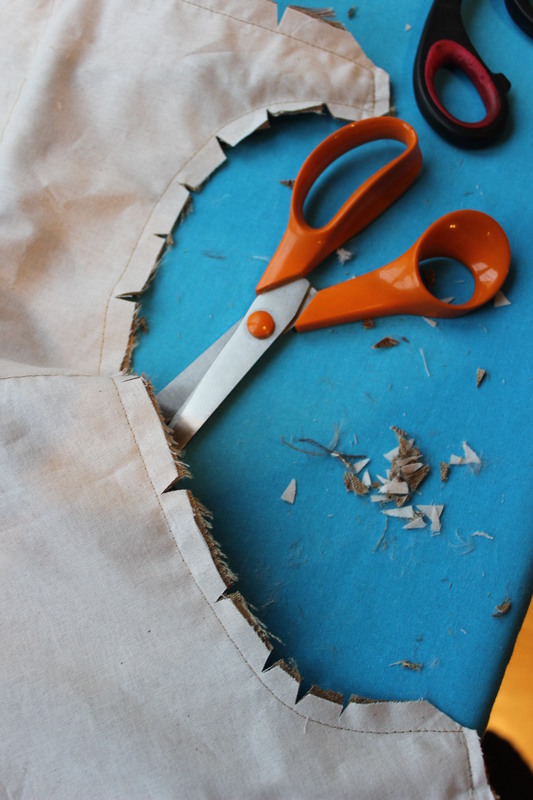 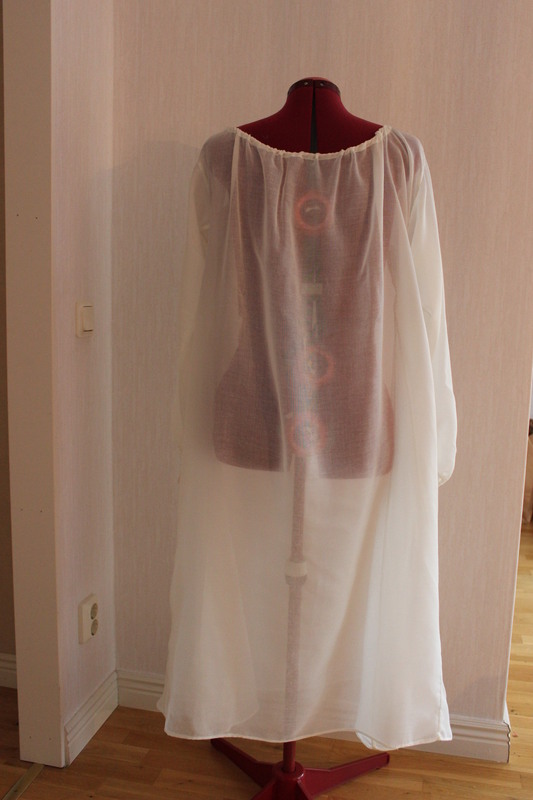 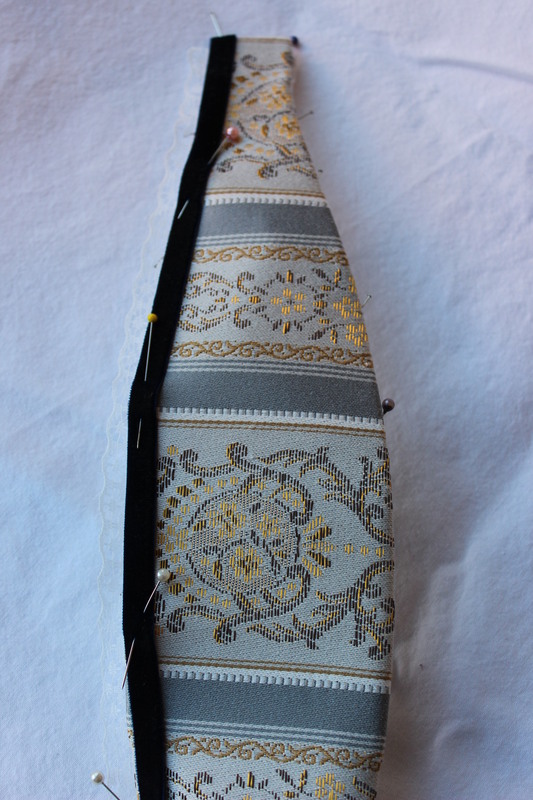 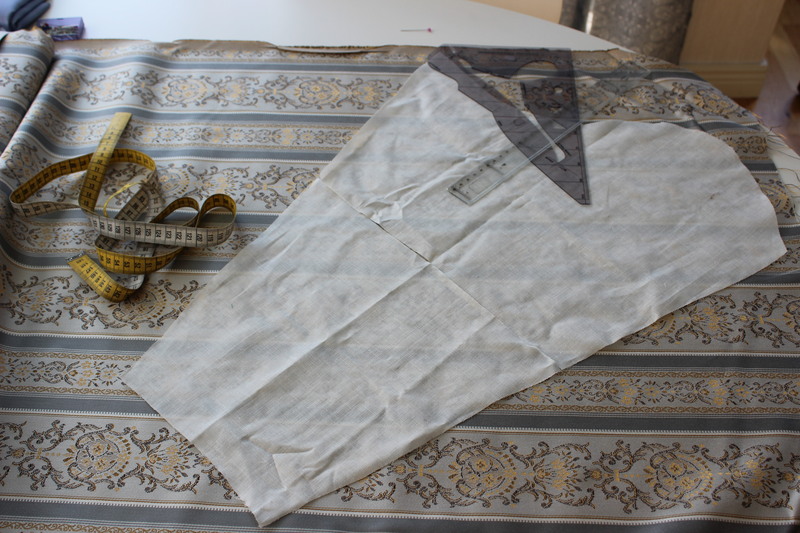 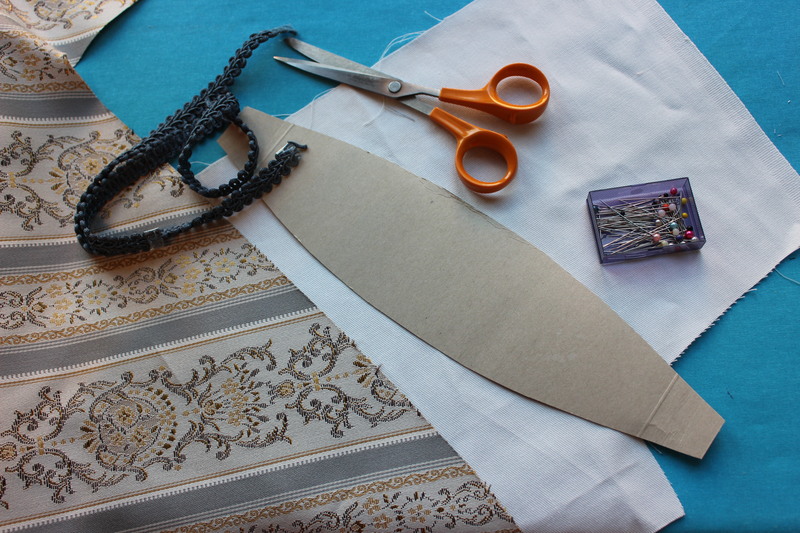 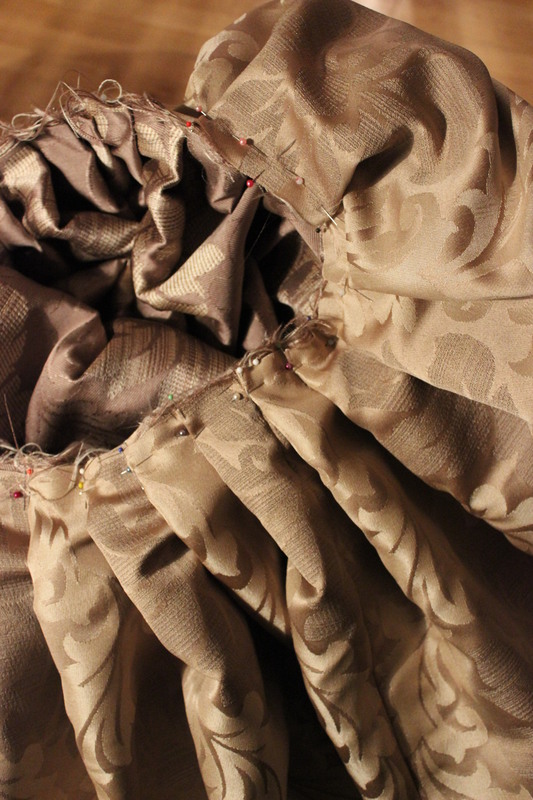 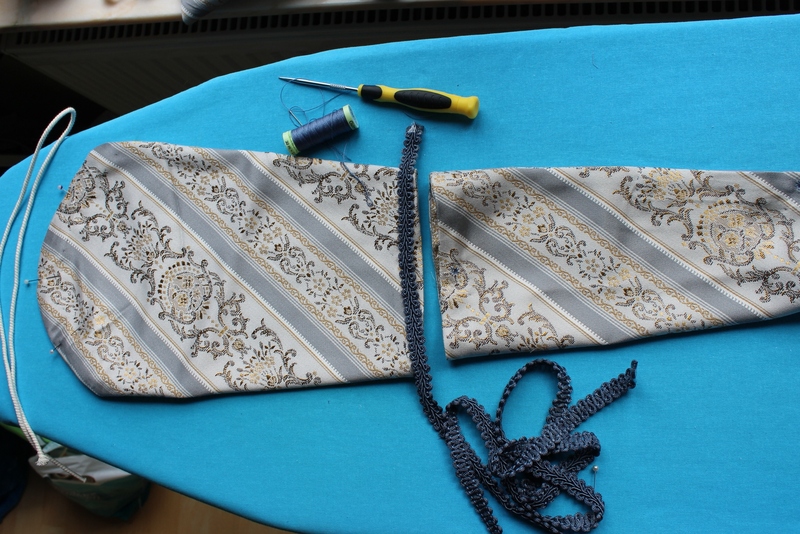 As usual I started with the skirt, pinning and sewing the three widths of fabric together to a giant tube. 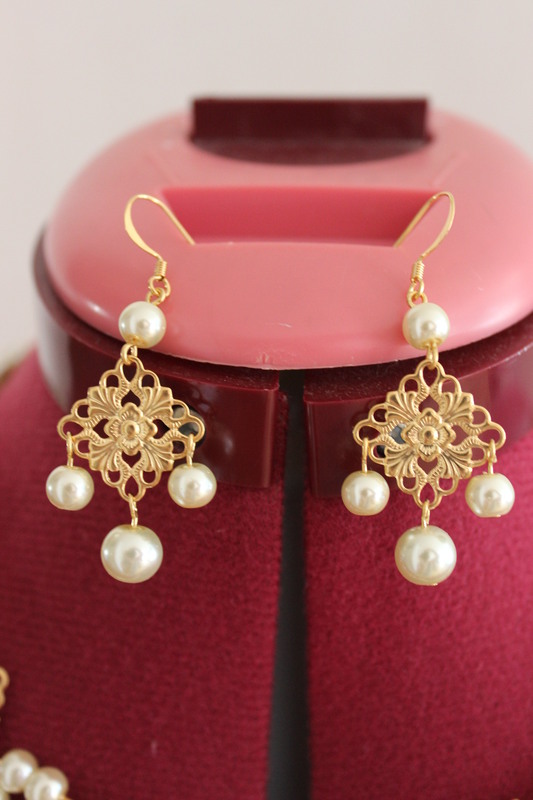 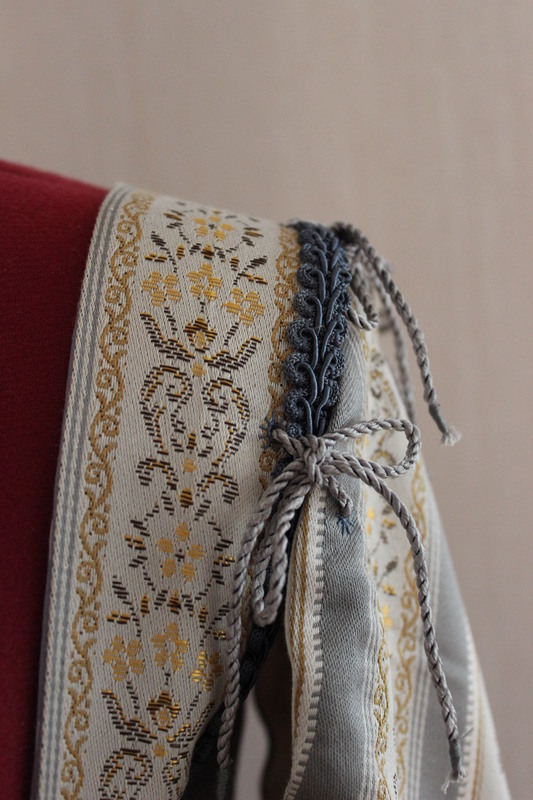 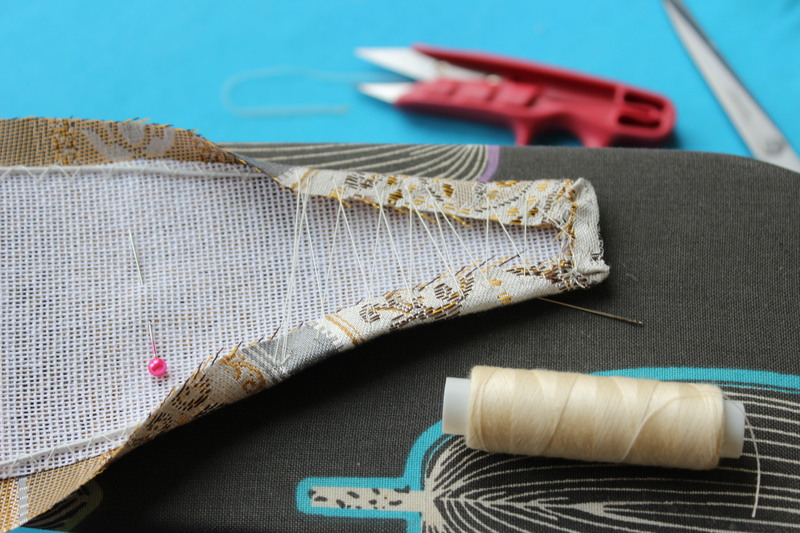 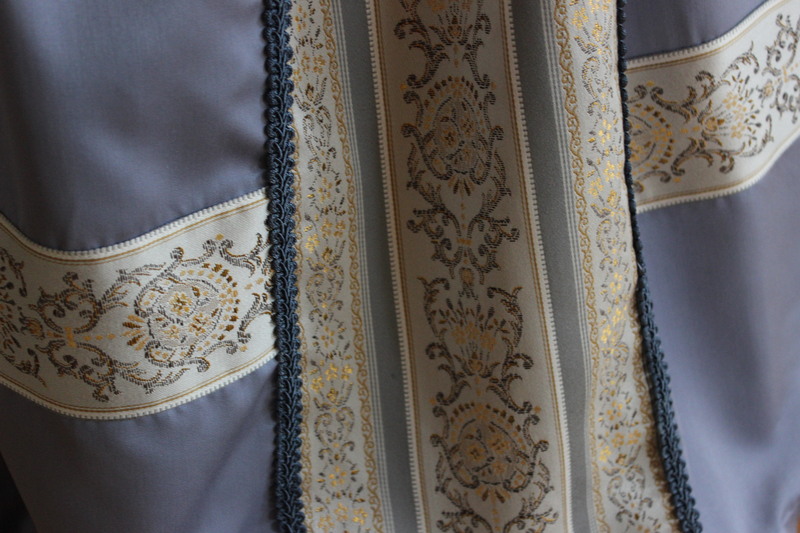 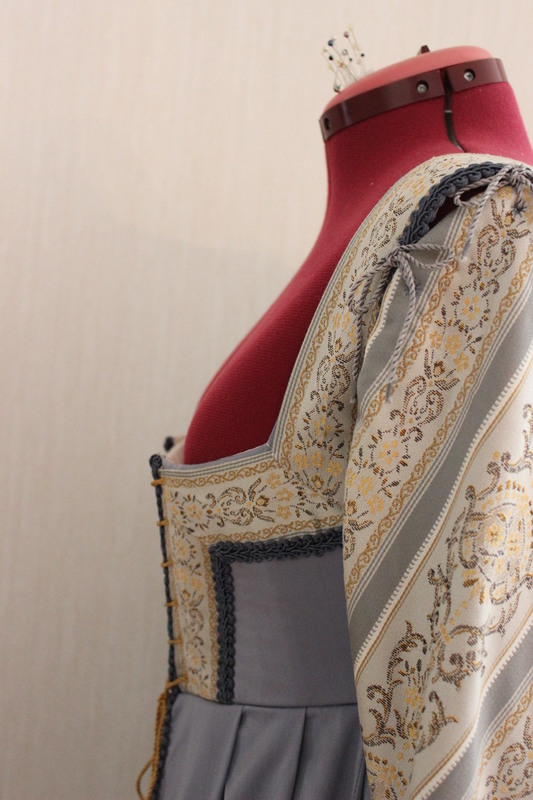 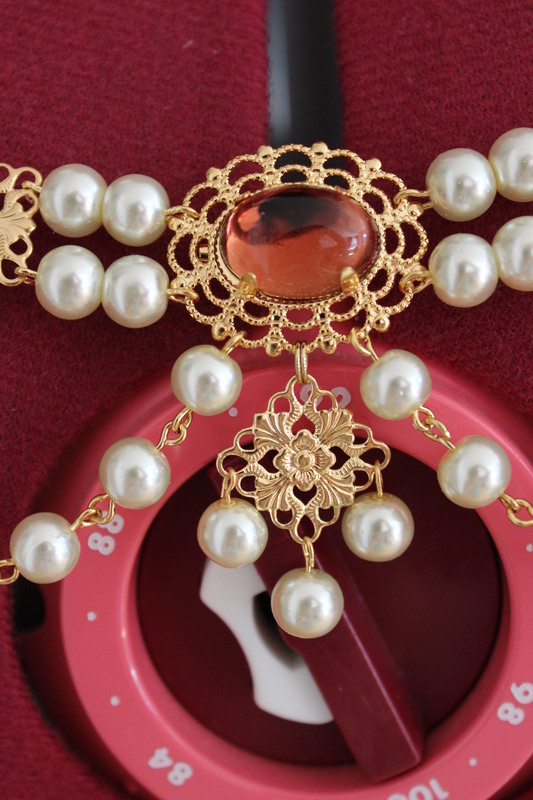 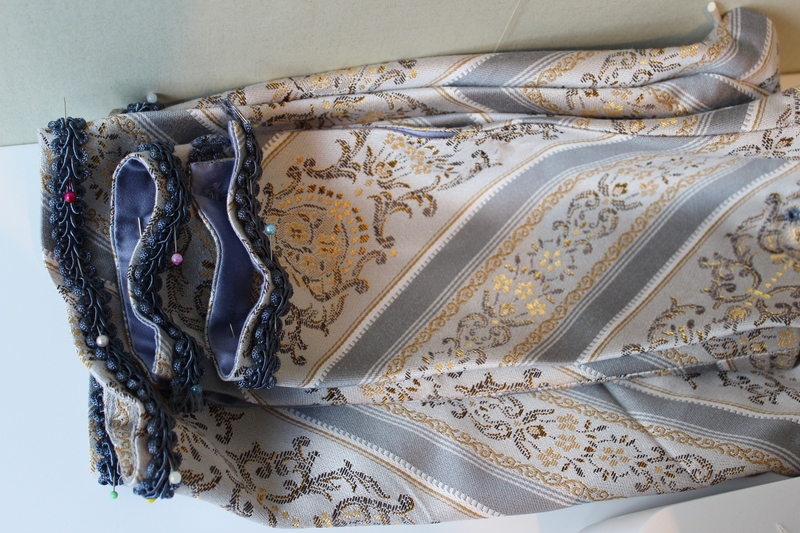 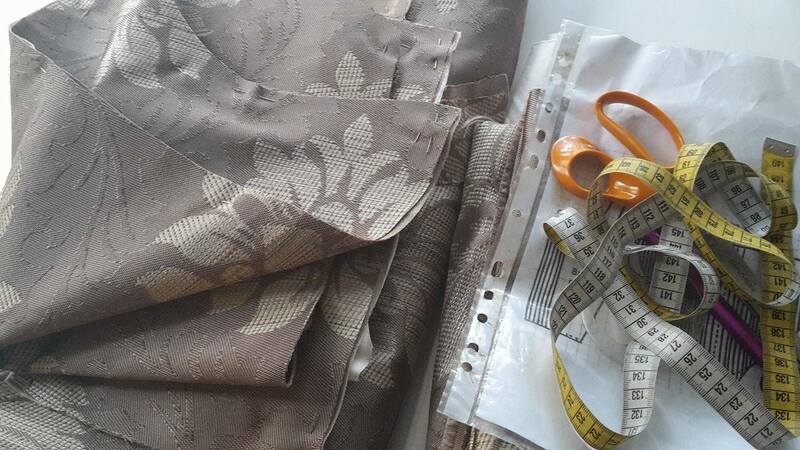 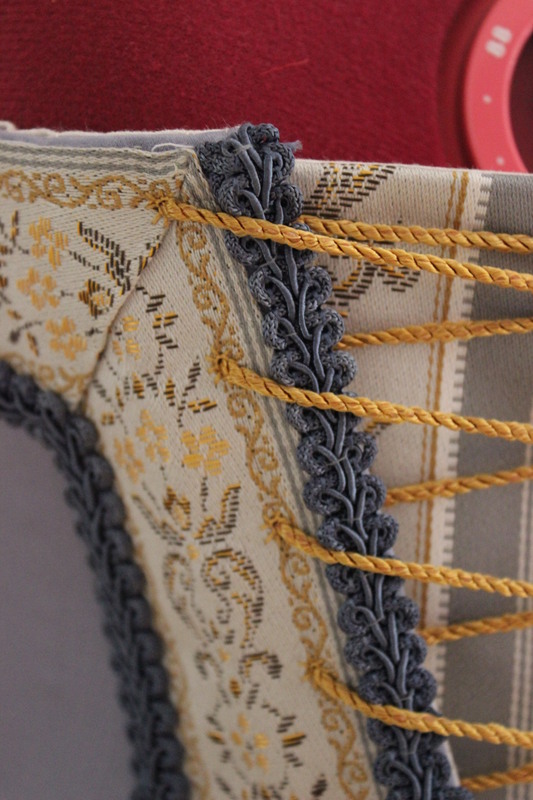 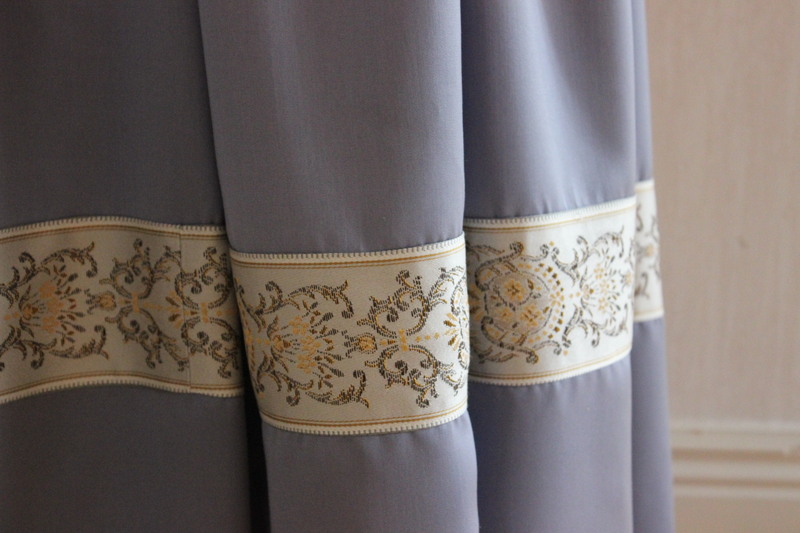 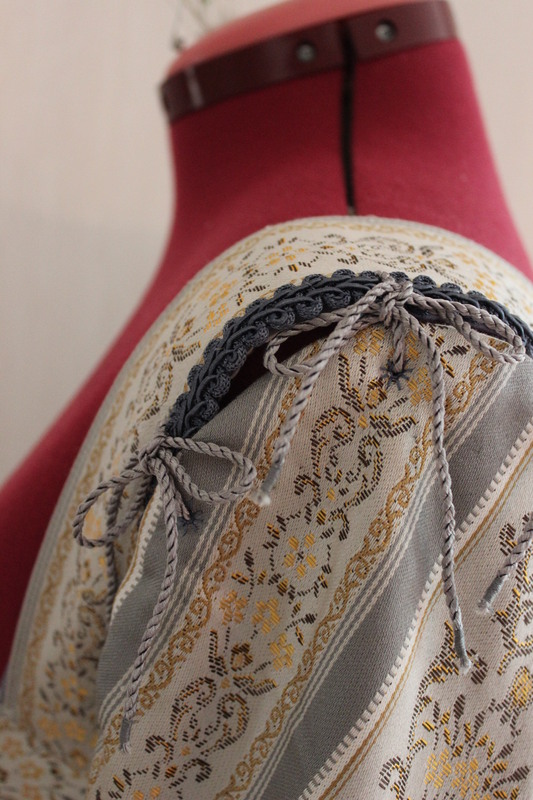 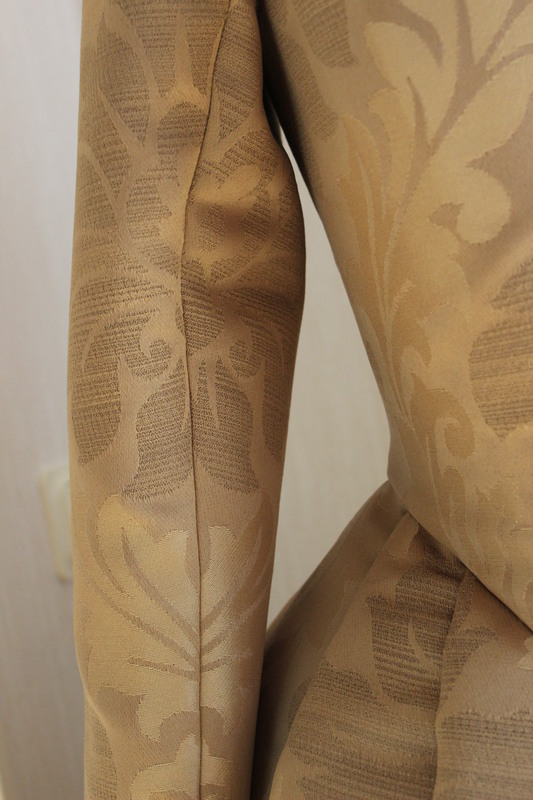 Carefully matching the motifs at the seams. 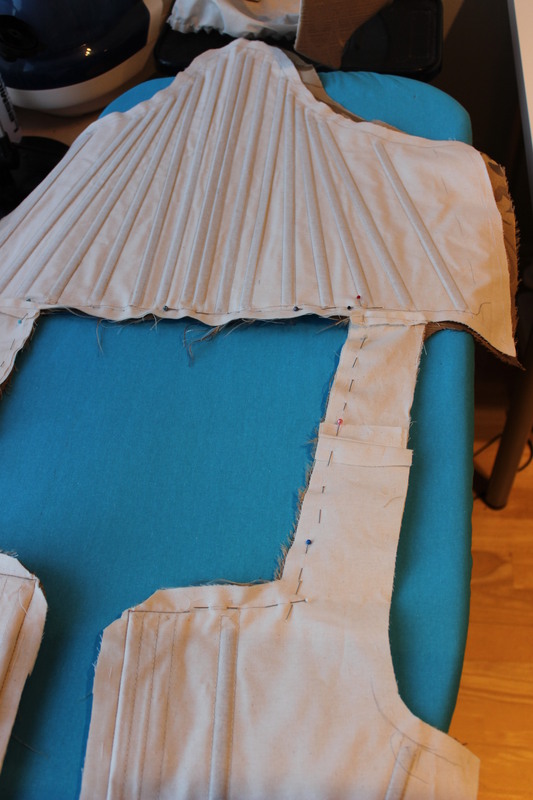 Then I pleated and pinned the upper edge to my waist measurement, leaving an opening at center back. 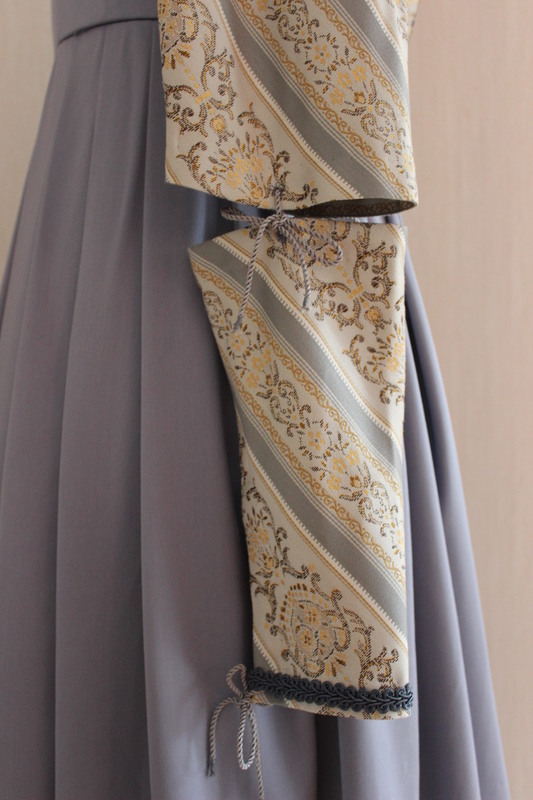 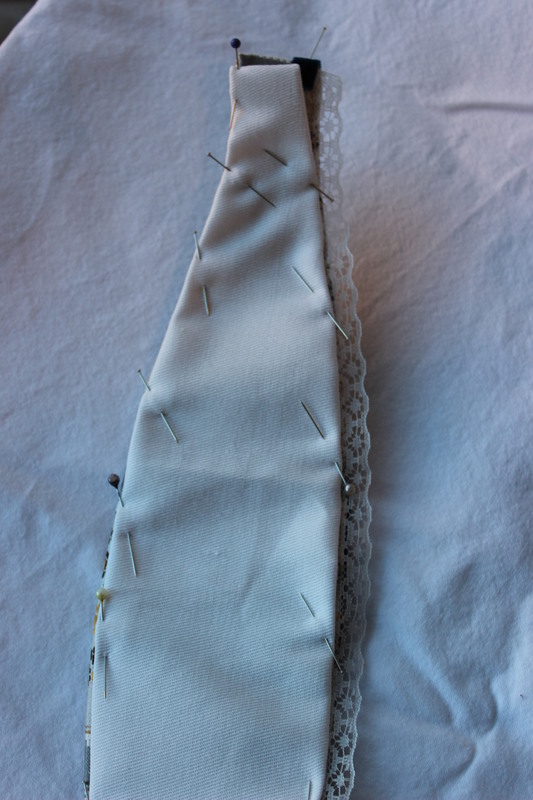 I then stitched a piece of cotton ribbon to the top as a waistband, sewed on a hook and eye and put the whole thing on my dress-form (over bumpad and several petticoats, of course) to pin the hem. 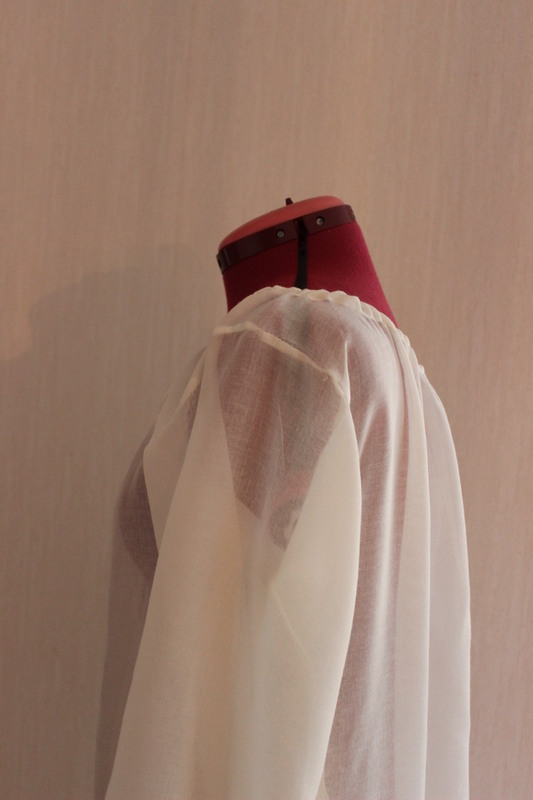 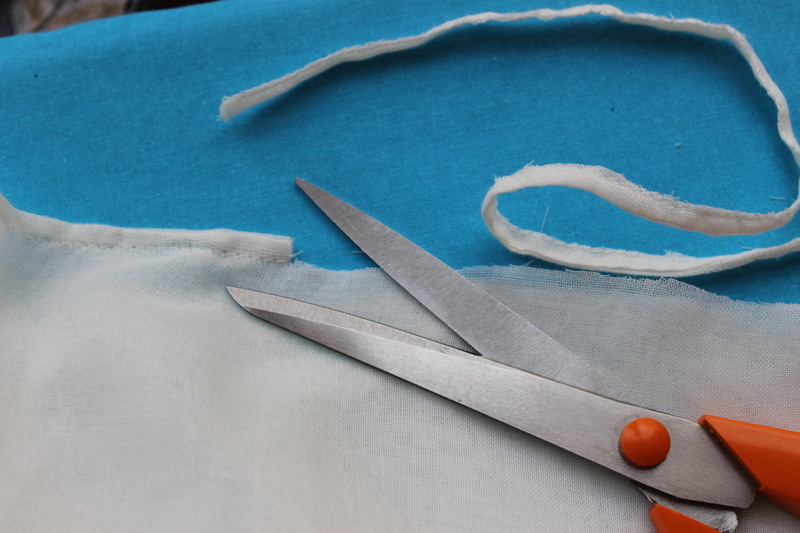 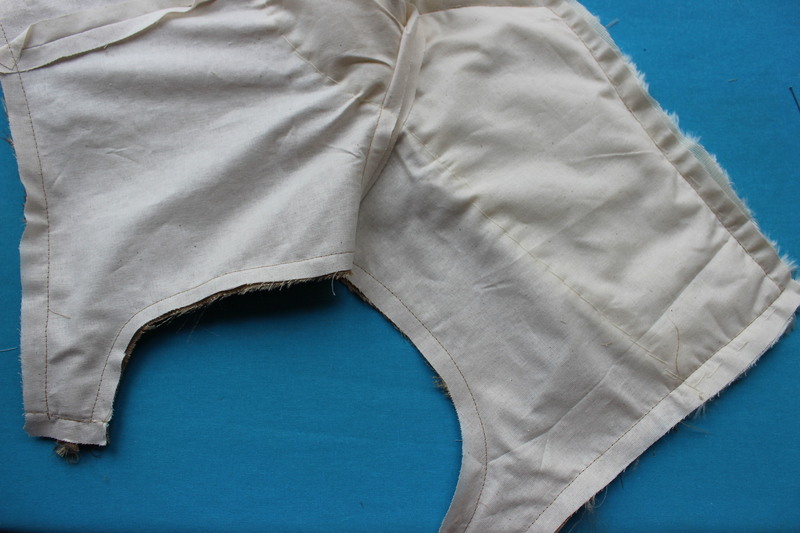 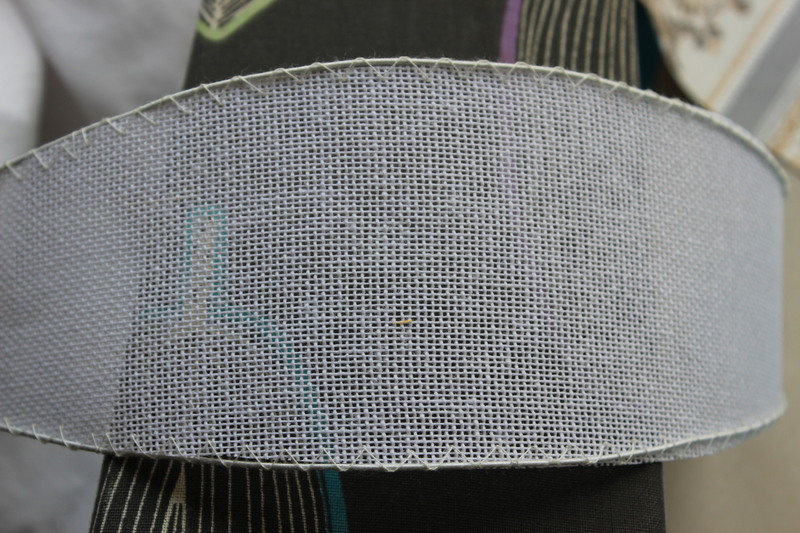 I cut and stitched the hem using 15 cm wide pieces of cotton fabric to the inside. 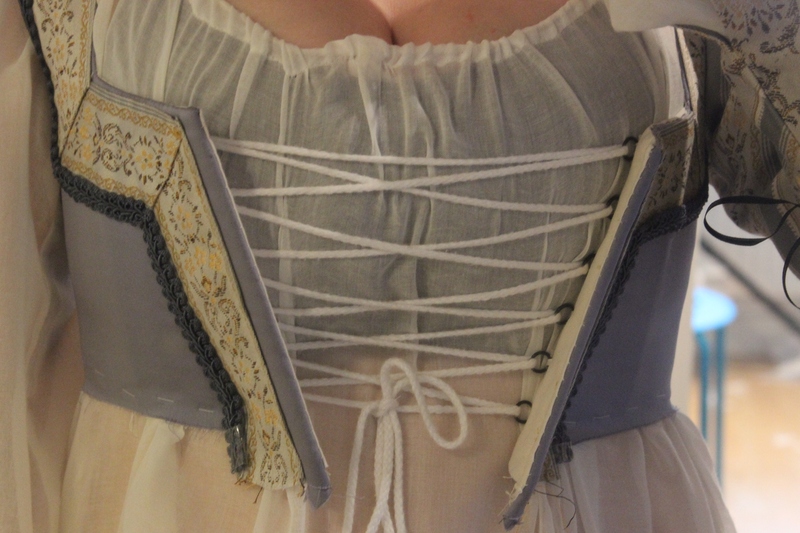 Then it was time for the bodice. 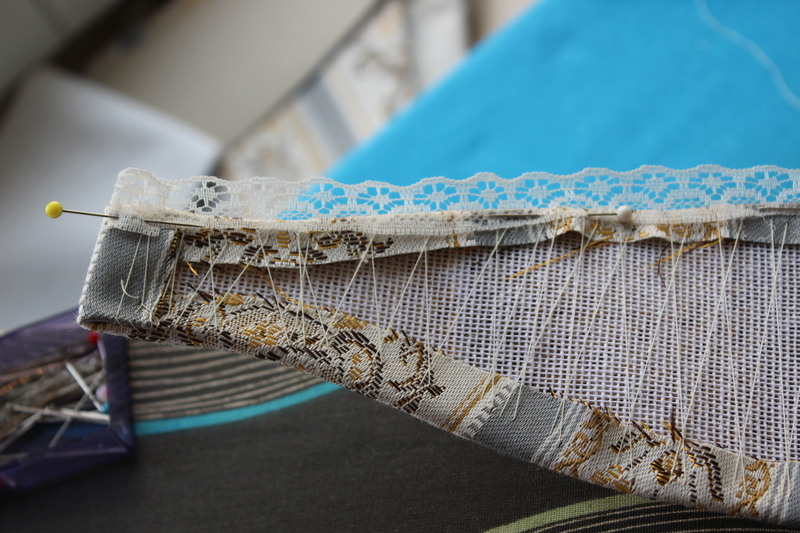 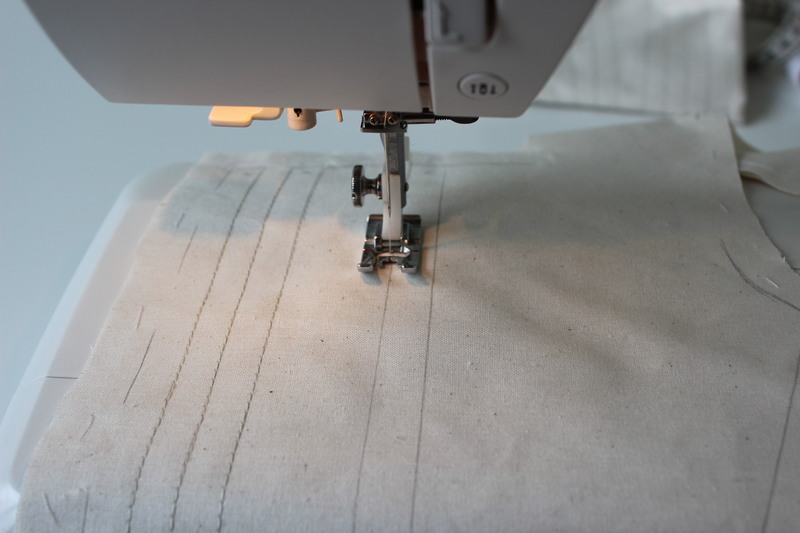 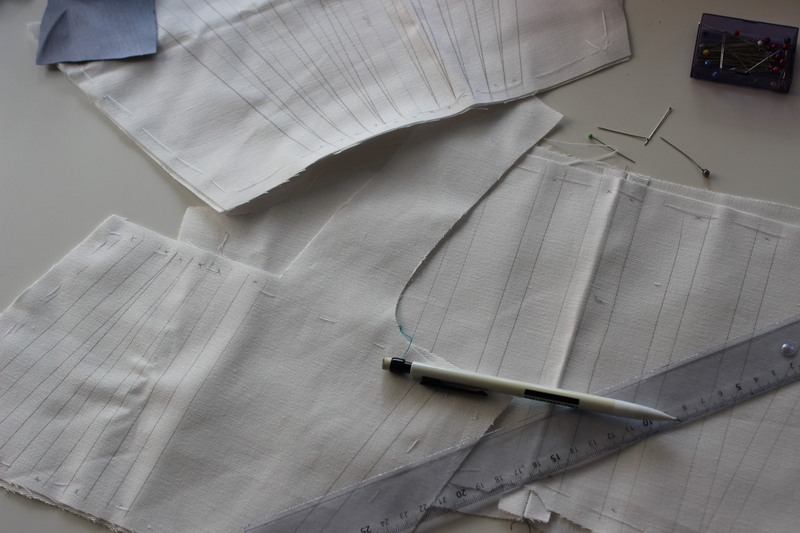 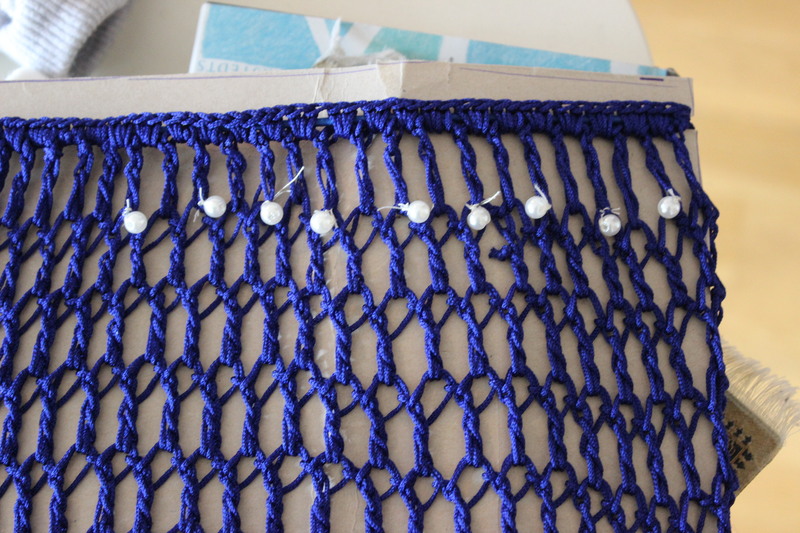 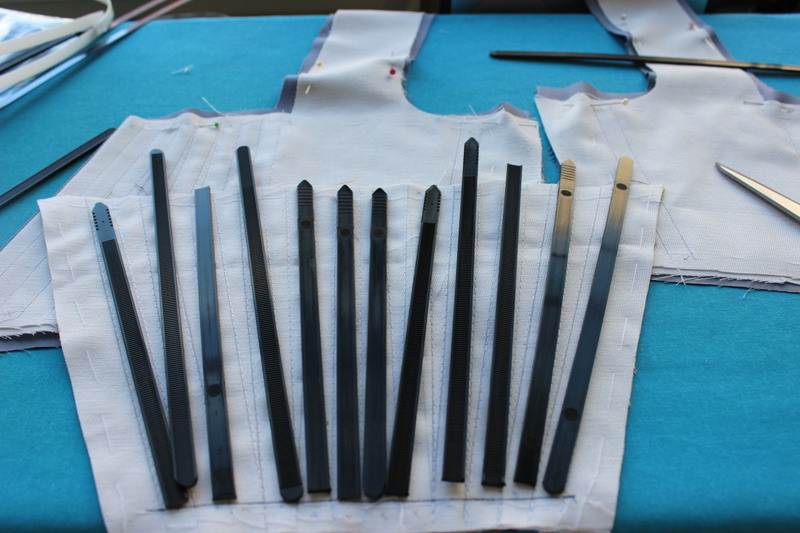 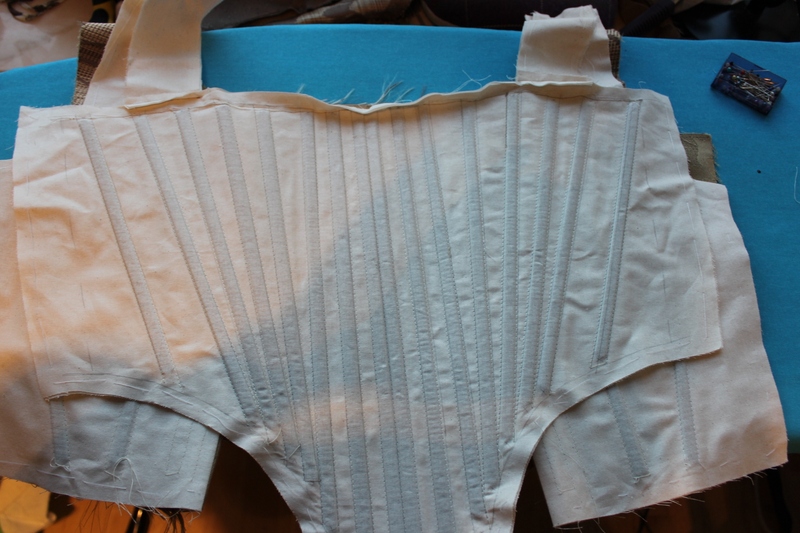 I started by marking and stitching the boning channels to the interlining and lining, after basting hem together. 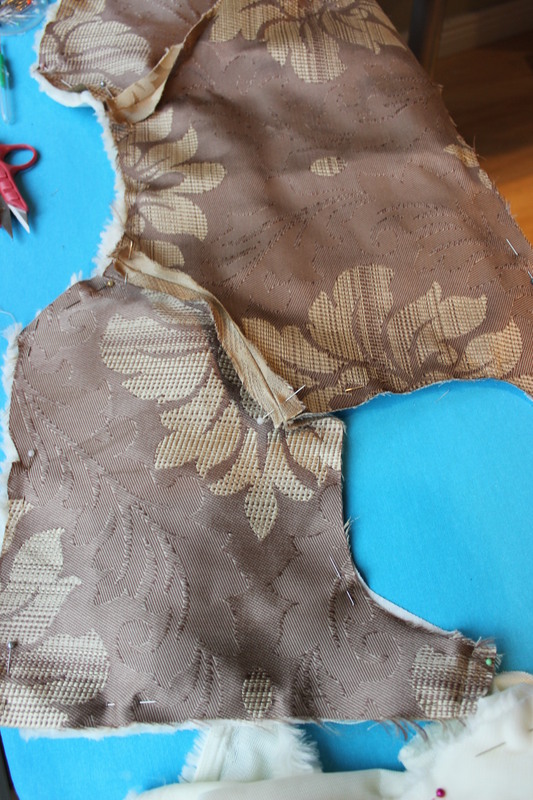 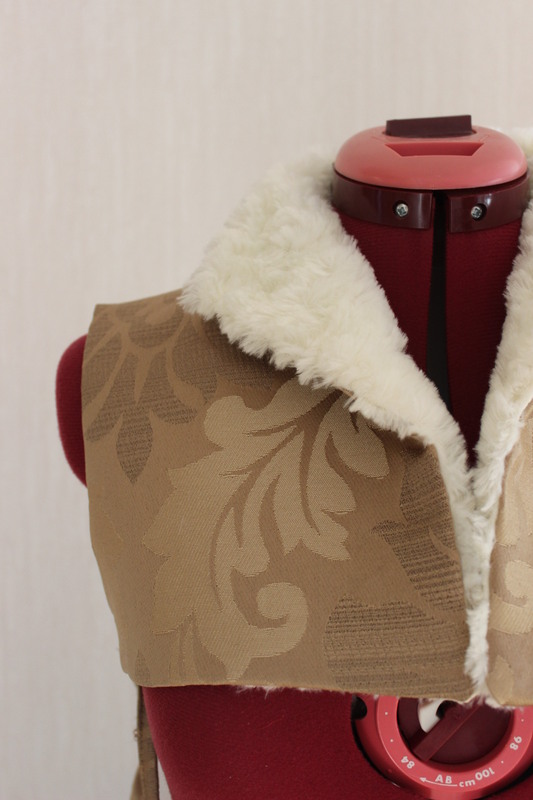 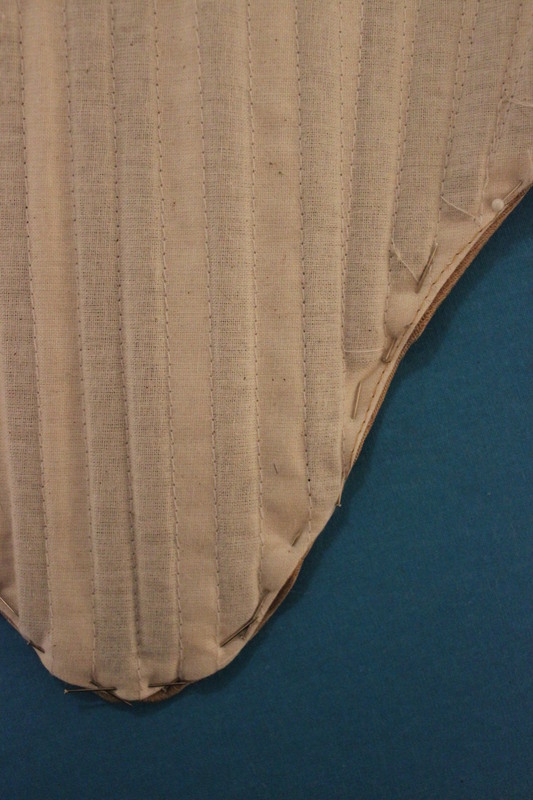 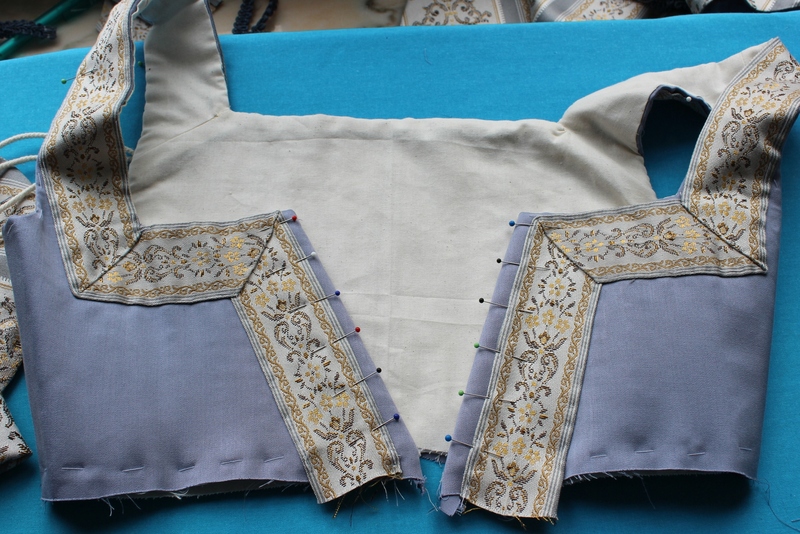 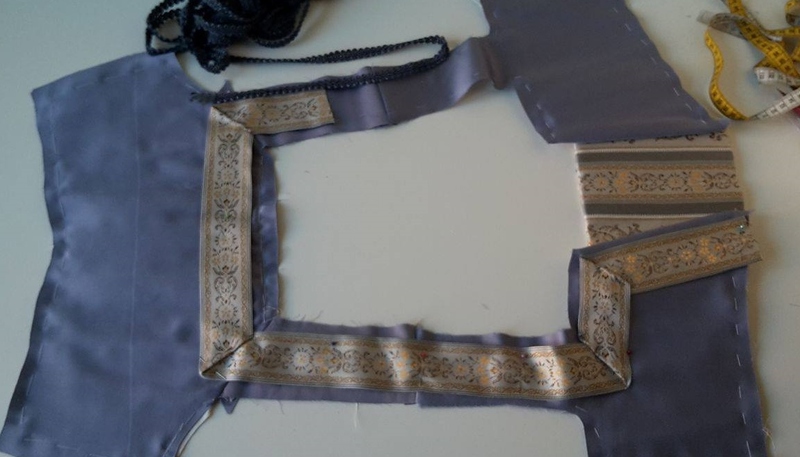 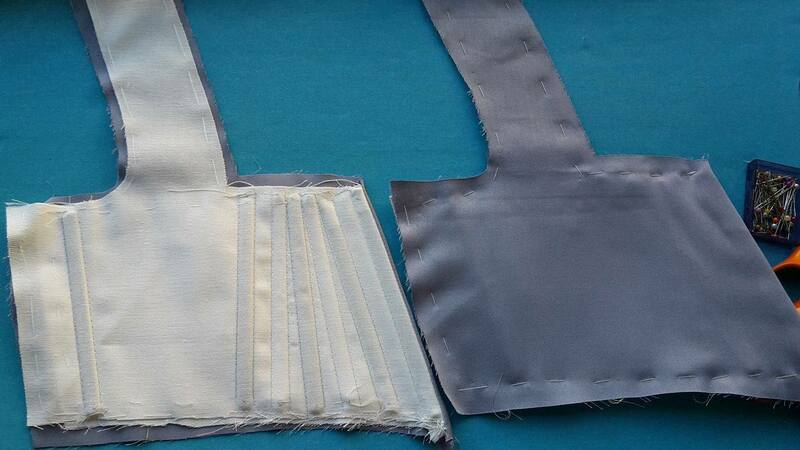 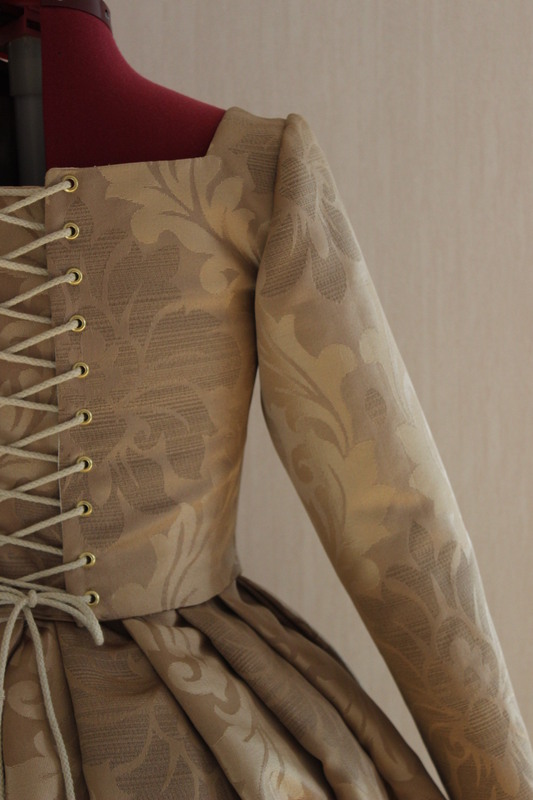 Lots of channels to give the right shape to the bodice. 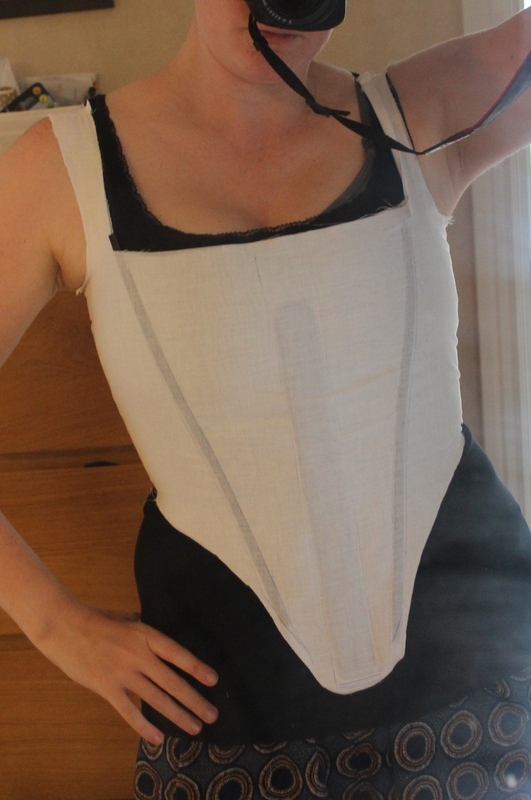 I added the bones made from plastic zip ties. 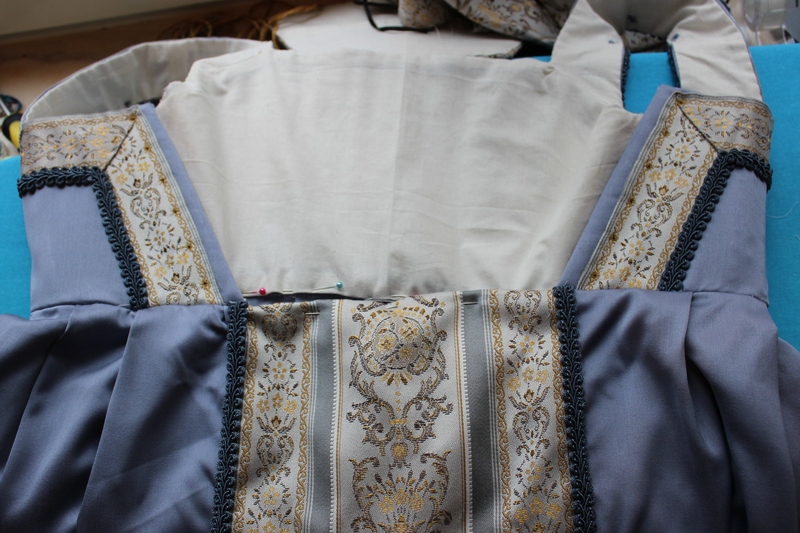 Then I stitched the shoulder-straps together and pinned the wrong sided of the fashion fabric to the interning, and stitched the neckline together. 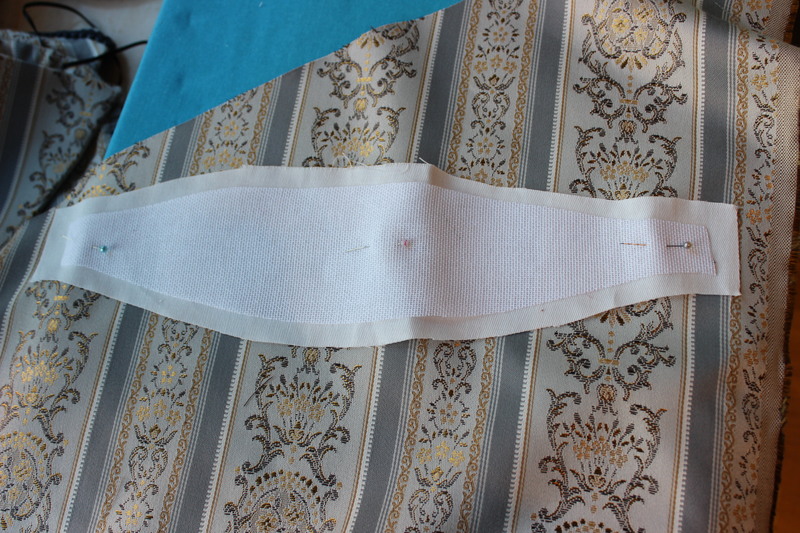 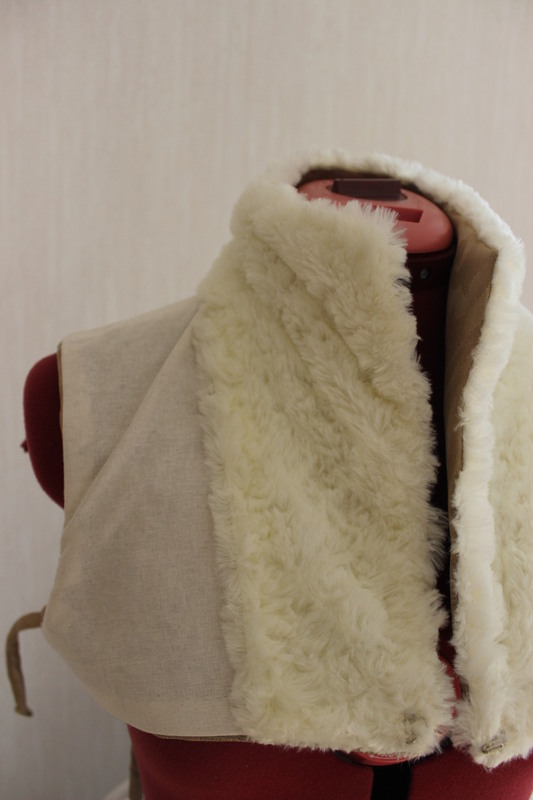 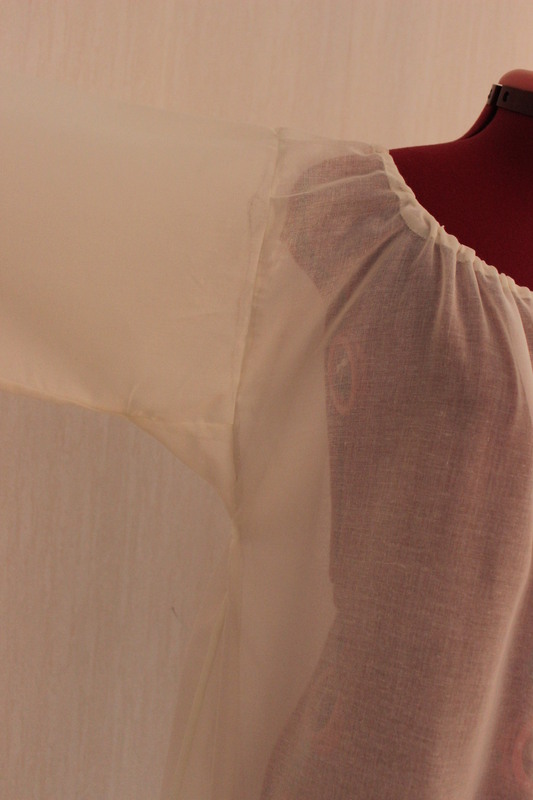 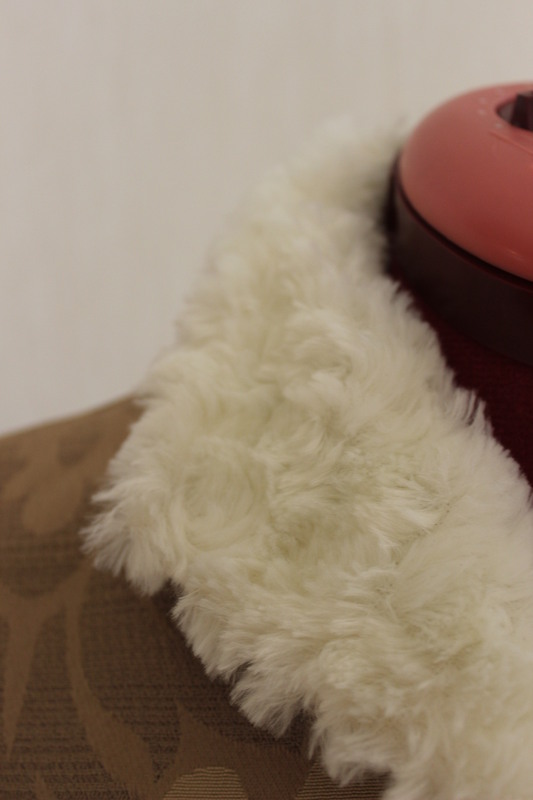 After turning and pressing the neckline, it was time to stitch the sides together. 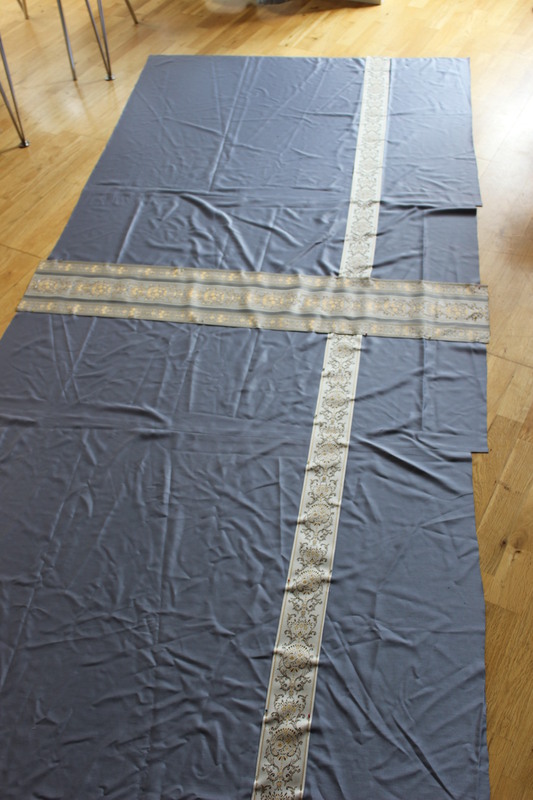 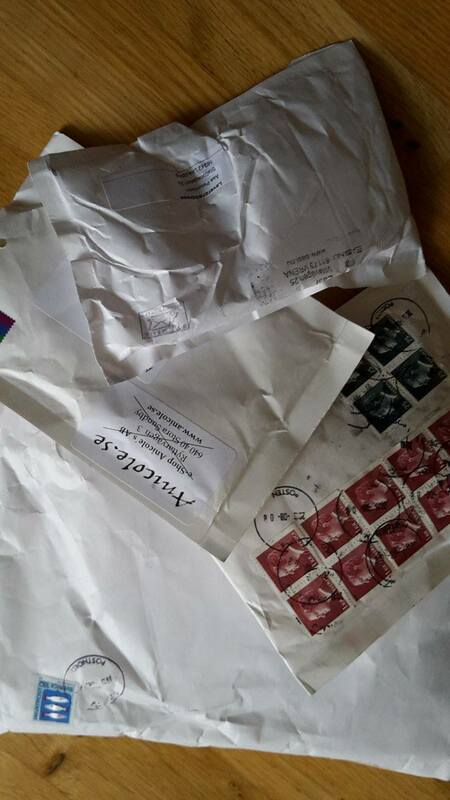 As you can see I did a small miscalculation and had to let it out a tad to get it to fit. 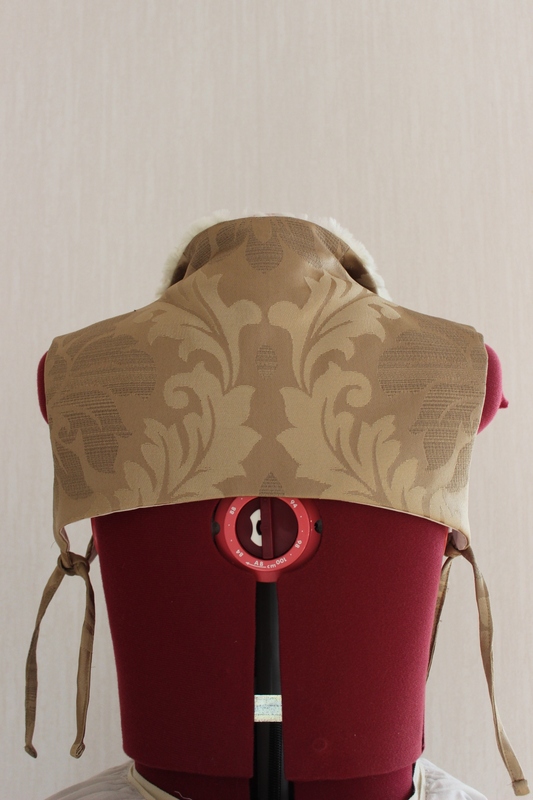 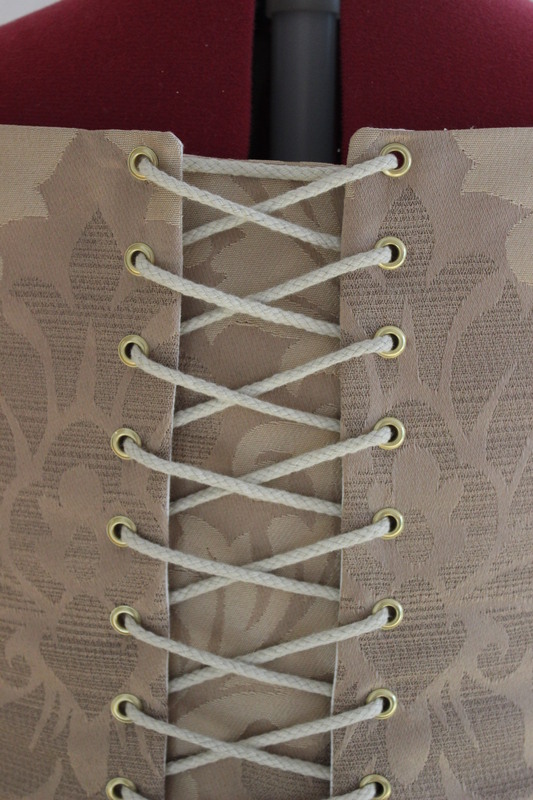 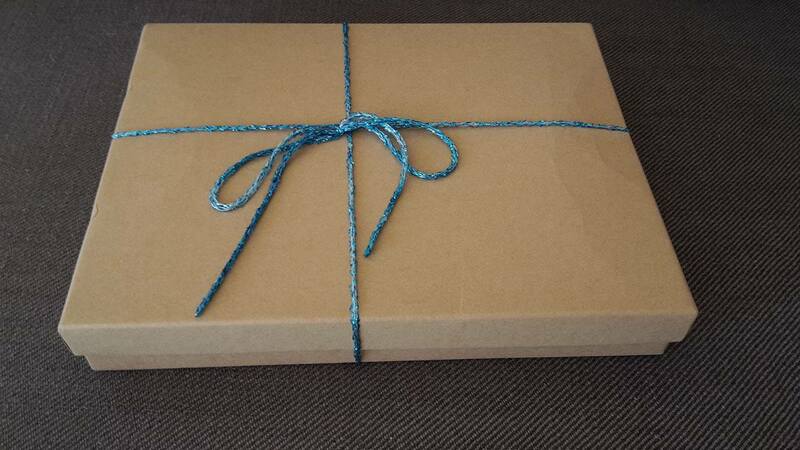 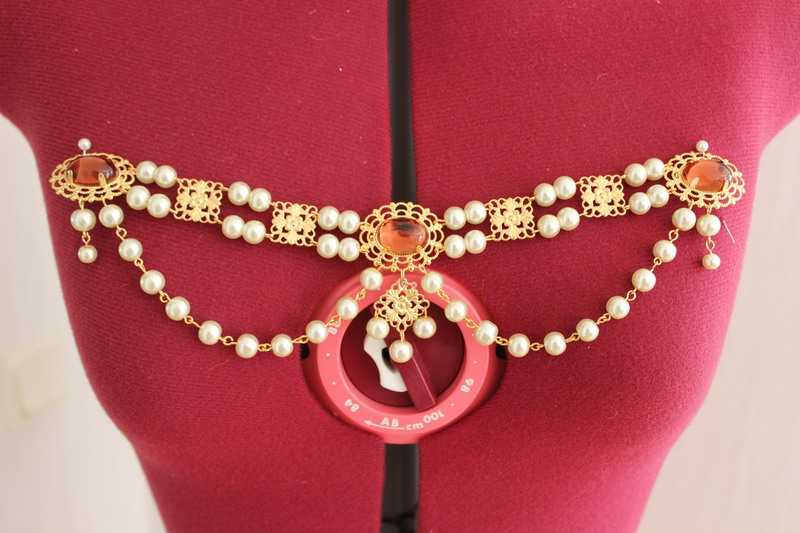 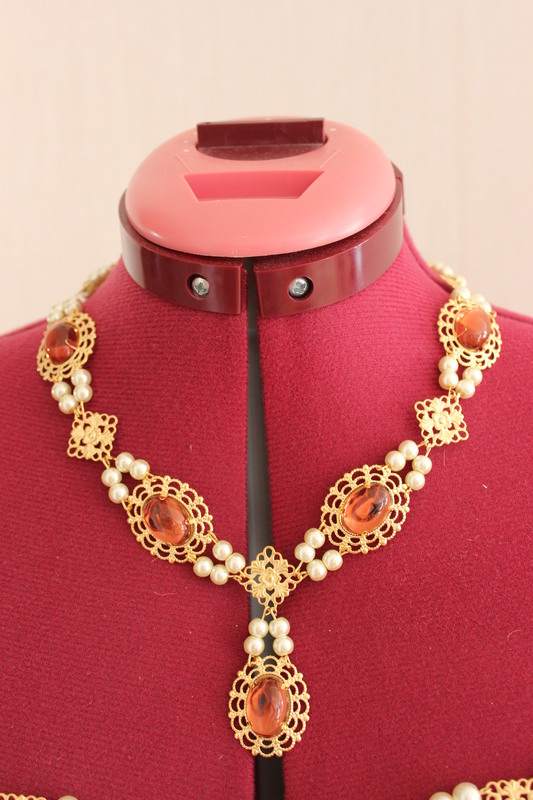 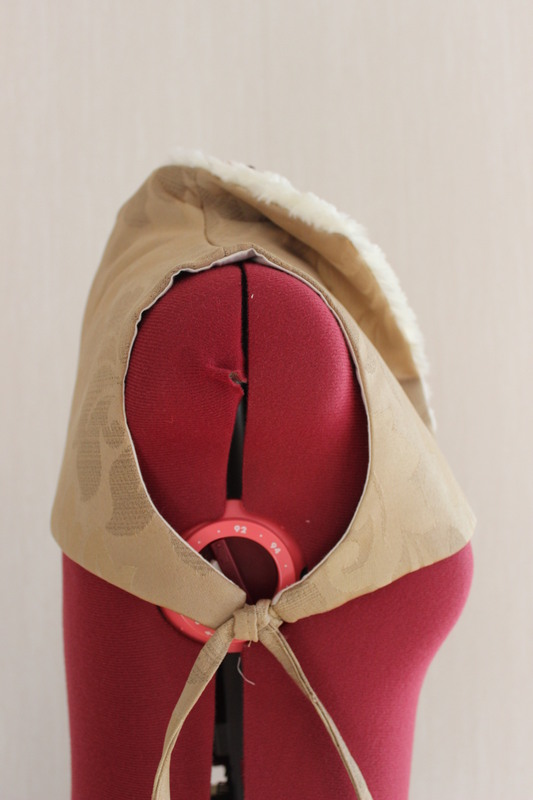 I continued by adding lacing grommets to the back. 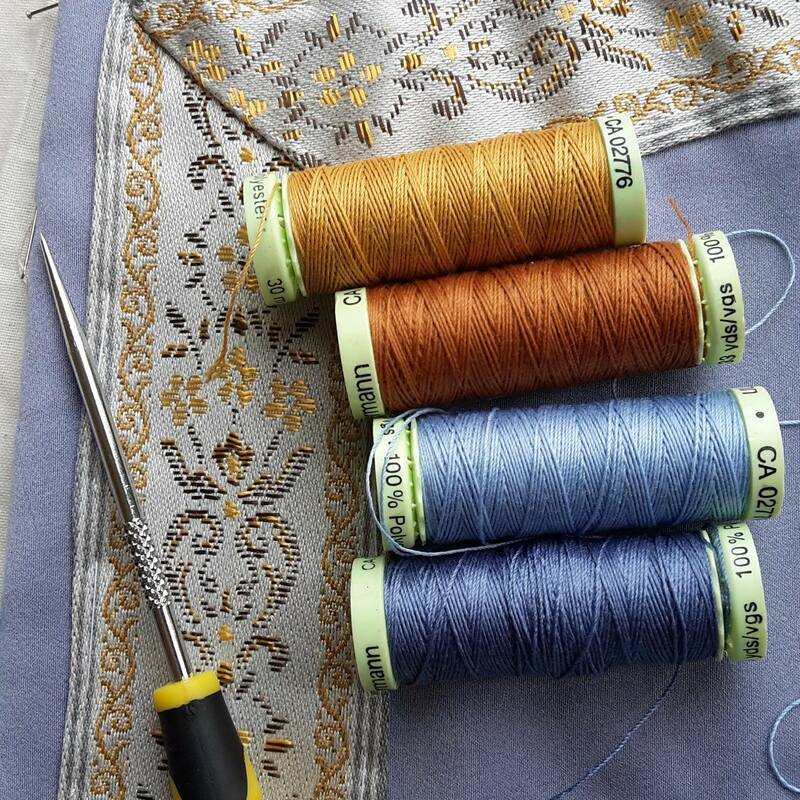 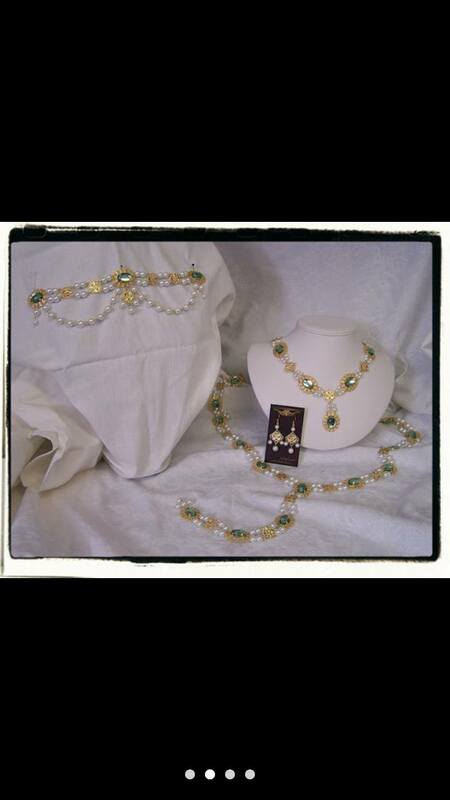 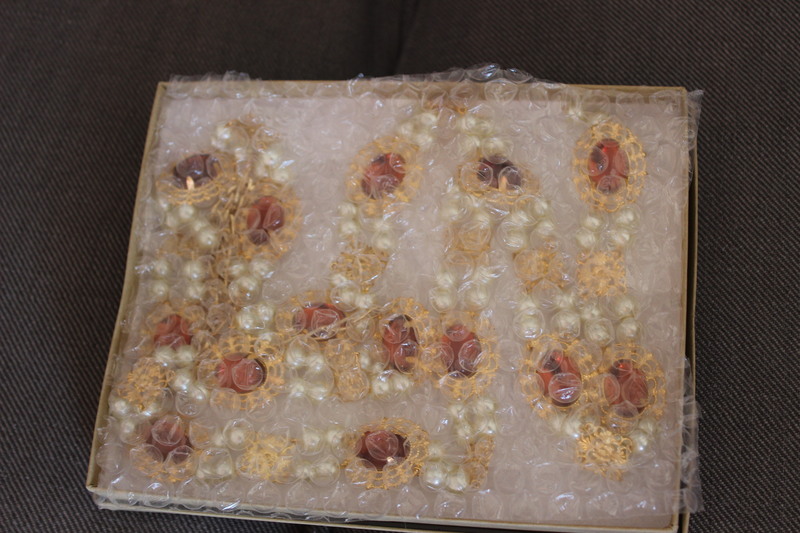 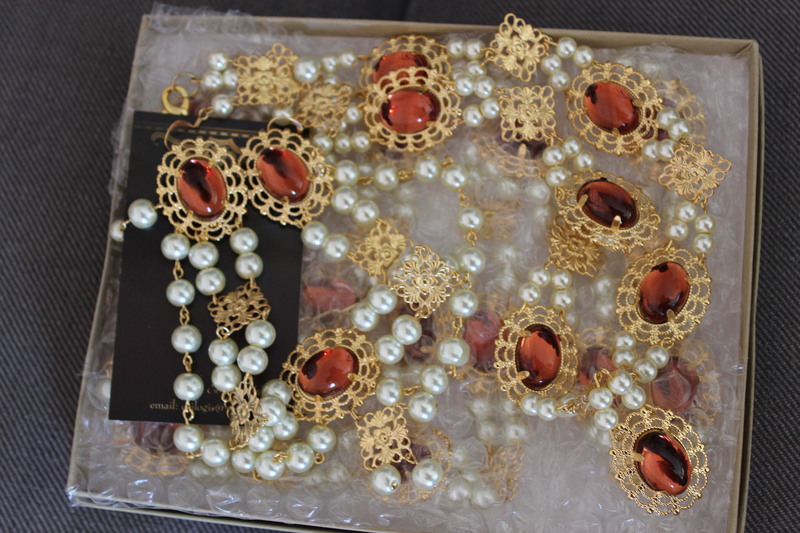 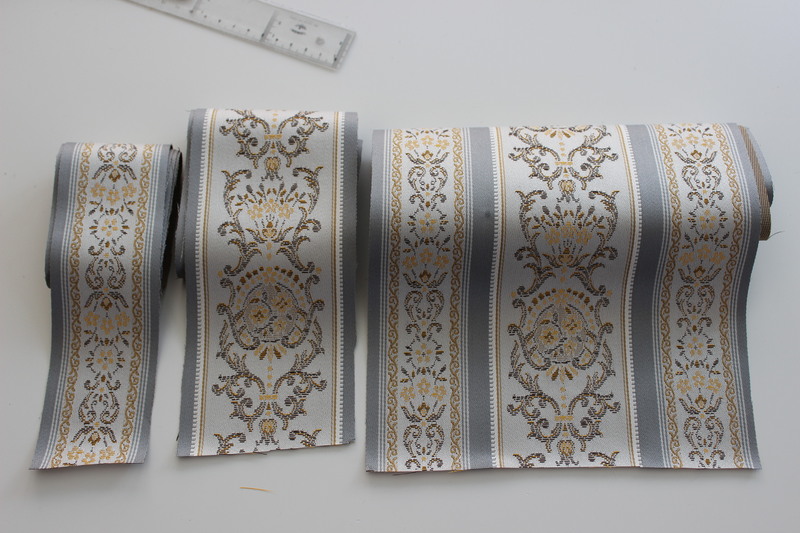 I choose the golden ones to match the fabric. 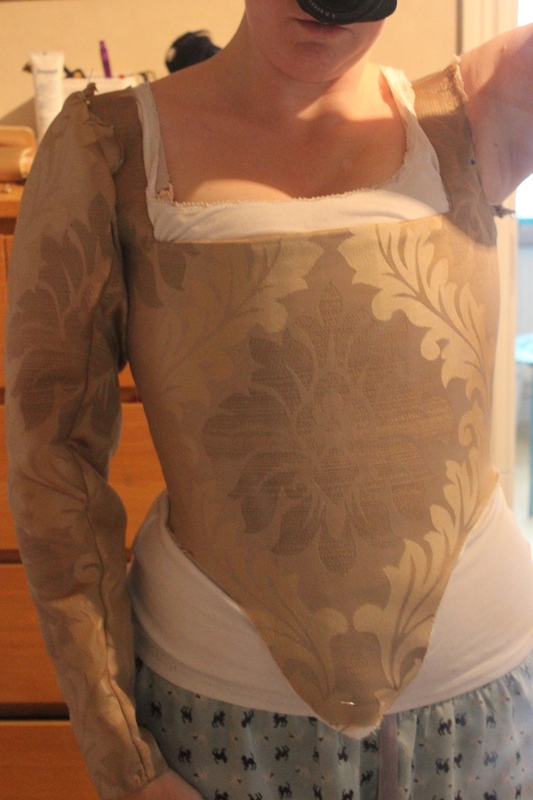 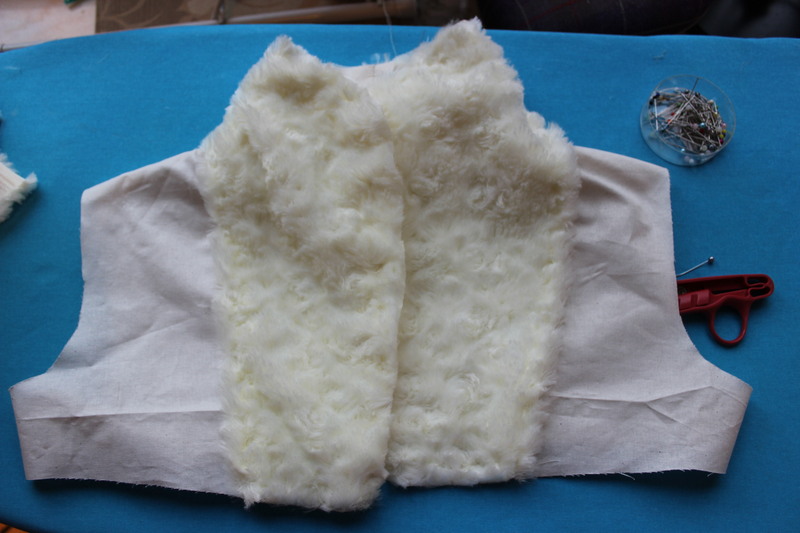 Once the bodice was “ready” I started on the sleeves. 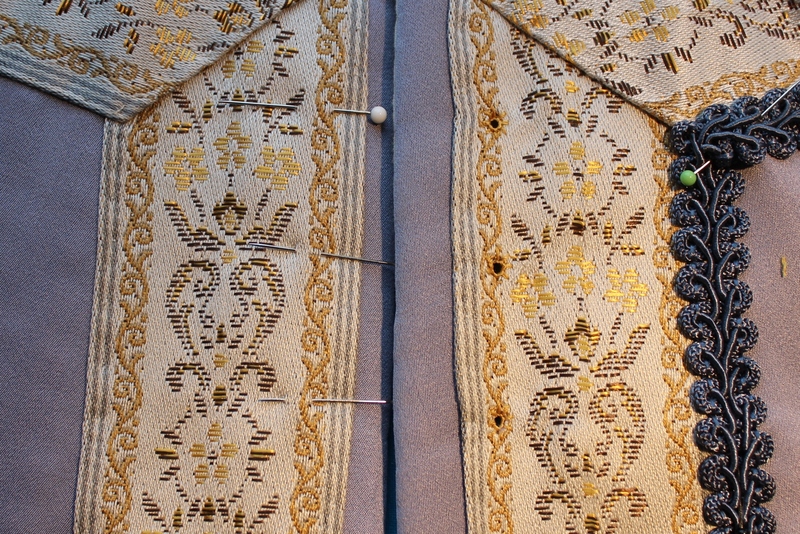 After some experimenting with cover buttons I decided to skip the detail of placate and buttons on the sleeves and just stitched them together as they where. 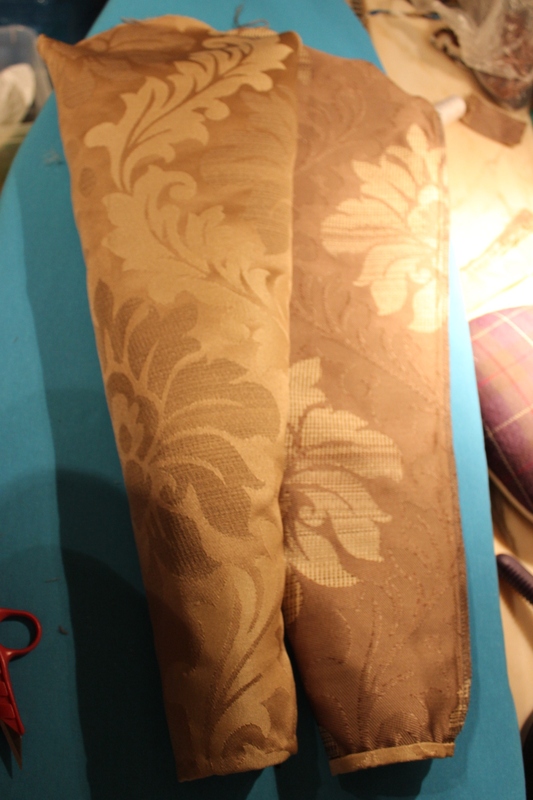 The sleeves stitched and ready (one is turned inside out). 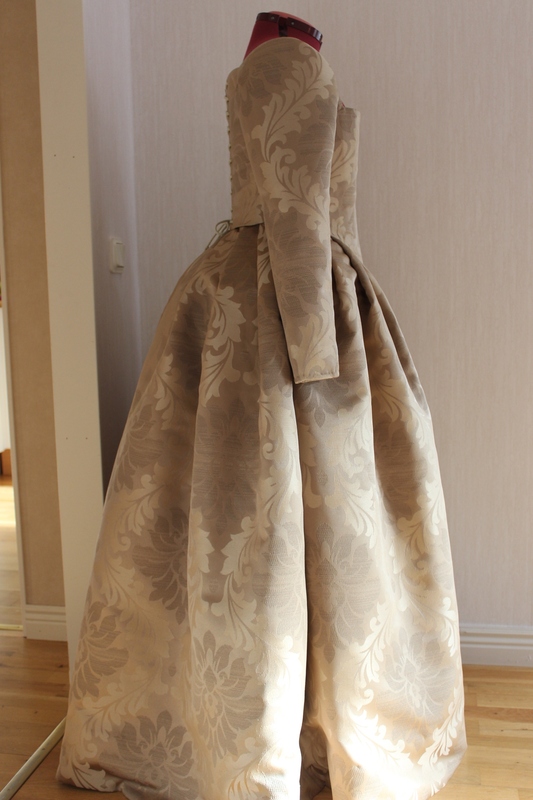 Then it was once more time to try it on. 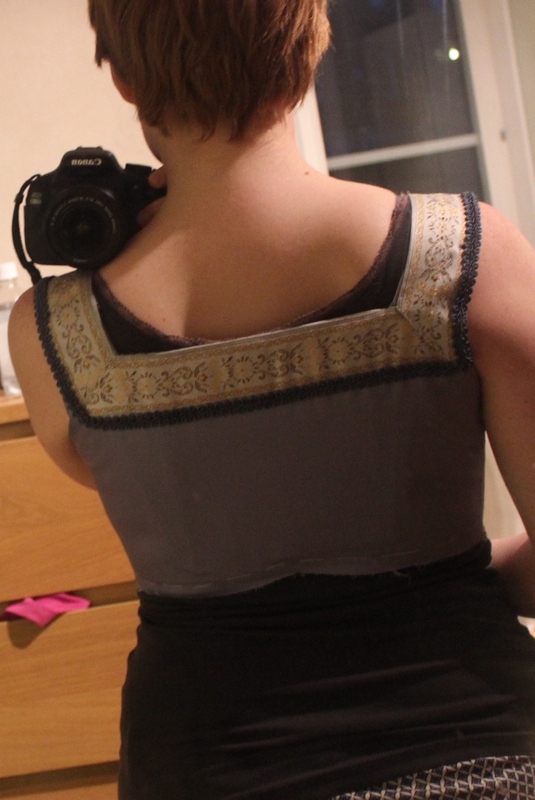 I’m so pleased with the fit and shape, and I love the placement of the big motif on he front. 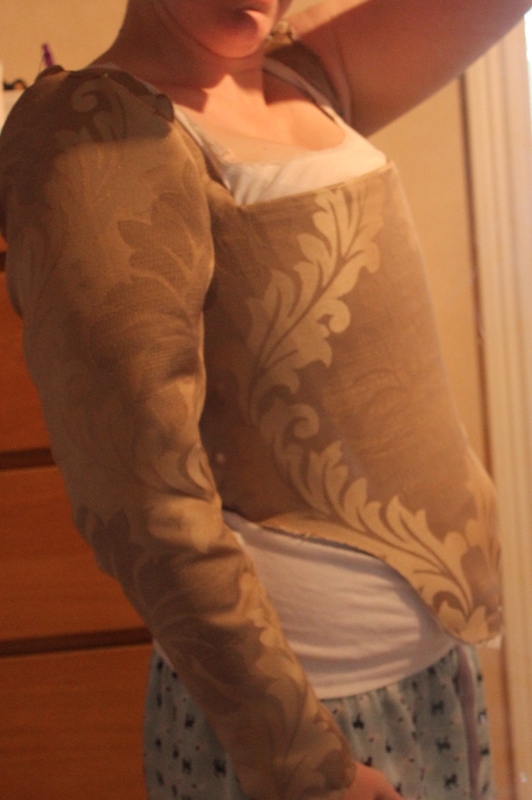 The sleeve looks pretty good to even though it’s just pinned on. 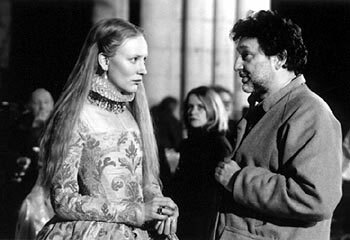 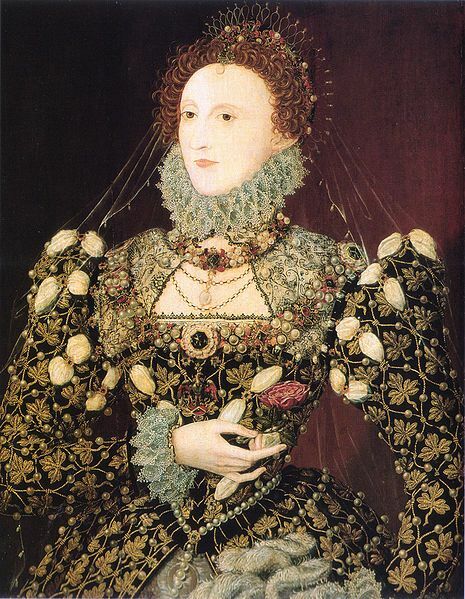 * The first and foremost Hero must of course be the late queen Elizabeth I, who made a such big impression in history, and showing that women are just as capable as men at whatever they try their hands on. 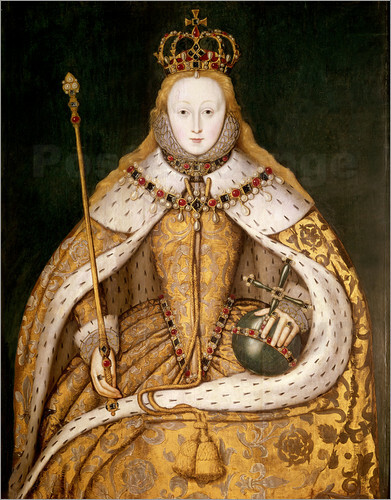 I love powerful and inspirational females. 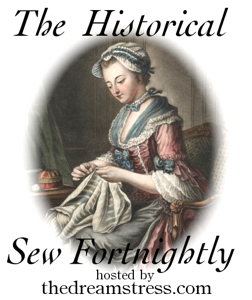 * Then I want to thank the amazing people who dedicate their life and work at researching historical fashions and styles and who make their finds available to everyone who’s interested in re-creating these fabulous garments (of course I’m thinking of Waugh, Arnold, Friendship, Bradfield, Mikhaila/Malcolm-Davies and many many more). 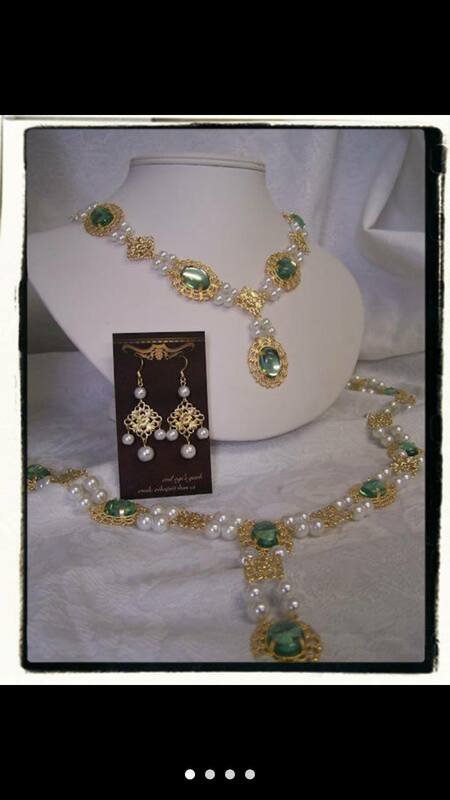 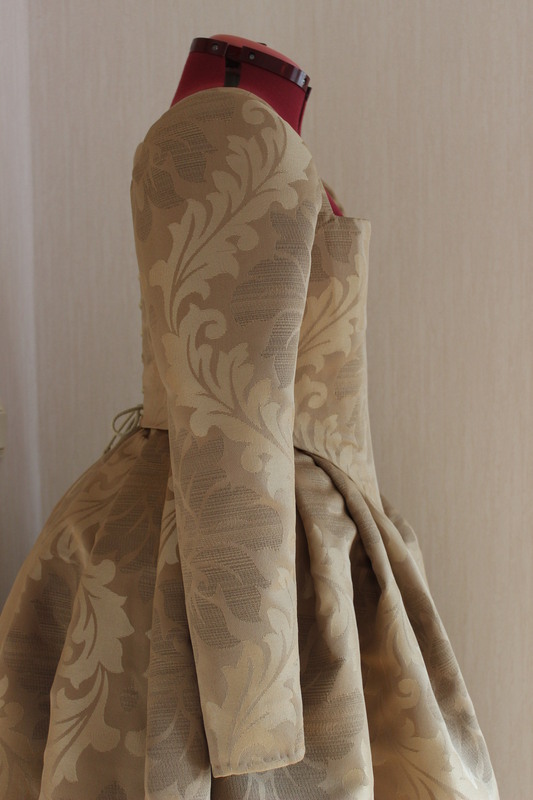 It might take a few years, but someday you will make that dress you fantasied about for so long. 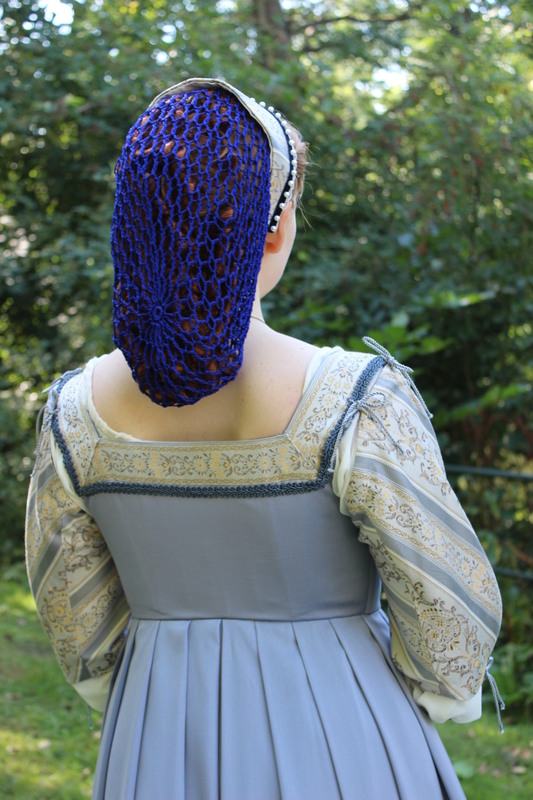 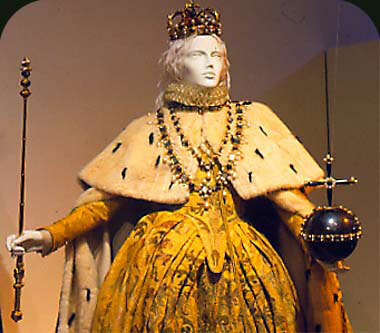 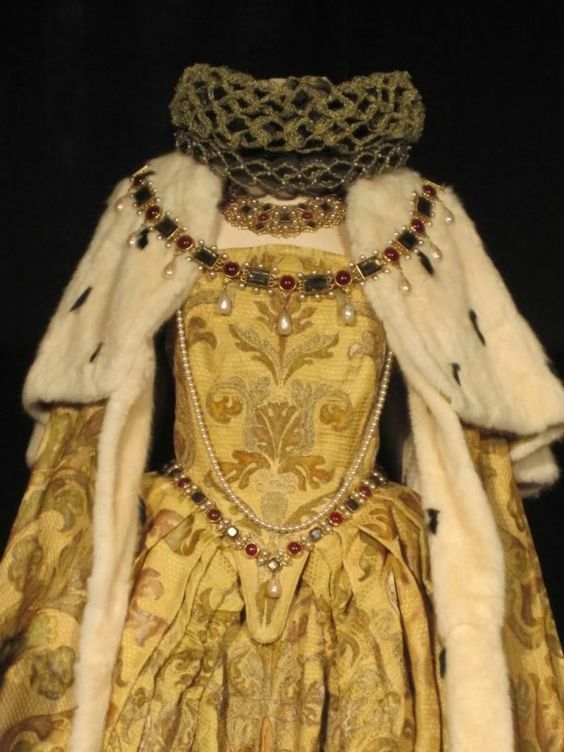 How does it fit into the challenge: This dress is a dedication to lots and lots of strong and capable women, and men, but most to the one and only Queen Elizabeth I. 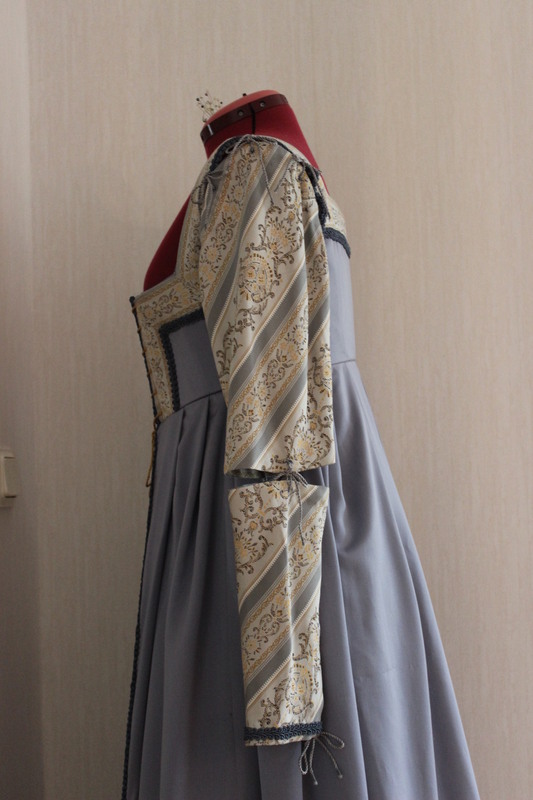 Pattern: Bodice pattern remade from “The Dorothea bodice” from “The Tudor Tailor”, the sleeves was copied from my previous mentor at the theater atelje, the skirt is basically just 3 pieces of fabric sewn together. 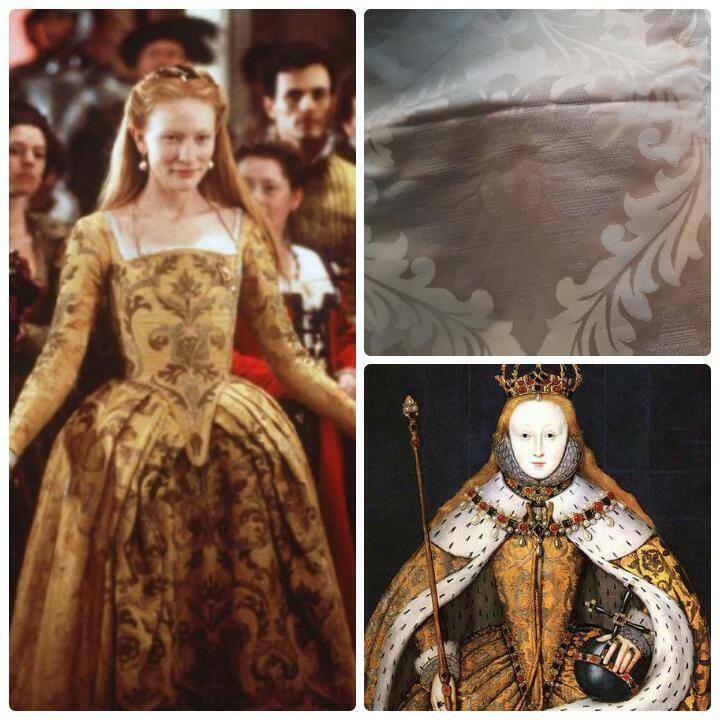 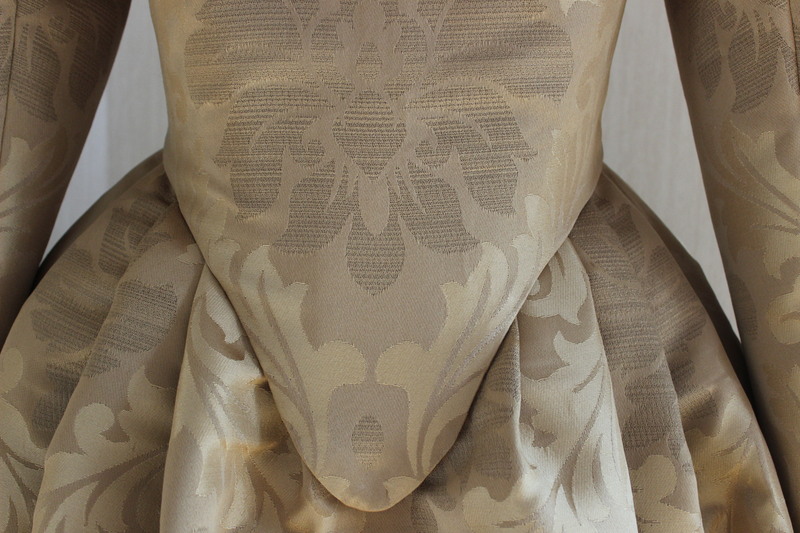 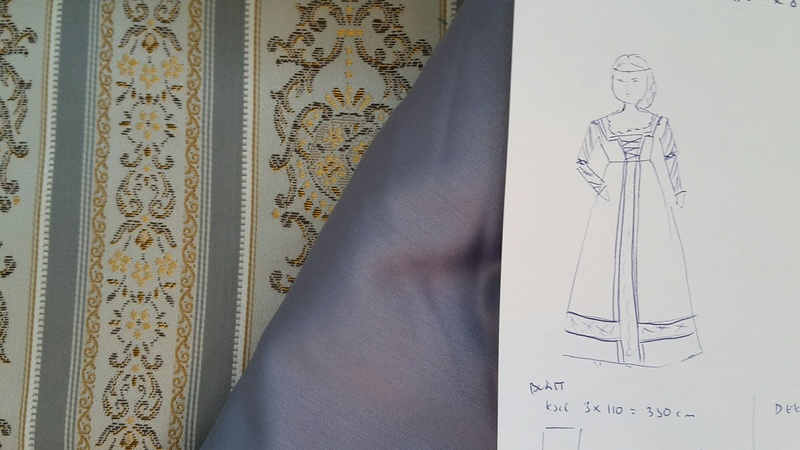 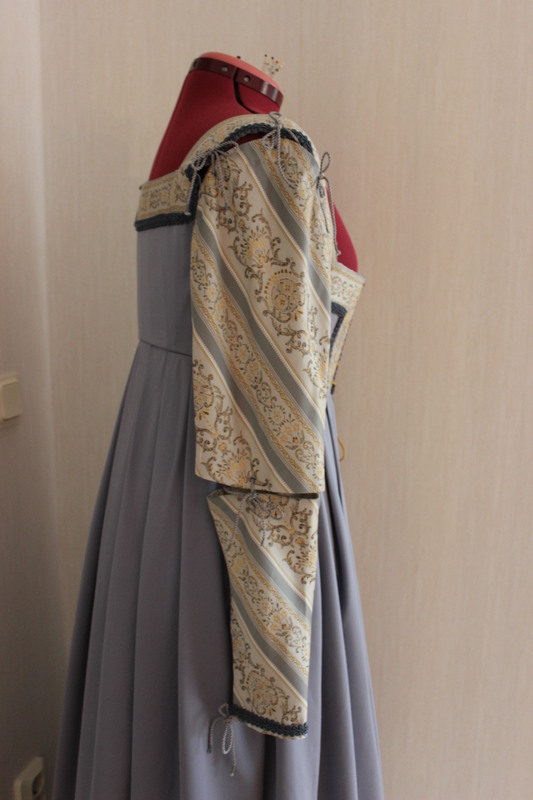 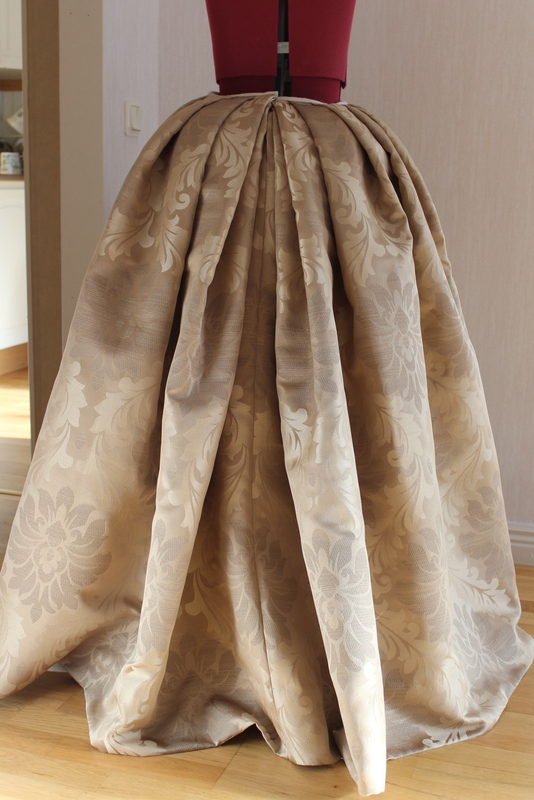 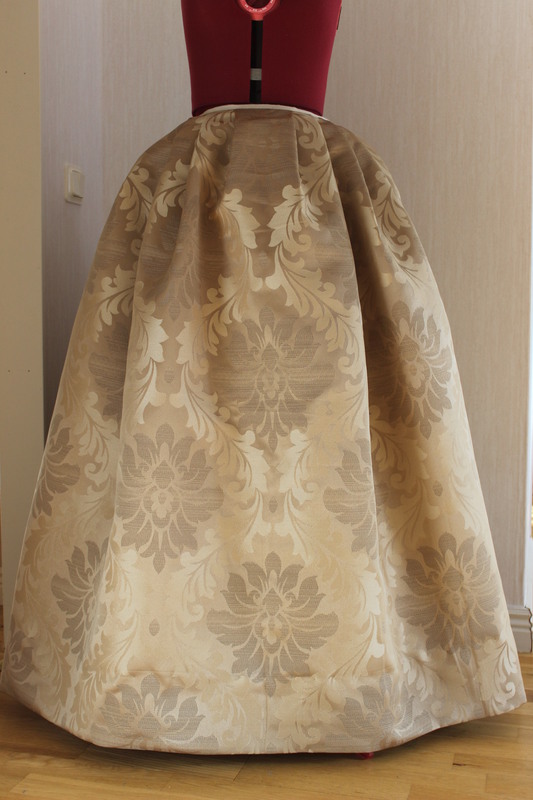 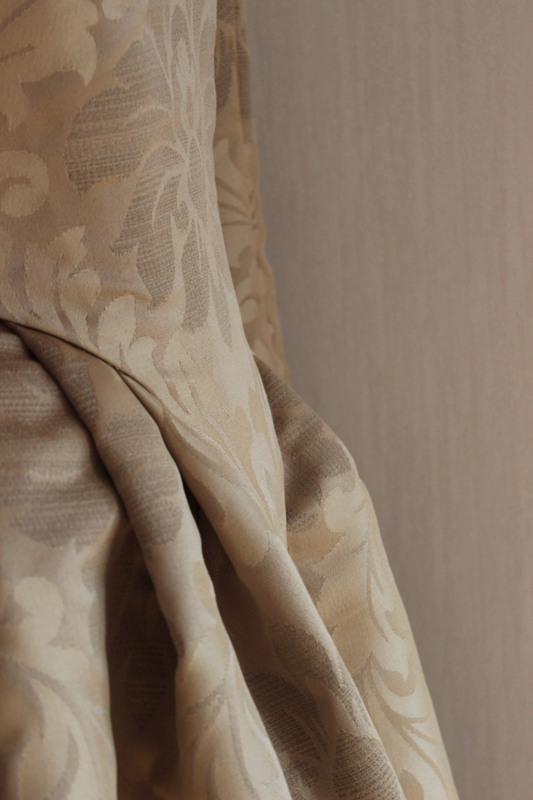 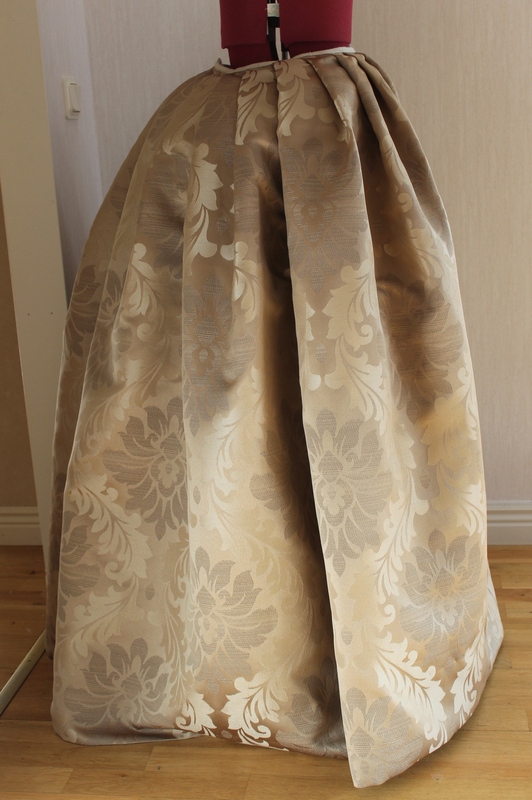 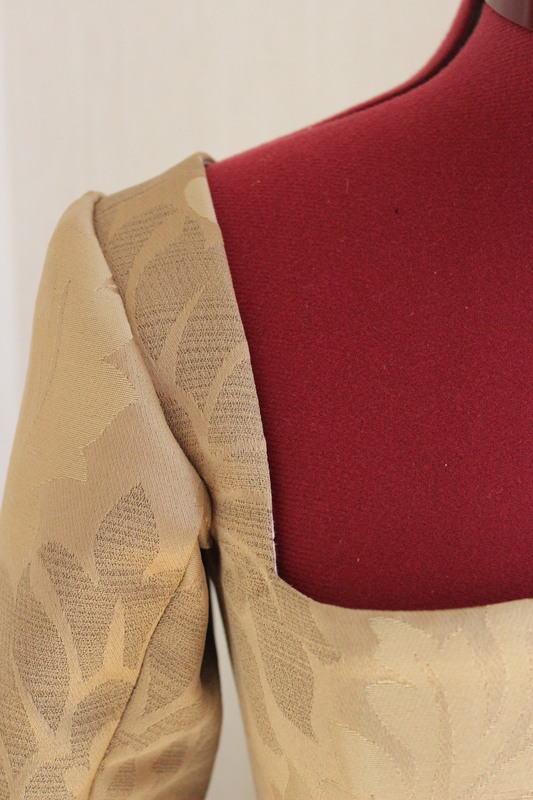 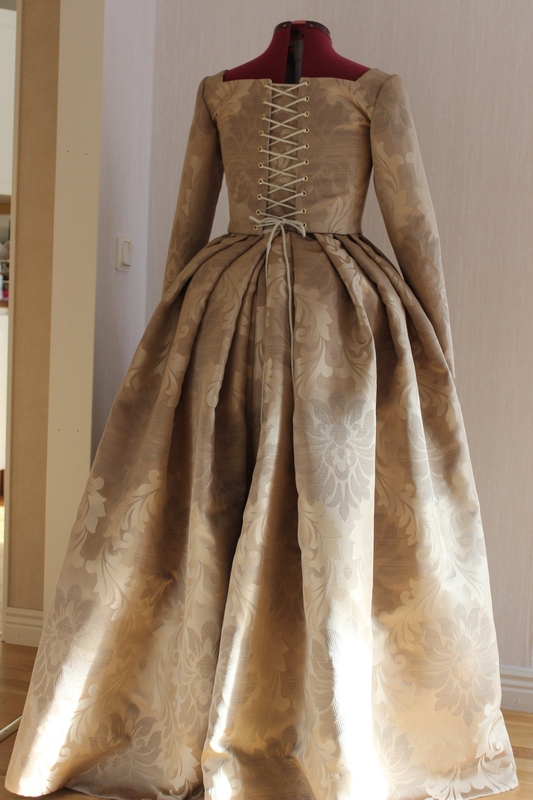 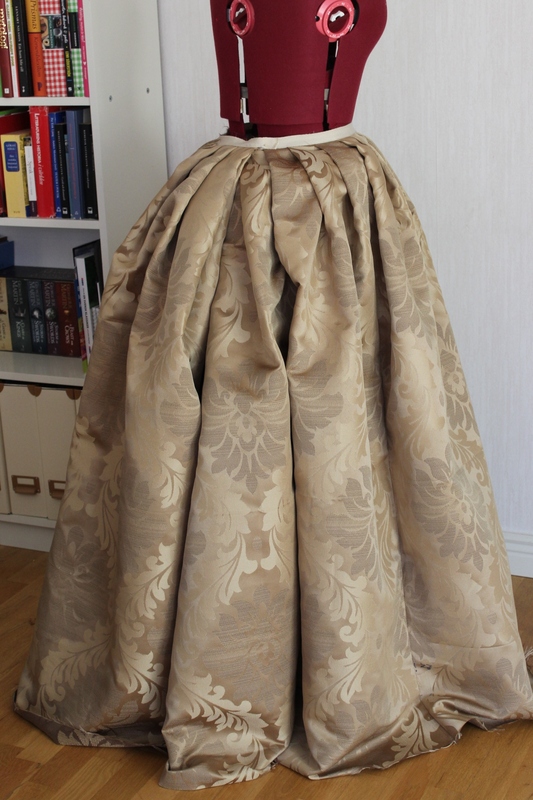 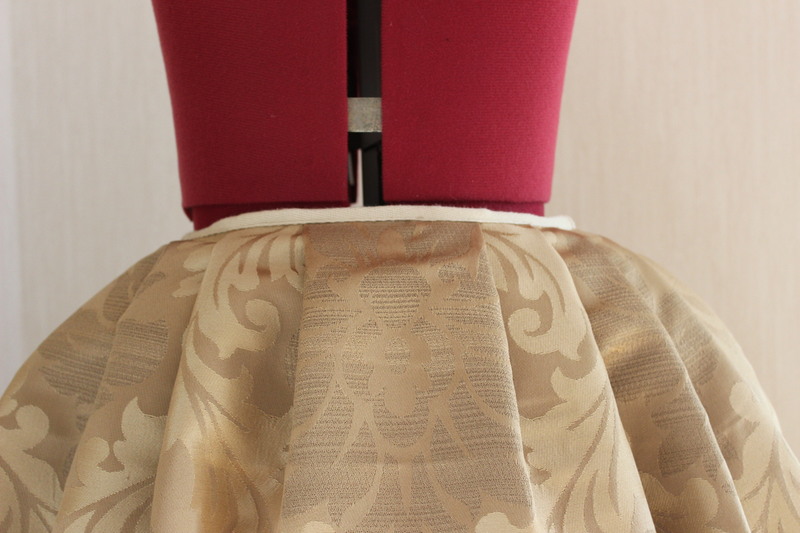 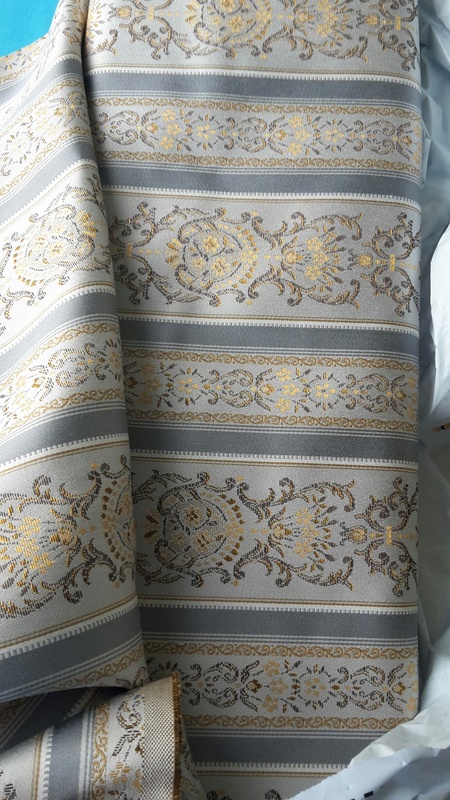 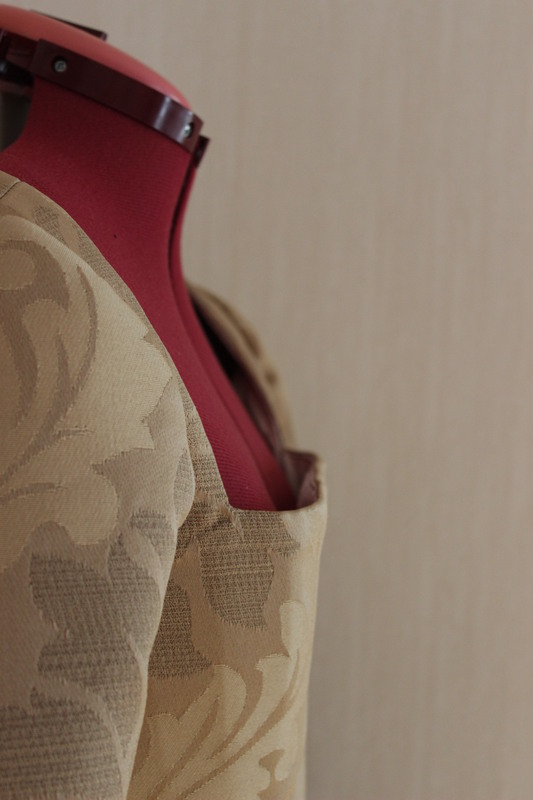 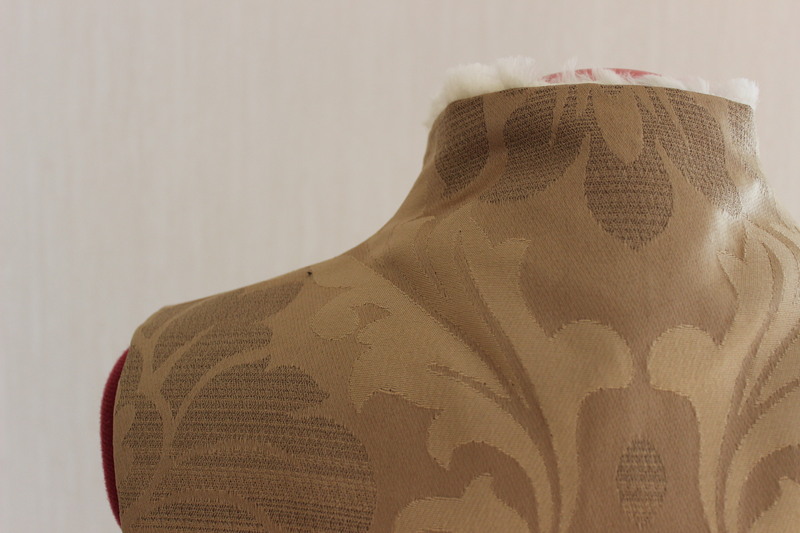 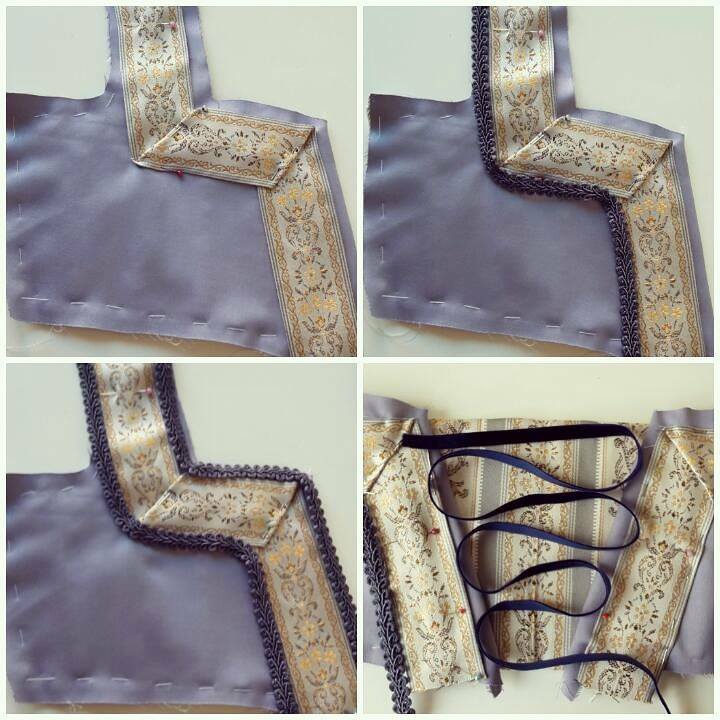 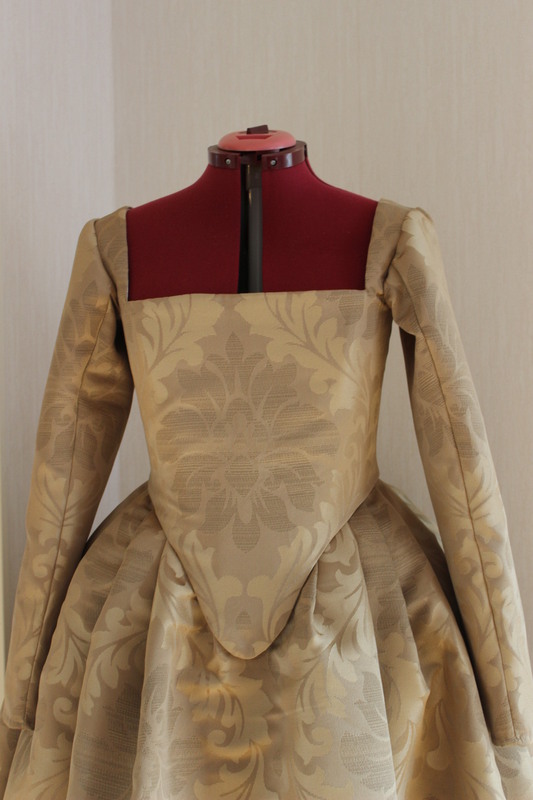 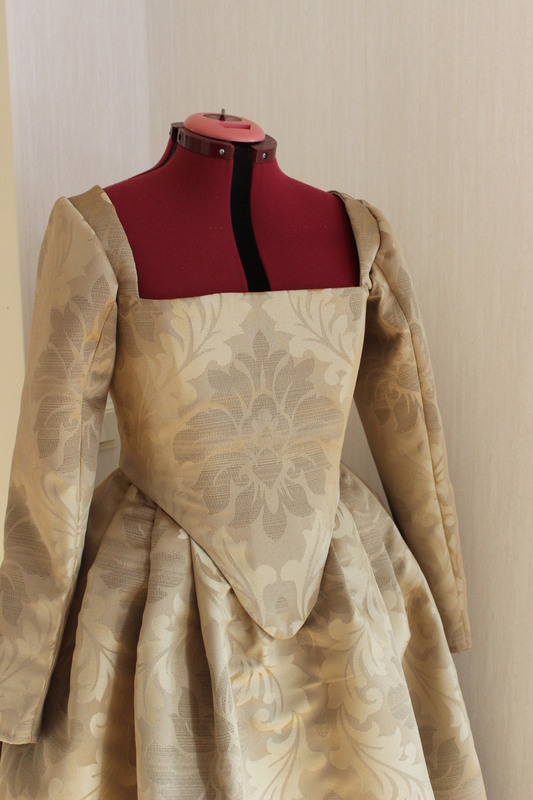 Fabric: 4,5 m of golden polyester furniture brocade/damast, 1 m white cotton for lining and interning the bodice. 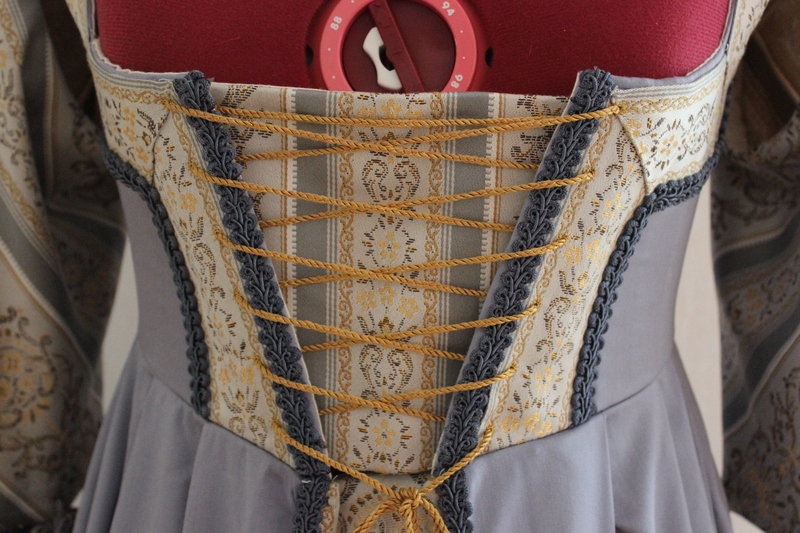 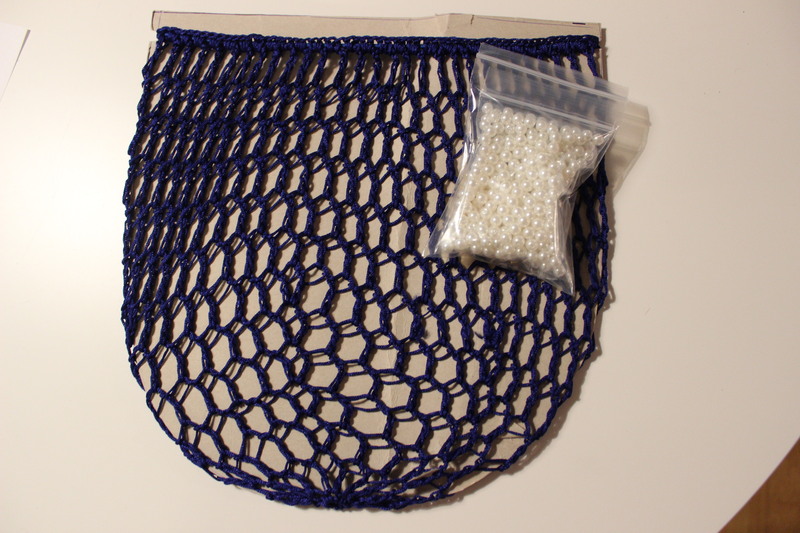 Notions: Thread, grommets, 3 m of cotton cord for lacing, 20-30 zip-ties heavy for boning, hook and eye and 1 m cotton ribbon for the skirts waist. 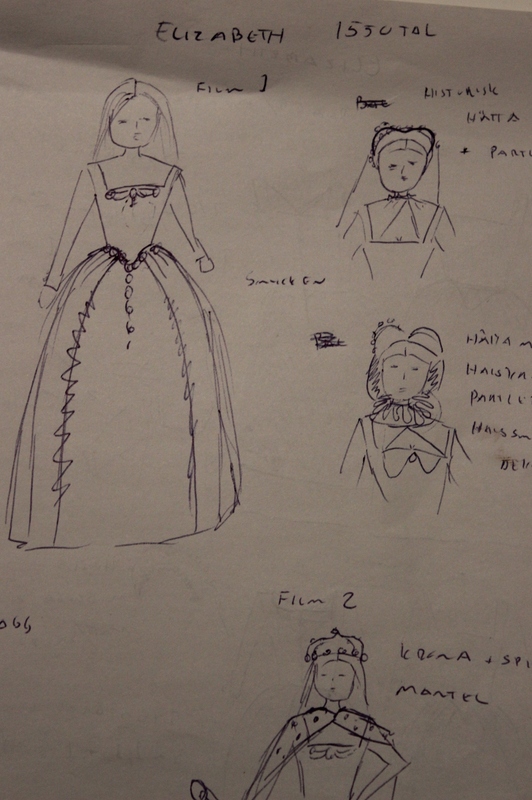 How Historical Accurate: Not at all I’m afraid. 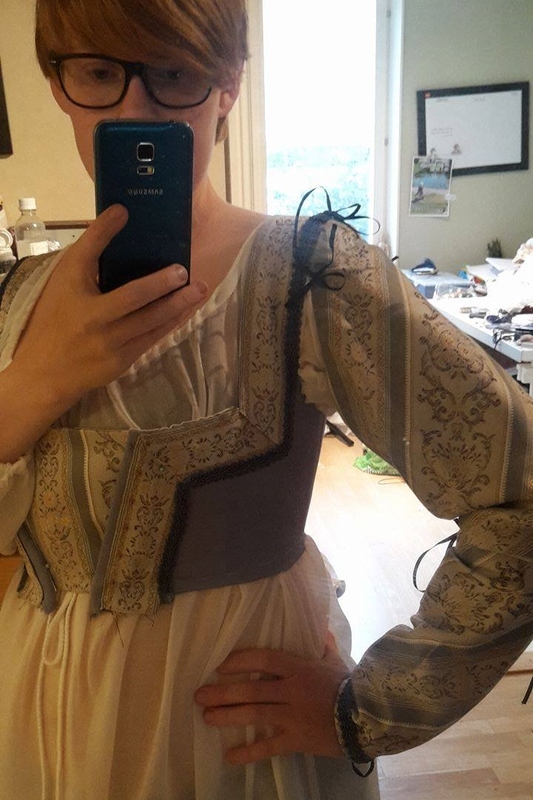 The fabric is modern both in content and looks, the bodice pattern are okey for the period but the back lacing (bot back placement and the use of metal grommets) is all wrong and I think the sleeves are wrong to. 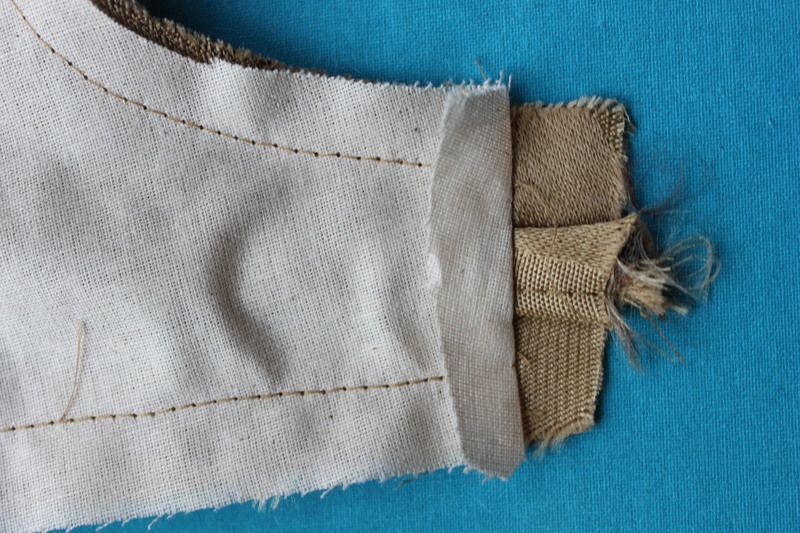 And the fact that I stitched it all up by machine and using modern techniques don’t make it any better. 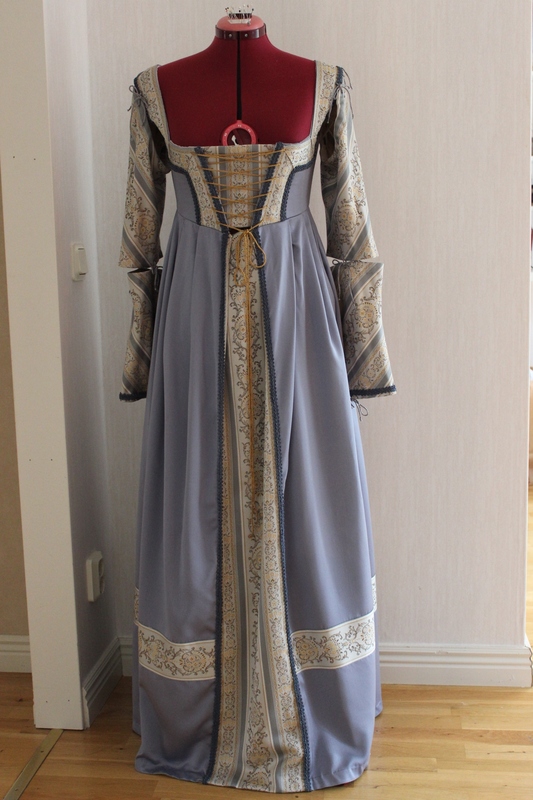 I would say 2/10. 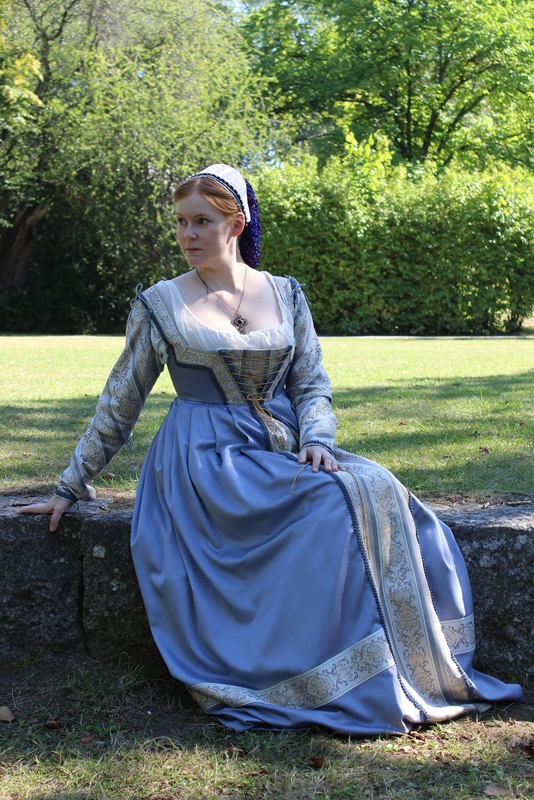 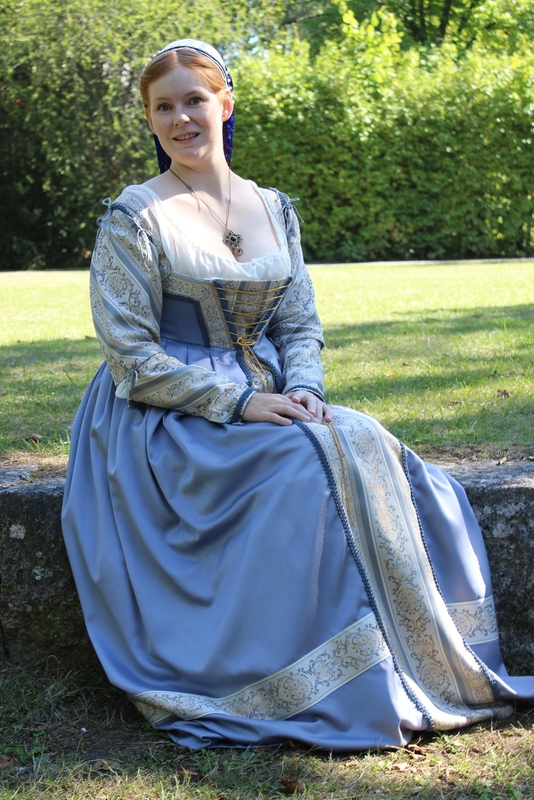 Final Thoughts: I love this dress, even though its far from historical accurate I think it does look really good (especially with a more historical styling) and I liked wearing it. 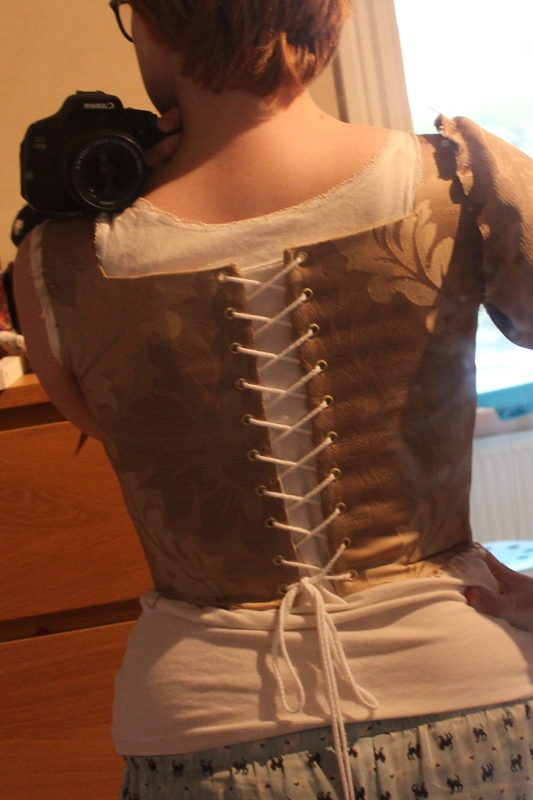 My only concern is that I need to make something about the way the bodice point wrinkles. 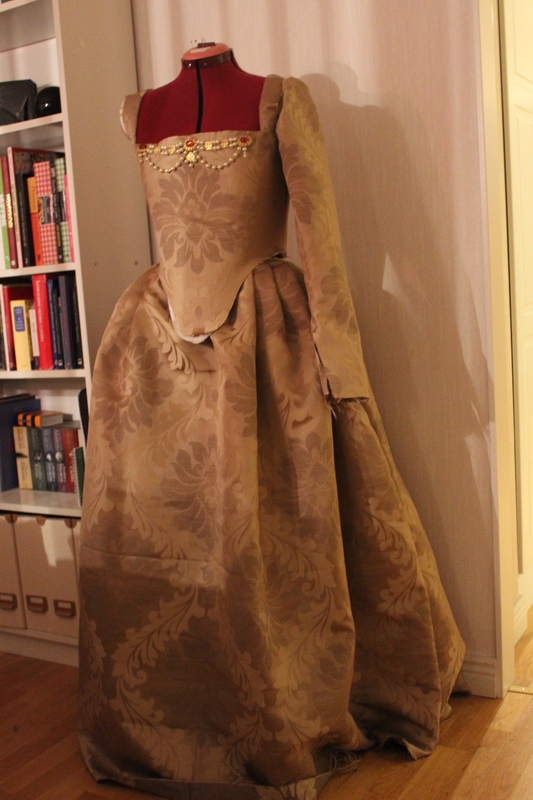 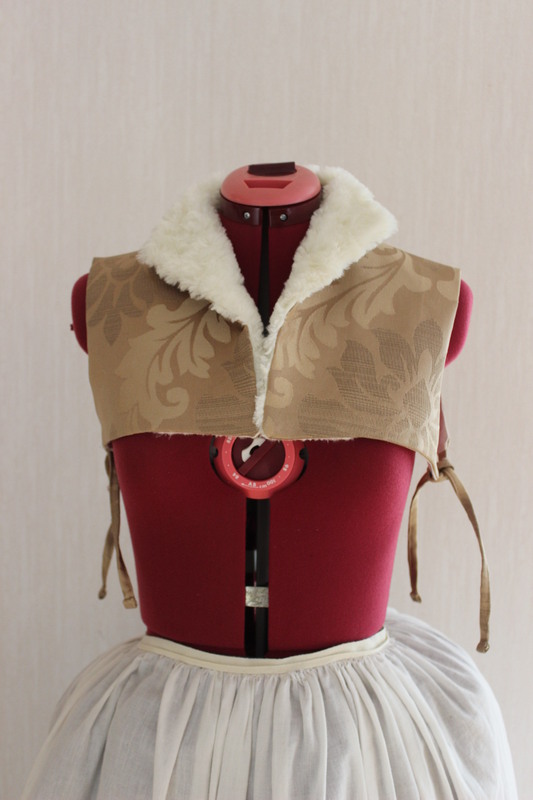 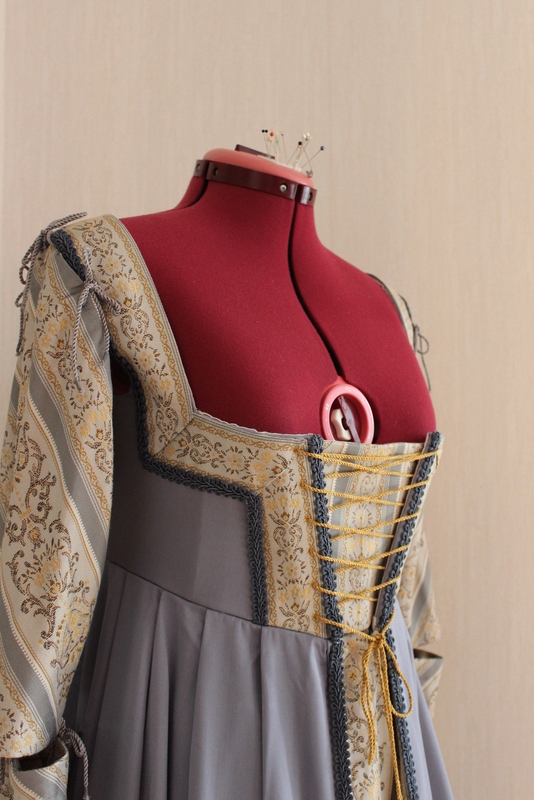 and I definitely need to anchor the bodice and skirt together, with hooks and eyes, for my next wearing. 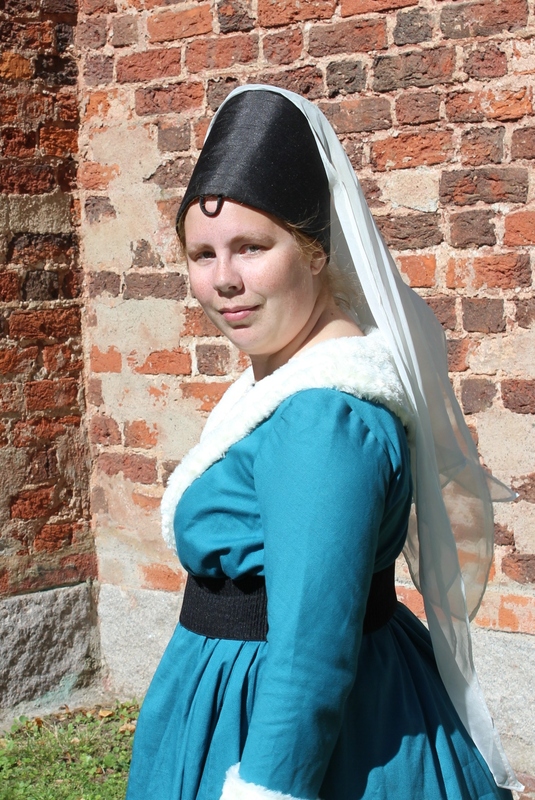 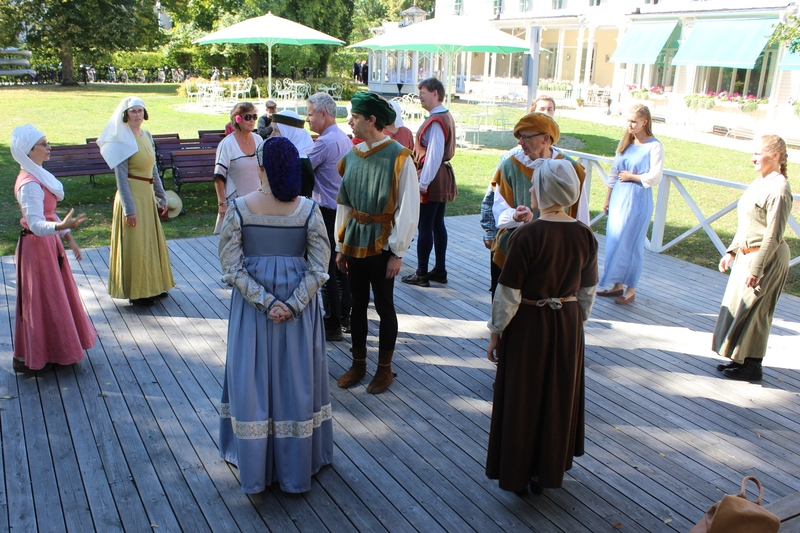 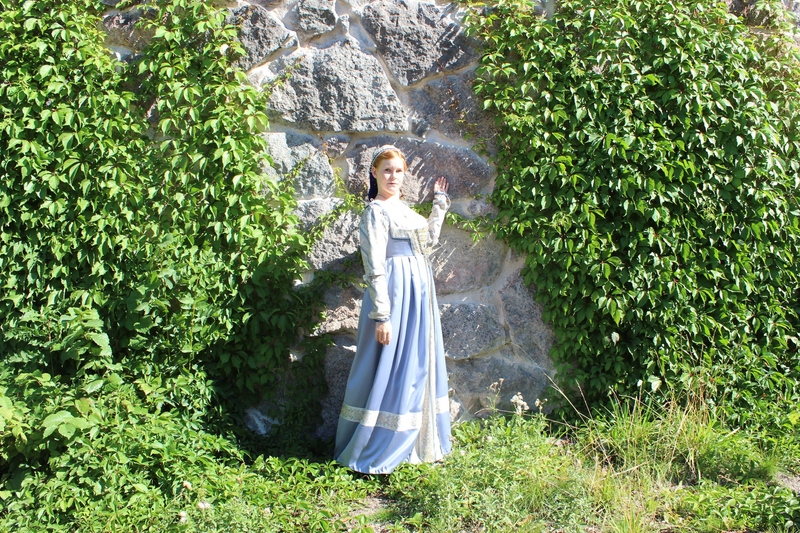 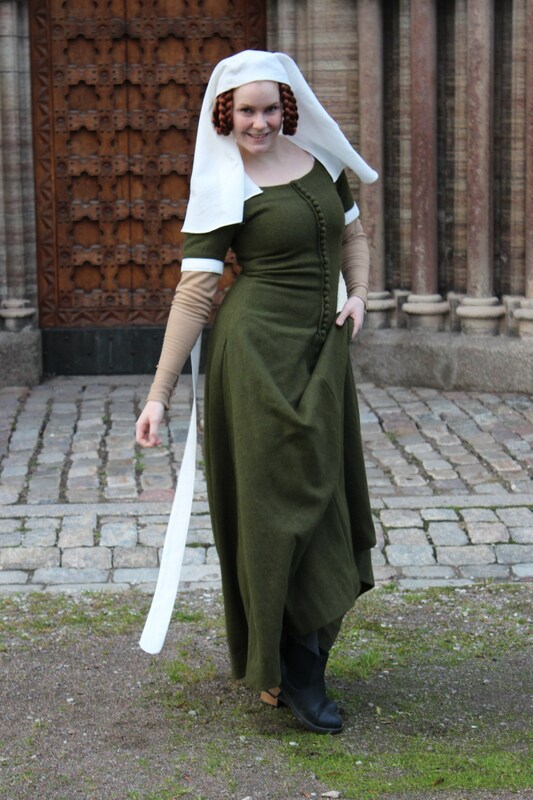 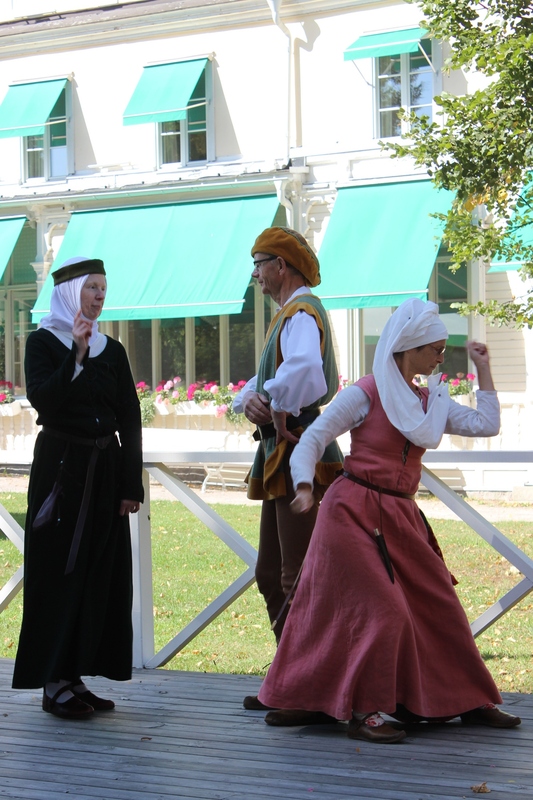 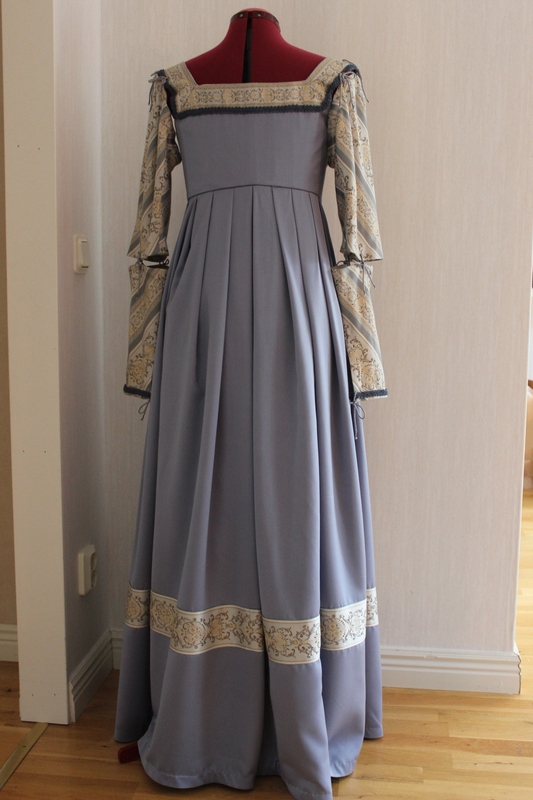 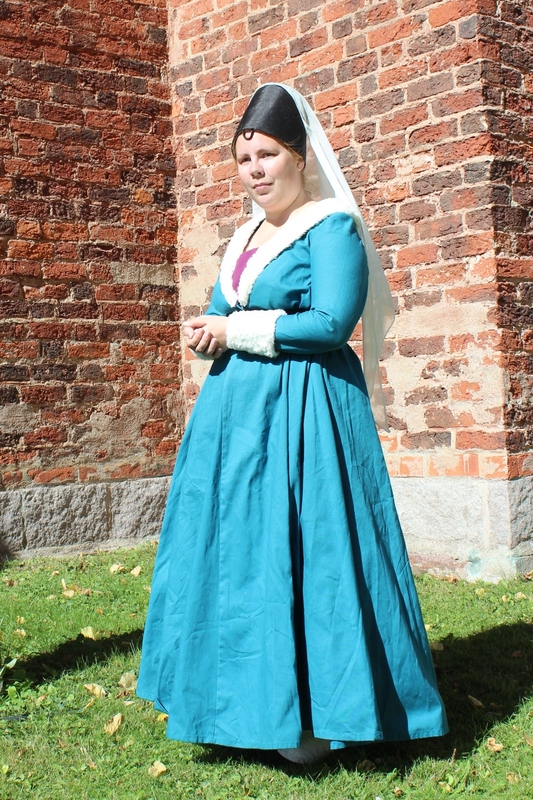 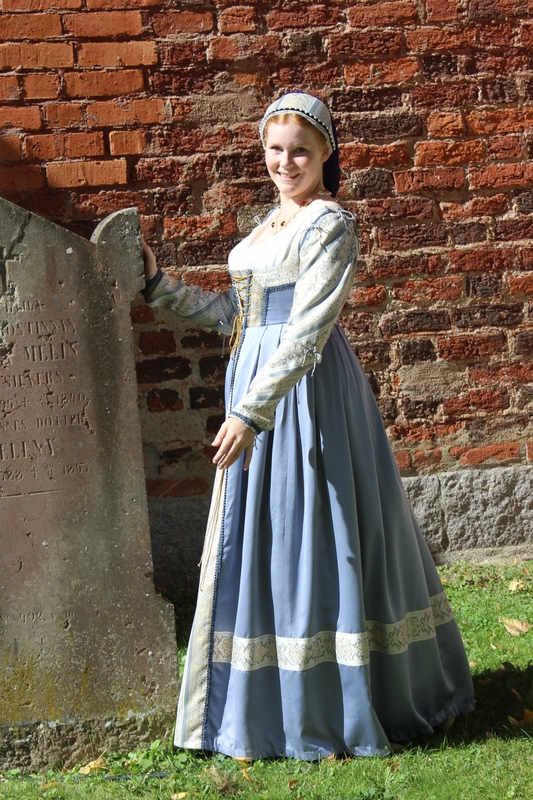 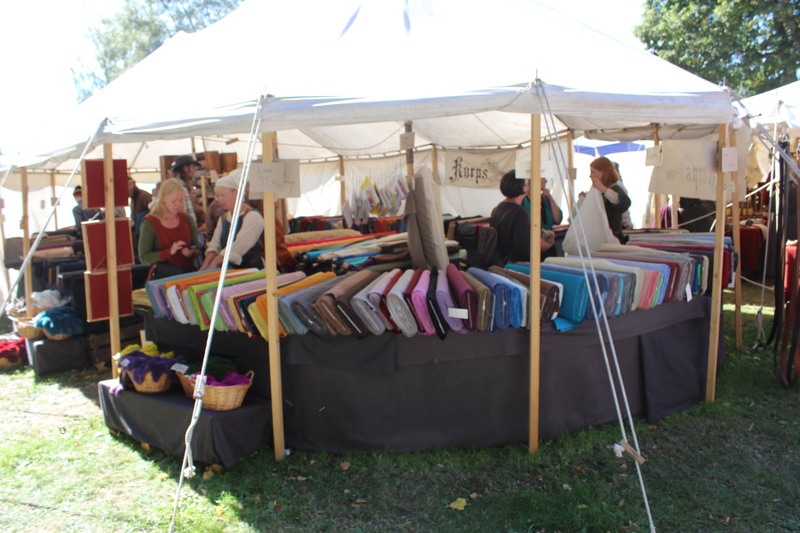 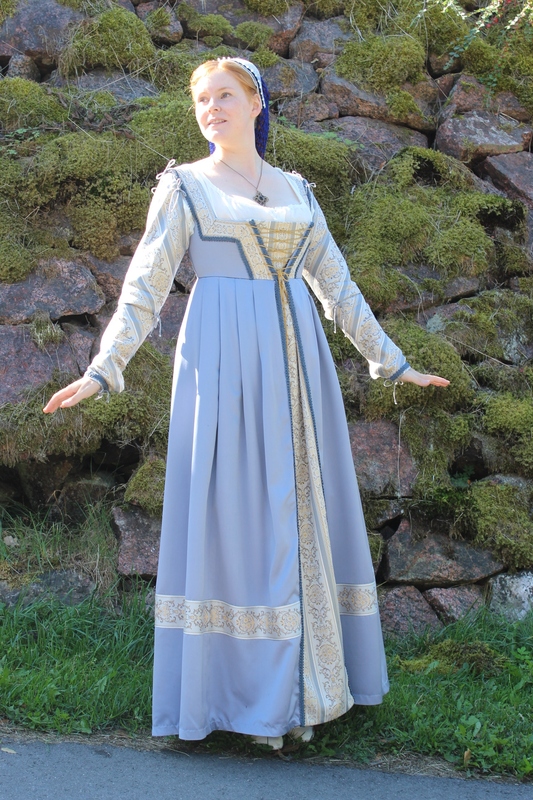 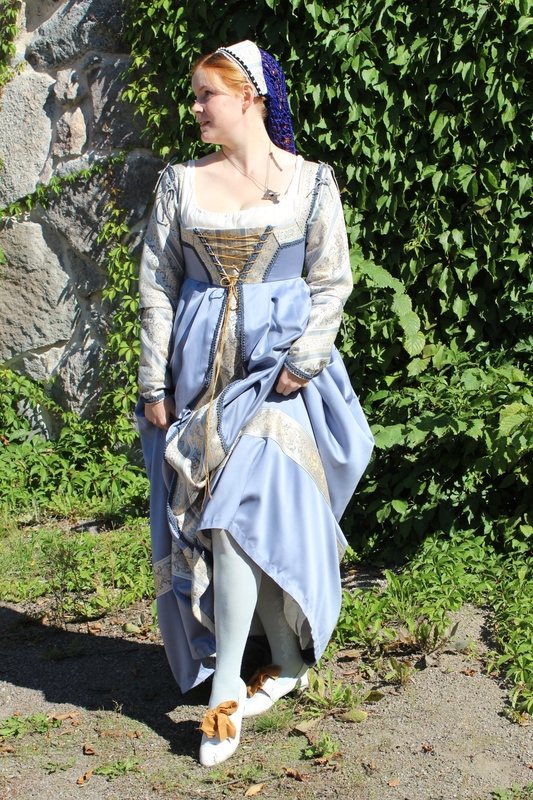 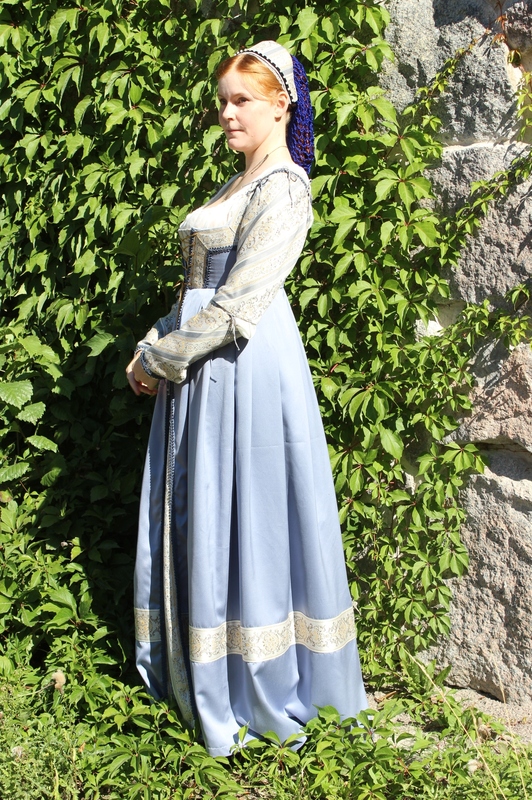 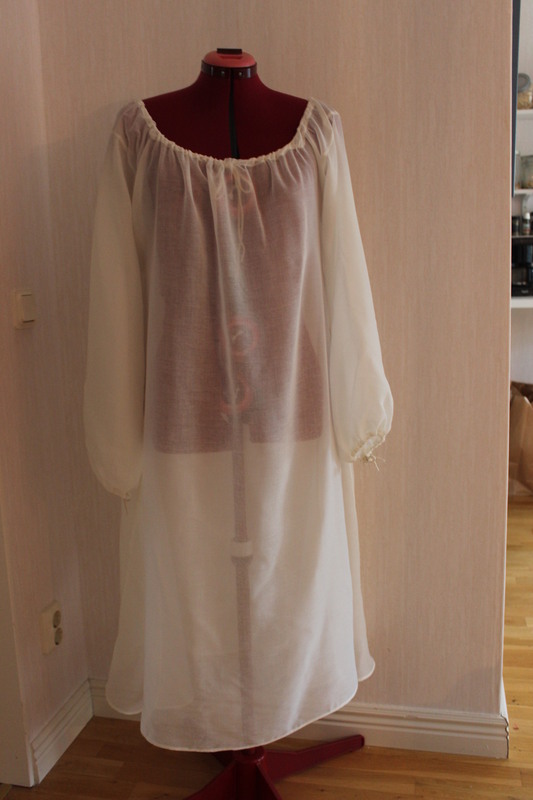 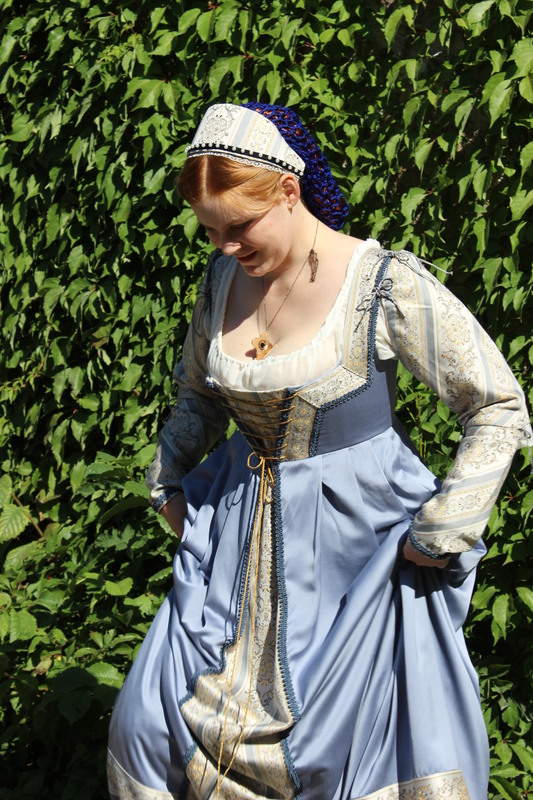 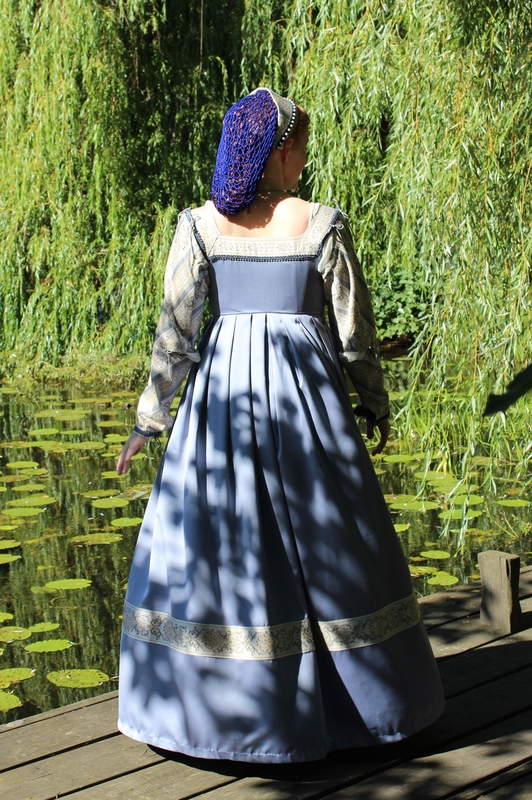 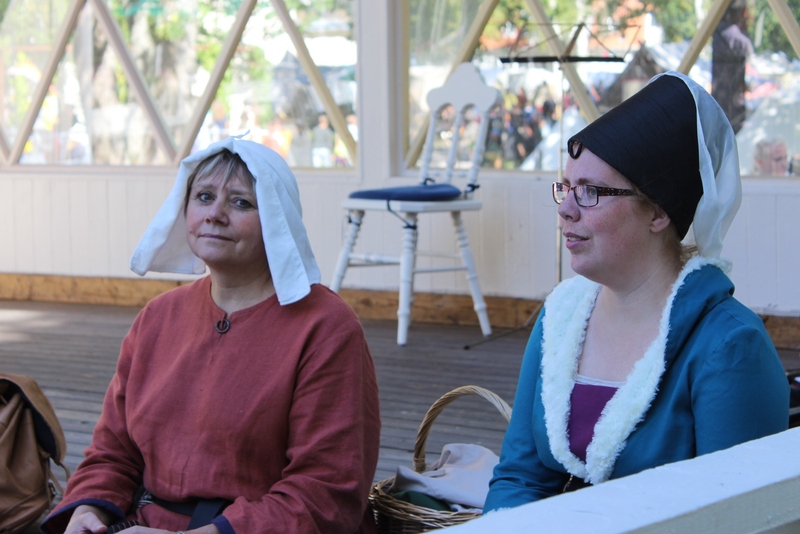 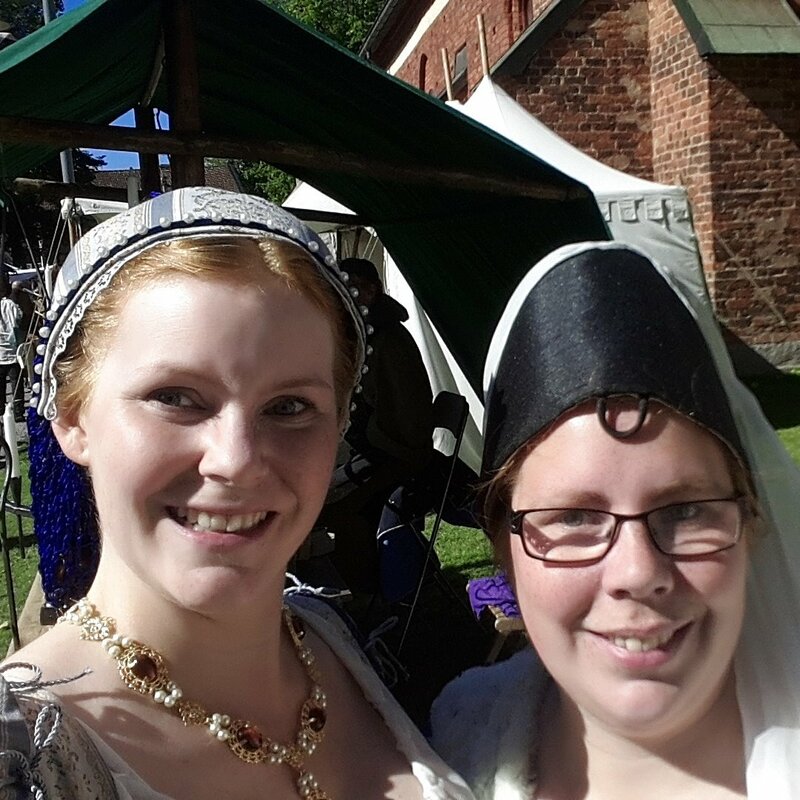 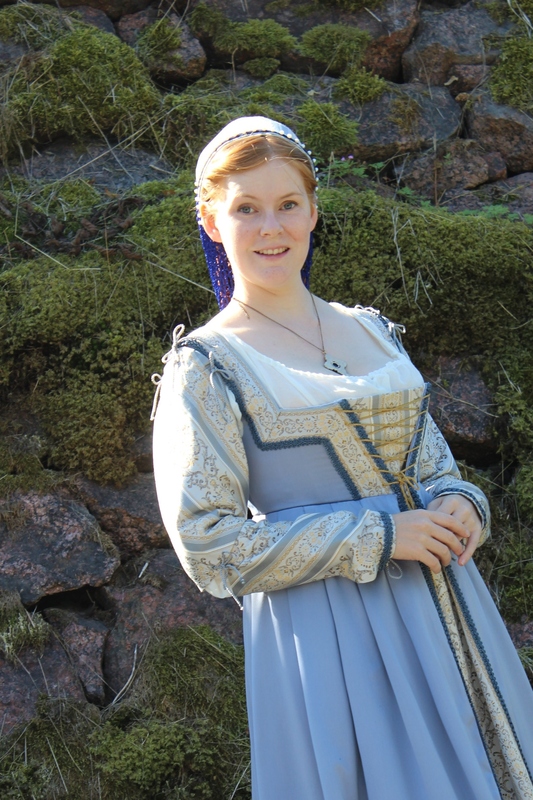 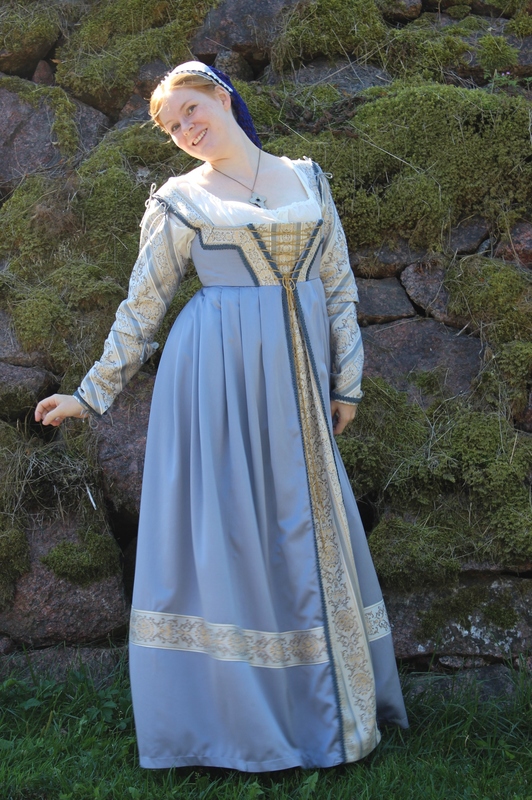 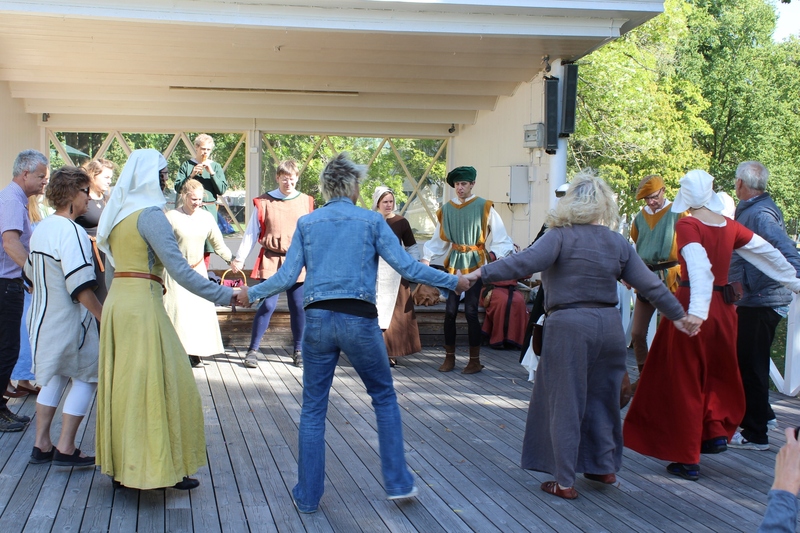 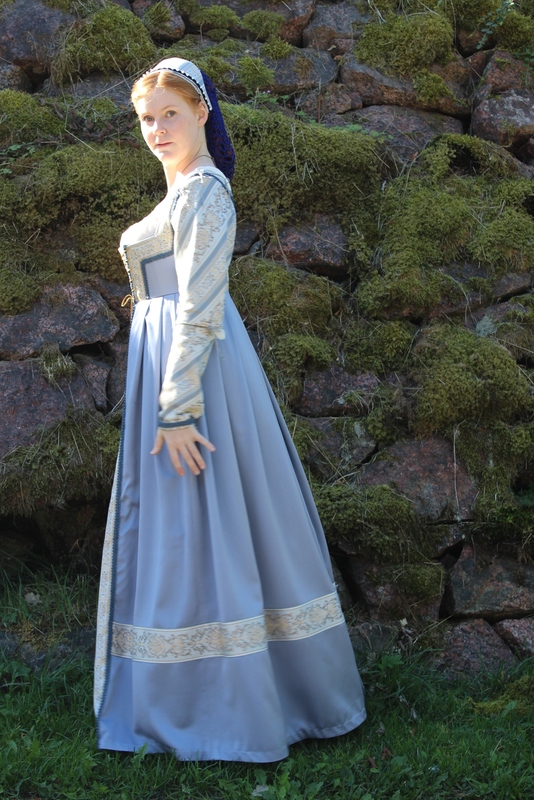 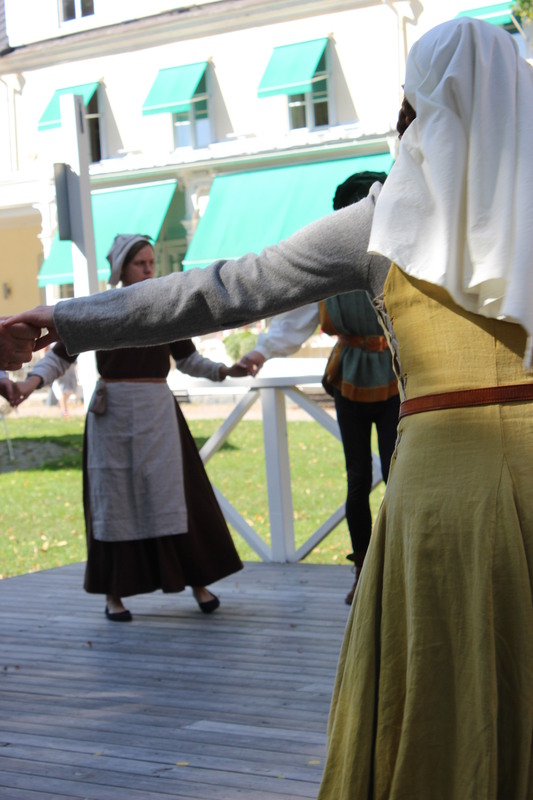 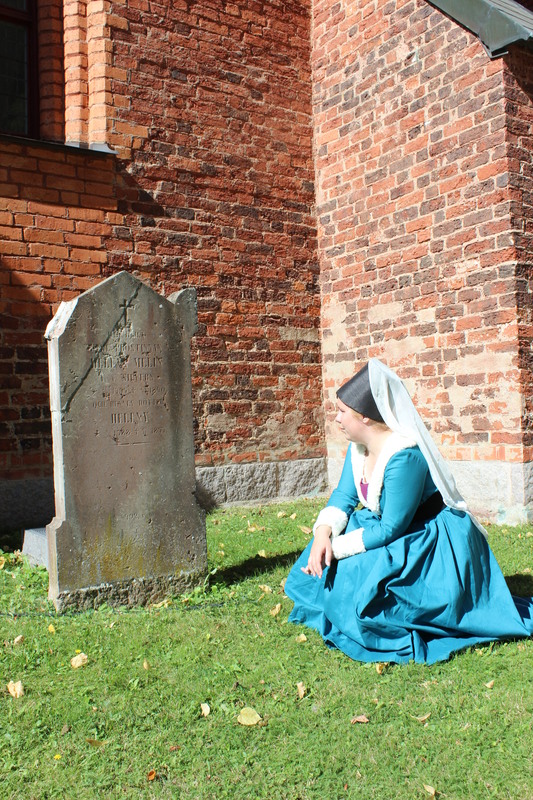 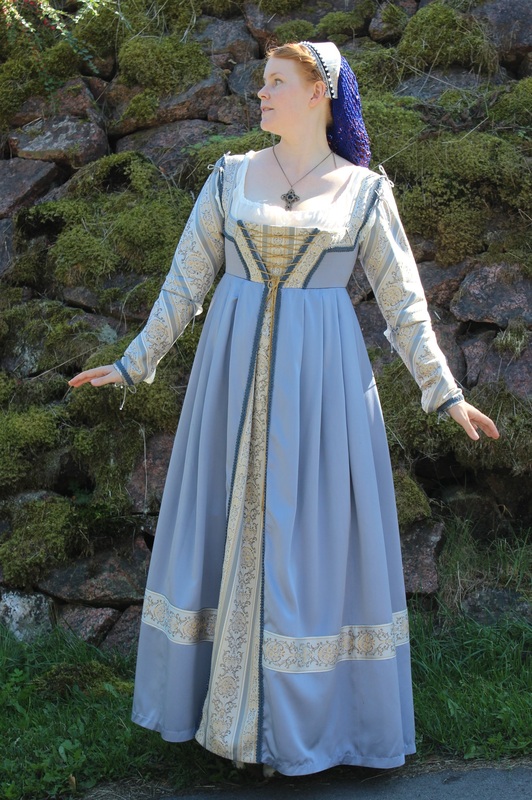 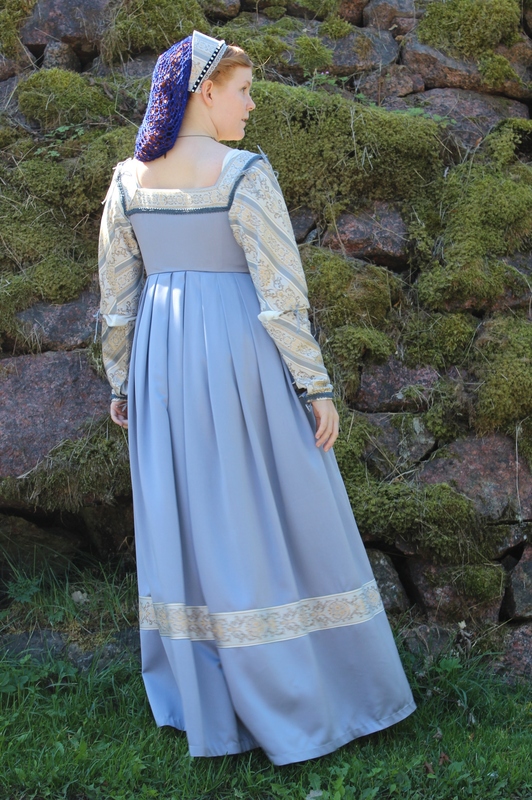 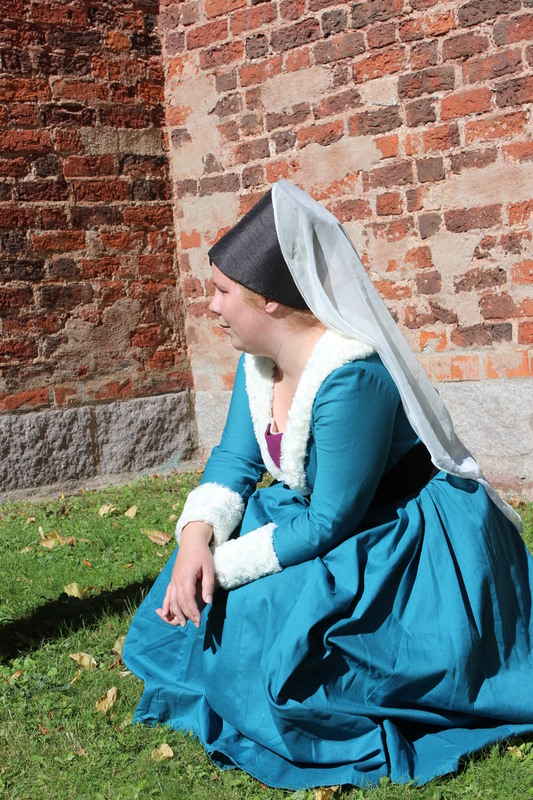 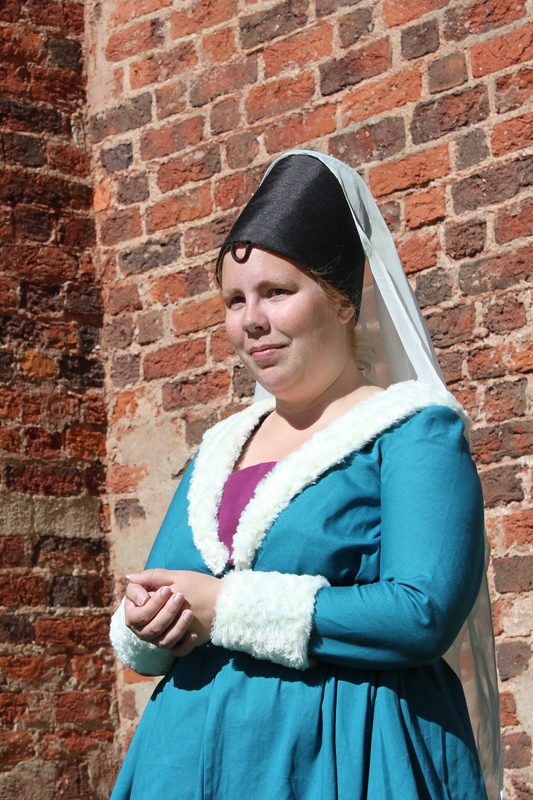 A few days after I finished my “Borgia dress” it was time for it’s first outing – To the yearly medieval fair in Söderköping. 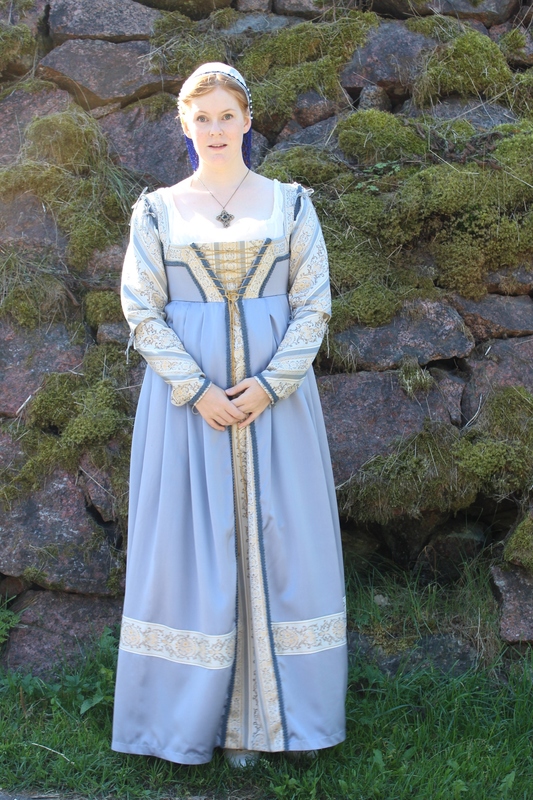 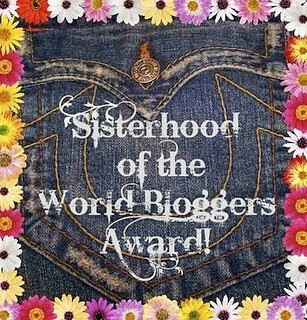 This year I had a hard time deciding whether or not I should go, and if I did, then in what way would I attend. 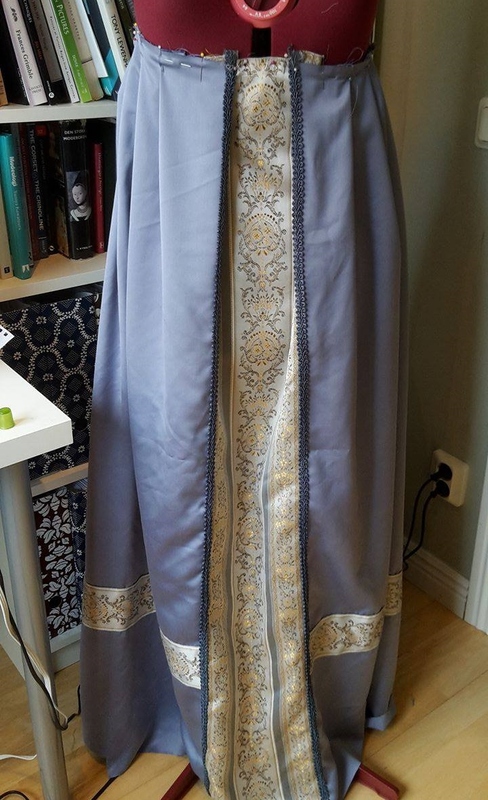 The first thing I needed to decide was If I should go at all, and should I then take him with me? 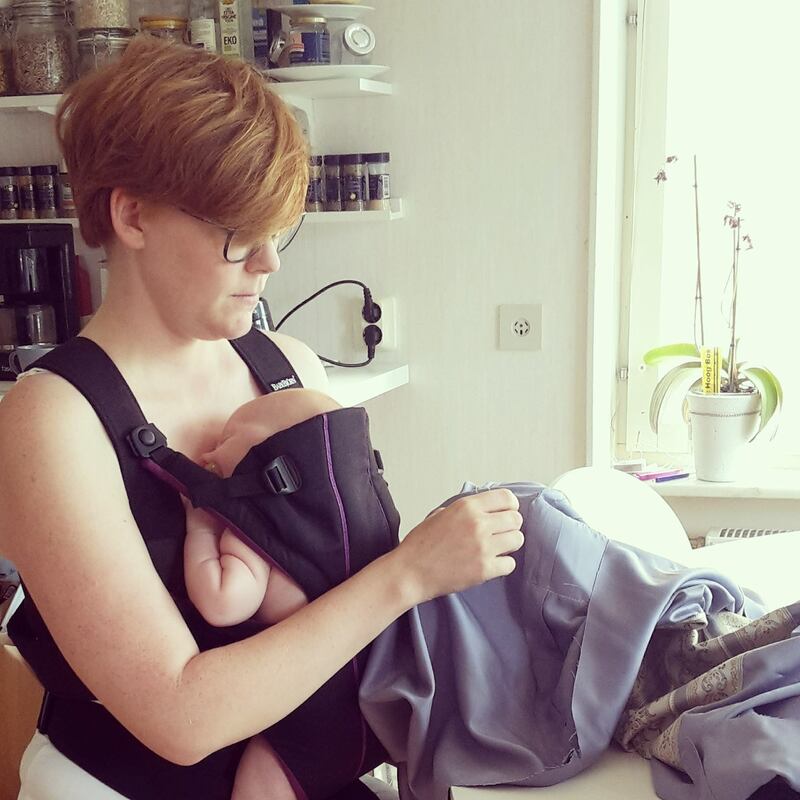 And If I took him, should I breastfeed or give him the bottle (this is the million dollar question when it comes to clothing decision), and would it be better to wear something old and easy to wash (because, baby spit) instead of my new princess gown? 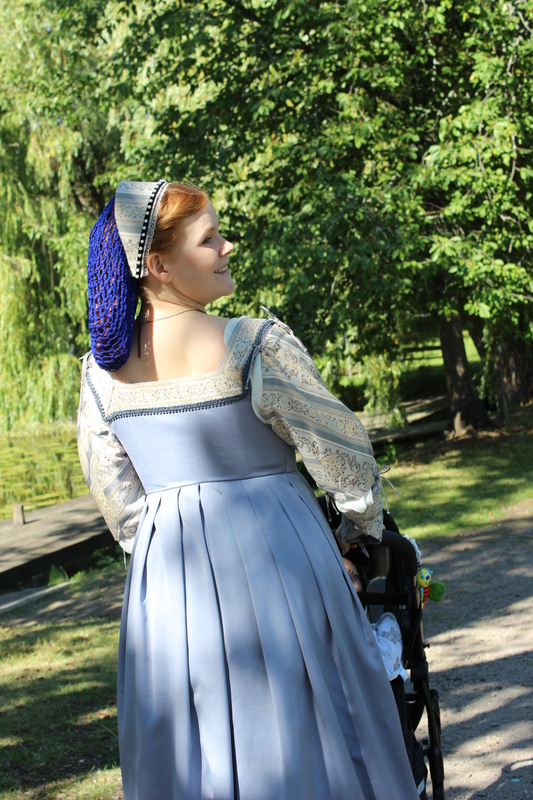 In the end the choosing was made easy by my boyfriend insisting he take the baby for the day and I go alone (well not alone, my sister was to come to). 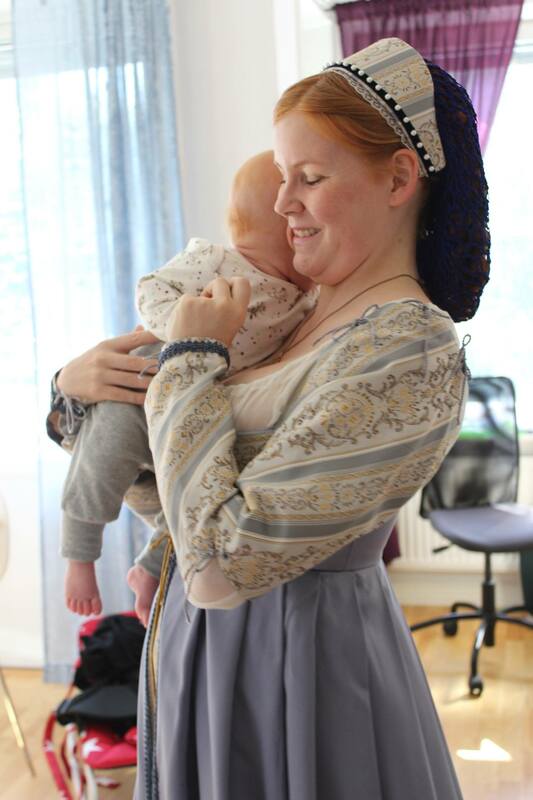 This was to be the longest time away from Charlie I ever been, so lets just say I was les then focused when dressing in my gown (New Borgia gown for the win, because – New dress :-)) and kissing my boys goodbye. 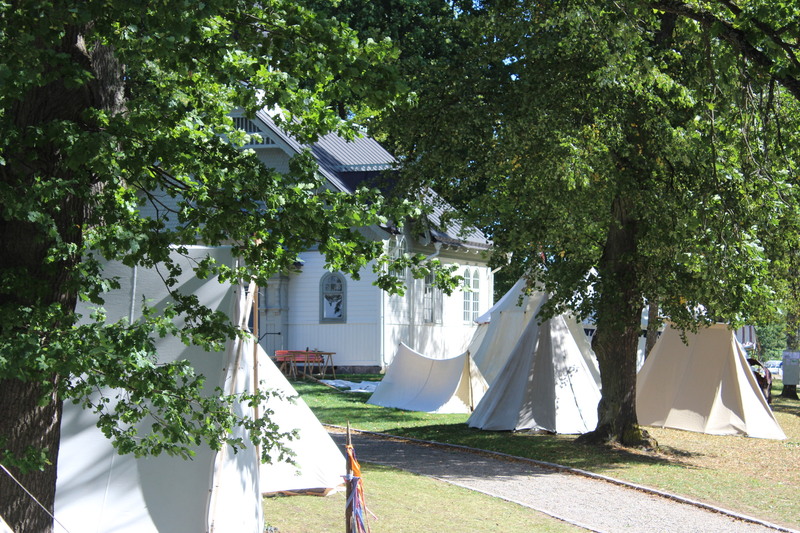 The familiar scenery of Söderköping. 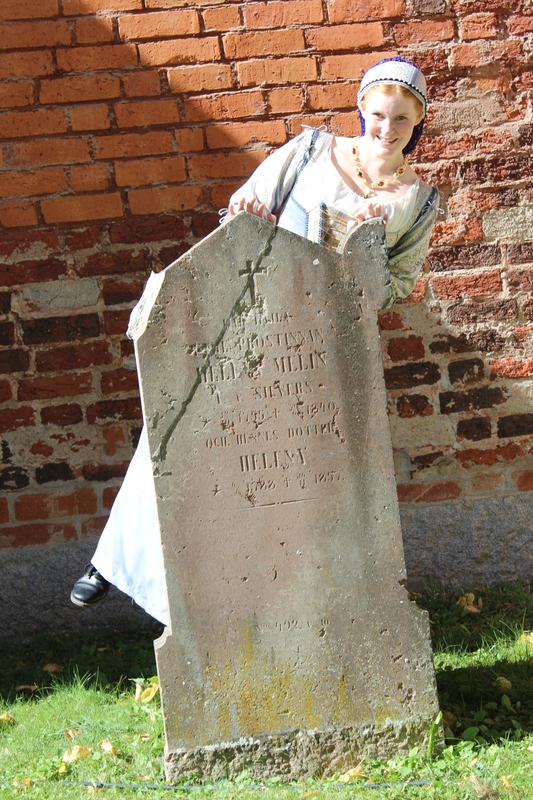 Ha ha, love this picture. 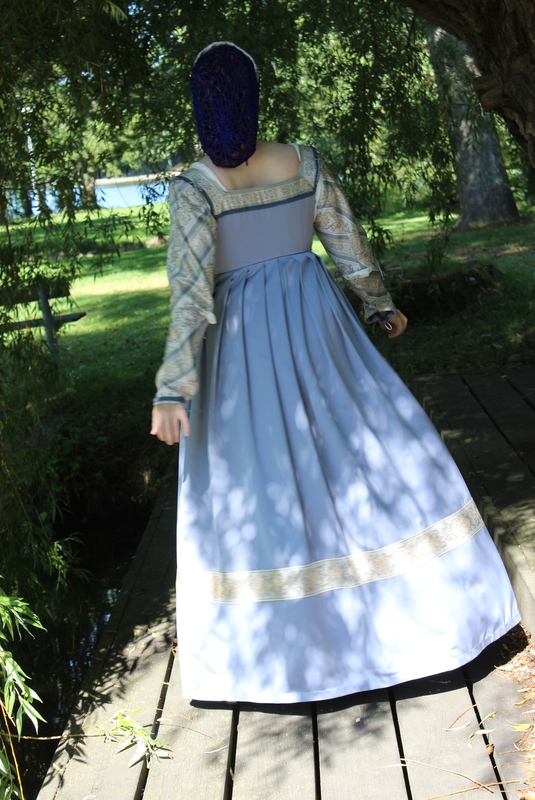 After the dance recital me and my sister took a walk around the market. 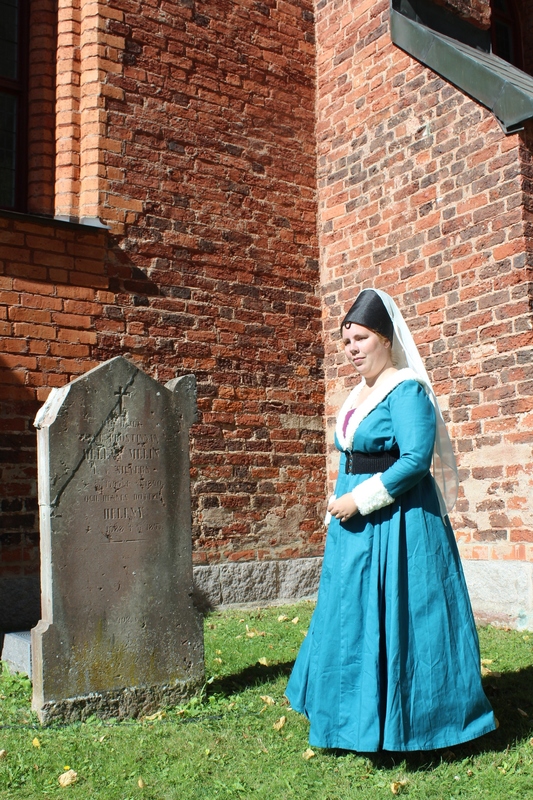 We also took a few minutes to take some pictures by the big church (while trying our best to ignore the other visitors taking our picture). 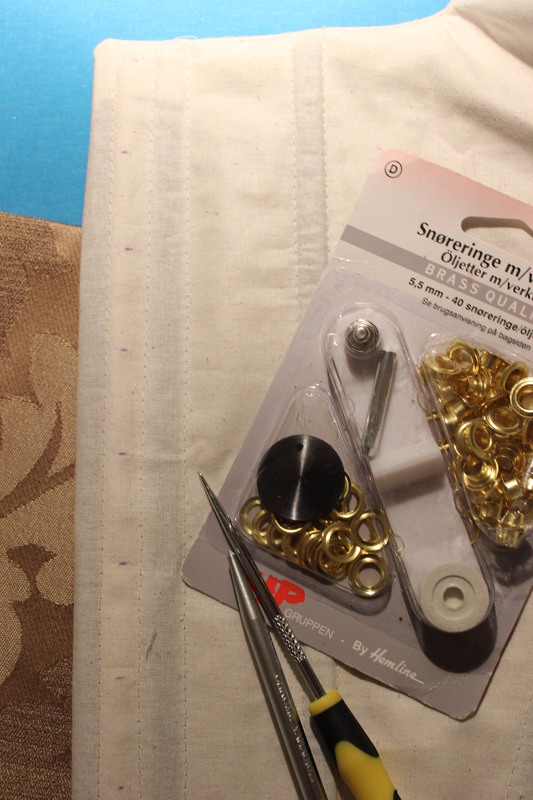 Before heading hoe we did a pit-stop at the fabulous fabric store, where I got lots and lots of cute baby fabrics.